The Dwarf Mistletoe Gurus! Frank Hawksworth (right) and Delbert Wiens (left), San Cristobal, Guatemala, February, 1975. Whole scene. Close-up. 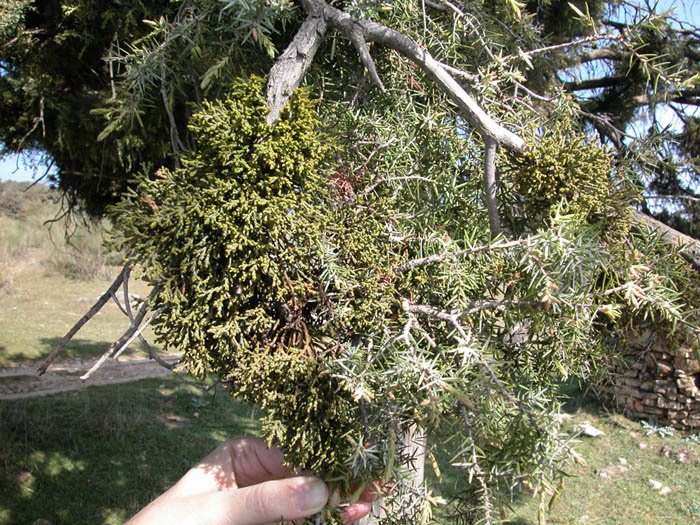 Photo Carpellate plant on Pinus contorta. Saguache Co., Colorado, USA. [DLN 1560]. Photo by D. L. Nickrent. Photo. 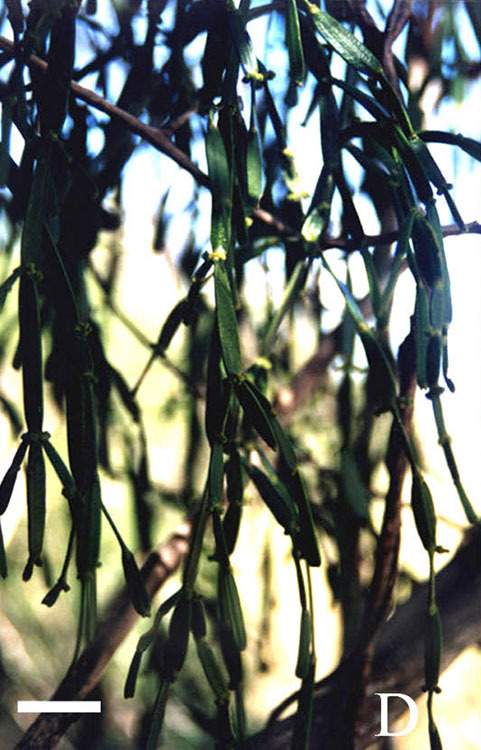 Carpellate plant with mature fruits. 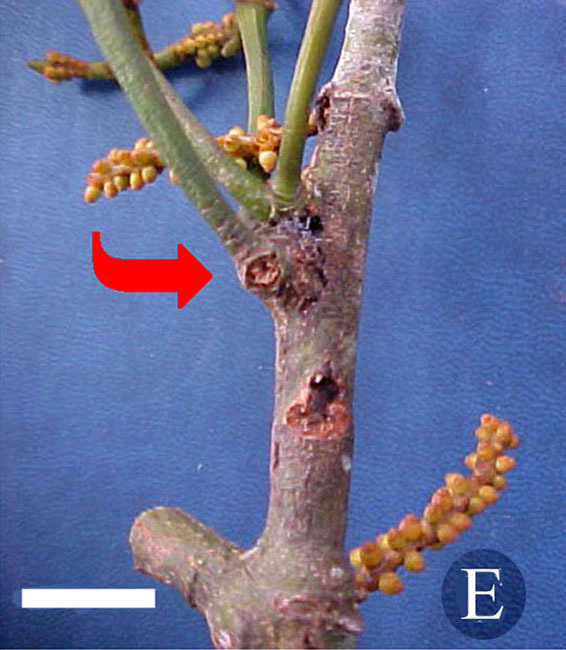 Arrow indicates verticillate branching. , Buckhorn Mt., Larimer Co. CO [DLN 1508]. Photo. 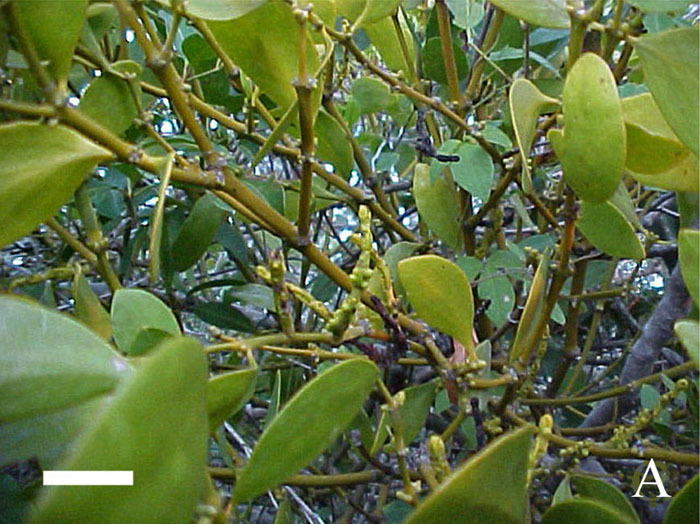 Closer view of carpellate plant with mature fruits. Arrow indicates pistillate flowers. Buckhorn Mt., Larimer Co. CO [DLN 1508]. Photo by D. L. Nickrent. Photo. 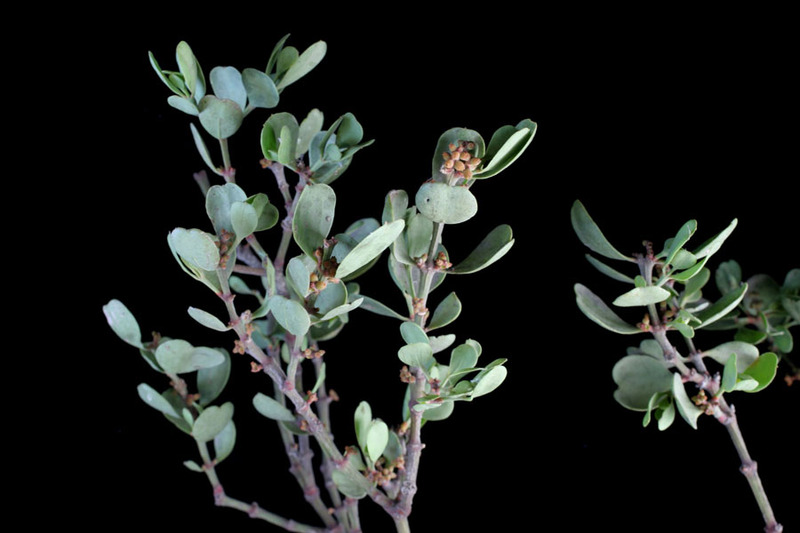 Carpellate plant (left) and immature staminate plant (right). 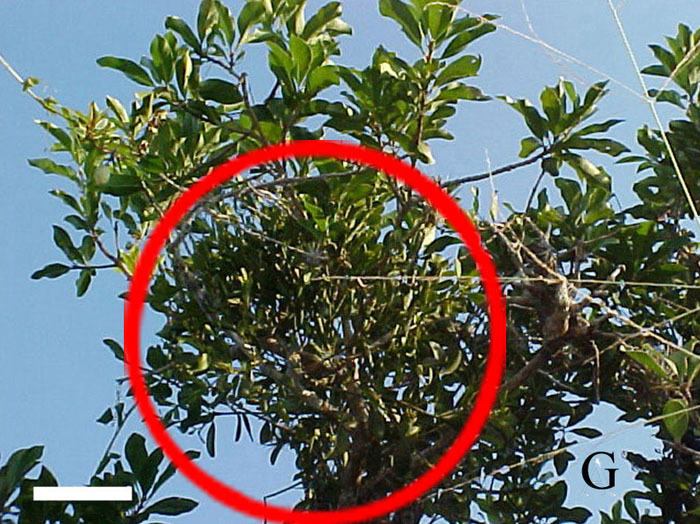 Arrow indicates verticillate branching on the staminate plant. Pennock Pass, Larimer Co. CO [DLN 1550]. Photo by D. L. Nickrent. 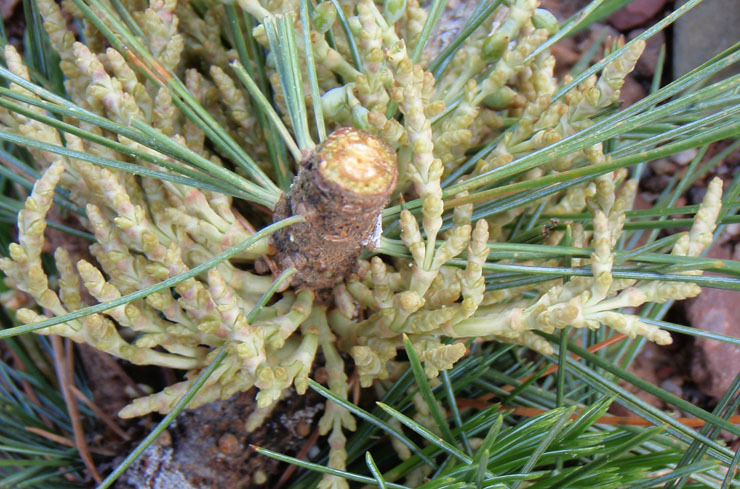 Photo Seed just after dehiscence, sticking to a host (Pinus contorta) needle. Larimer Co., Colorado, USA. [DLN 1508]. Photo by D. L. Nickrent. Photos. Showing wood sections with parasite endophyte. Link goes to PhytoImages. Photo Azore islands. Photo by Carlos Aedo Perez. 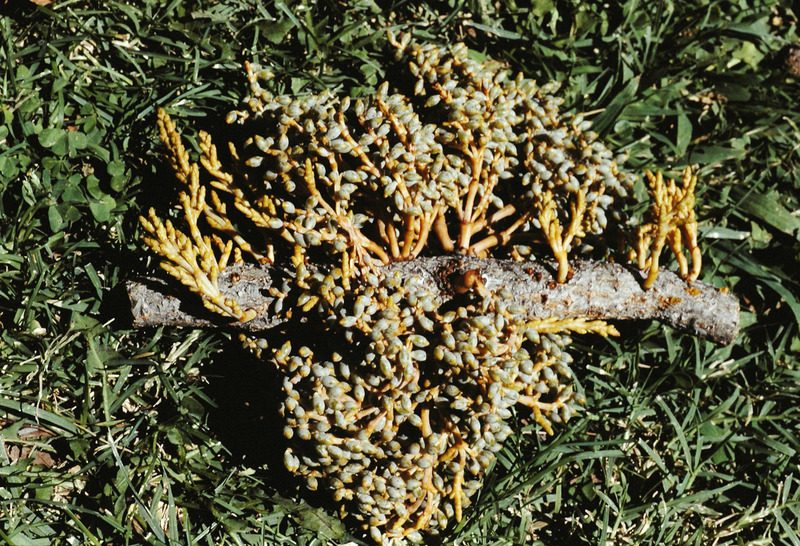 Arceuthobium campylopodum subsp. abietinum. NOTE: PhytoImages links at present only go to the species level. We hope to implement links to subspecific taxa soon. 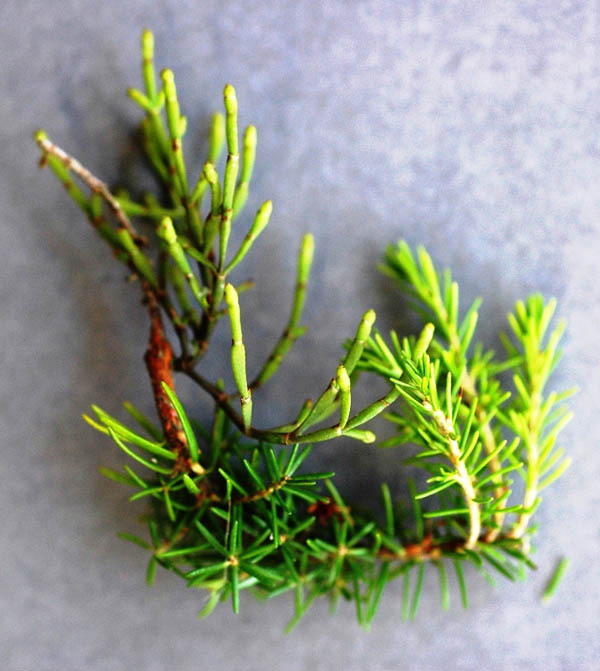 Photo Staminate plant on Abies magnifica. (= A. abietinum f. sp. magnificae; DLN 1910), Madera Co., California, USA. Photo by D. L. Nickrent. 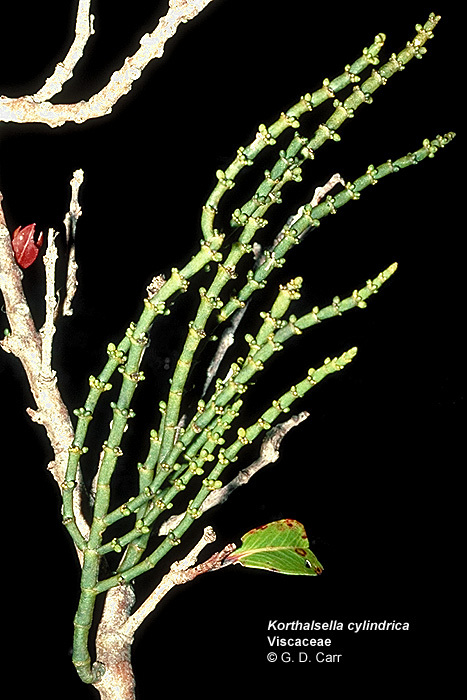 Staminate plant and close-up of shoots with flowers. Note variation in number of petals. 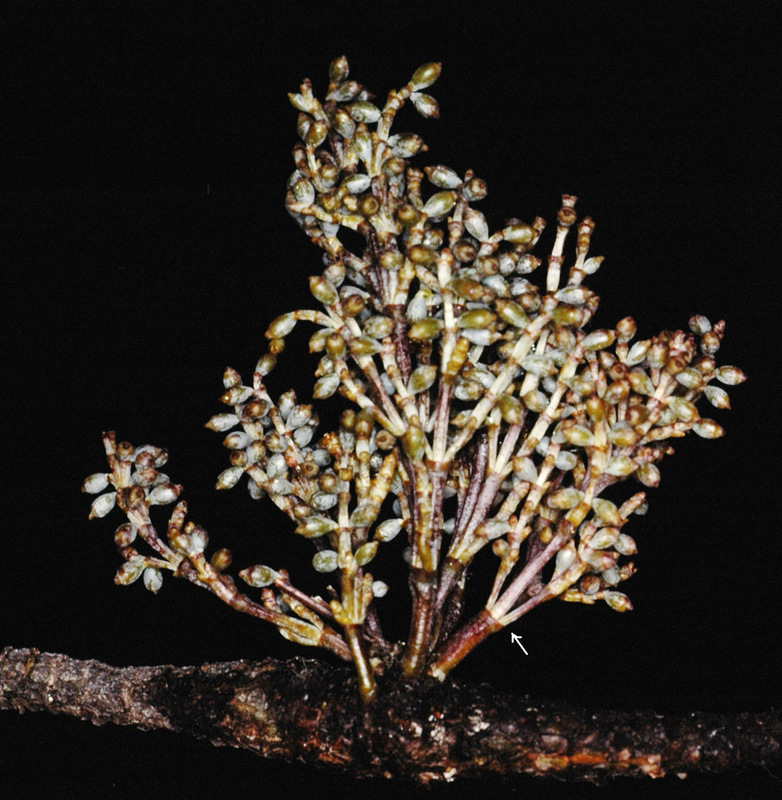 Pistillate shoots emerging from host, Pinus strobiformis and closer view of shoots with fruits. Carr Canyon, Huachuca Mts., Pima Co. AZ. Photos by R. L. Mathiasen. 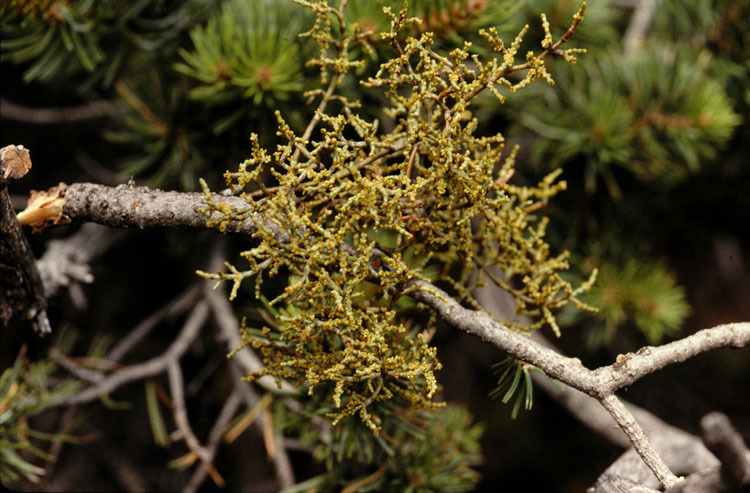 Photo Carpellate plant on Pinus jeffreyi. Placerville, California, USA. [DLN 2222]. Photo by D. L. Nickrent. 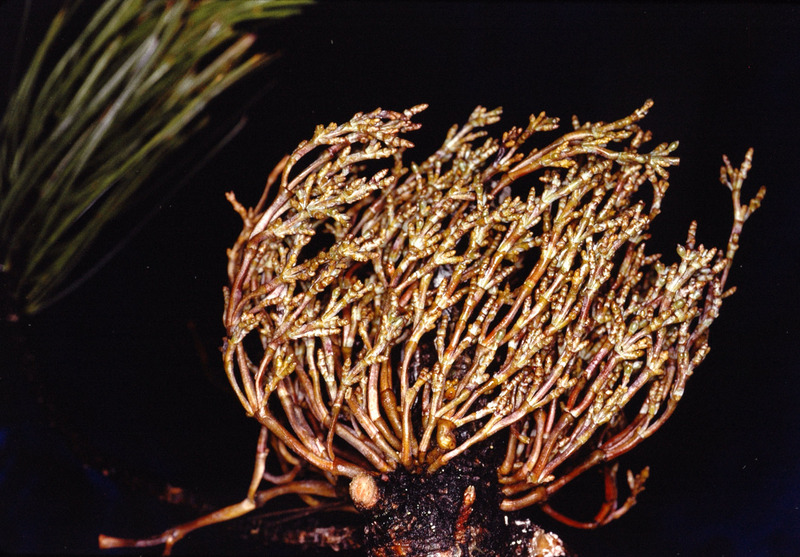 Photo Staminate plant on Pinus jeffreyi. Placerville, California, USA. [DLN 2222]. Photo by D. L. Nickrent. 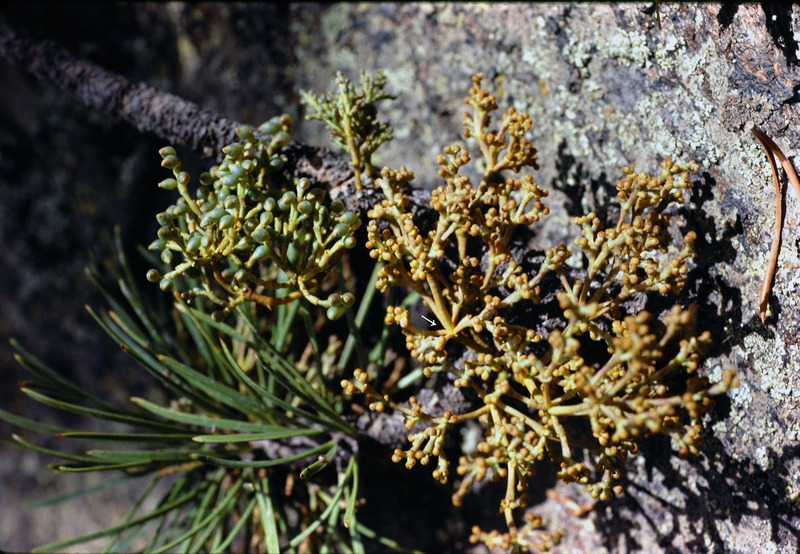 Photo Young staminate plant (left) and fruiting carpellate plant (right) on Pinus jeffreyi. Placerville, California, USA. [DLN 2222]. Photo by D. L. Nickrent. 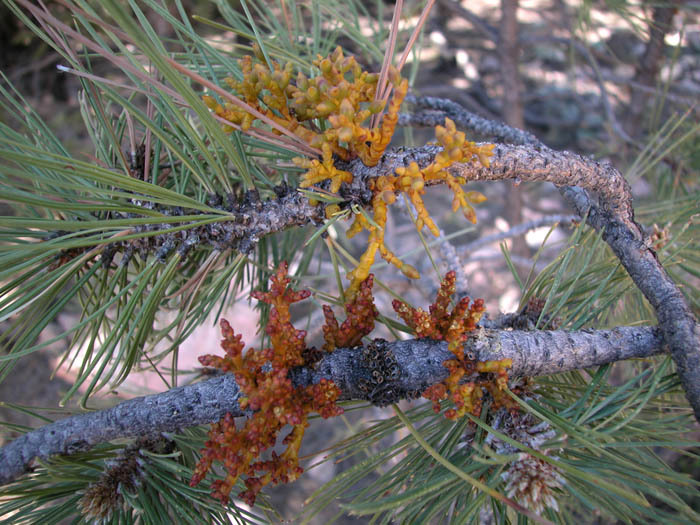 Photo Staminate plant (left) and carpellate plant (right) on Pinus ponderosa. (DLN 1570), Boulder Co., Colorado, USA. Photo by D. L. Nickrent. Photo. Double infection with A. vaginatum ssp. cryptopodum. Link goes to PhytoImages. 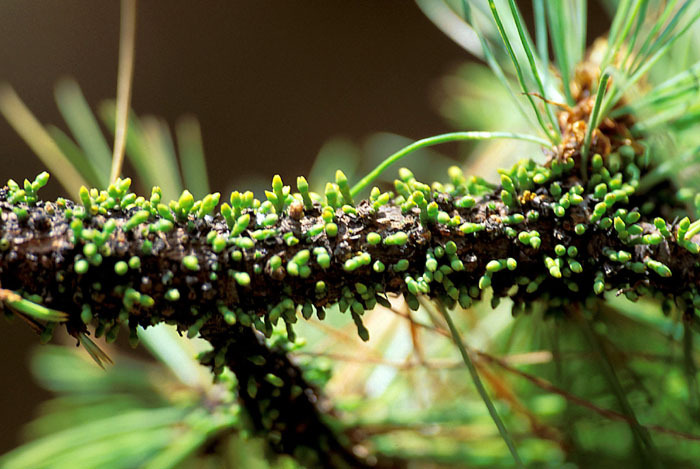 Photo Note the large, fusiform swelling of the branch of its host Pinus contorta ssp. contorta. (DLN 2664), Horne Lake, British Columbia, Canada. Photo by D. L. Nickrent. 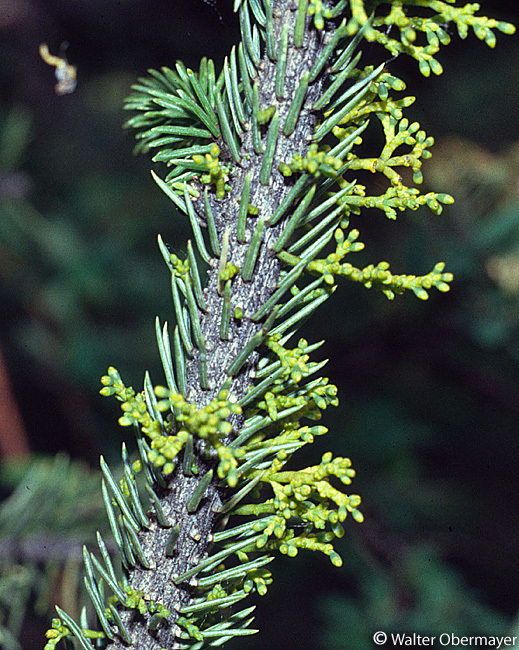 Photo Infection of three host trees: Abies lasiocarpa, Tsuga mertensiana and Pinus albicaulis. (DLN 2684), Lane Co., Oregon, USA. Photo by D. L. Nickrent. Photos. Link goes to Subject Database of Chinese Plants. 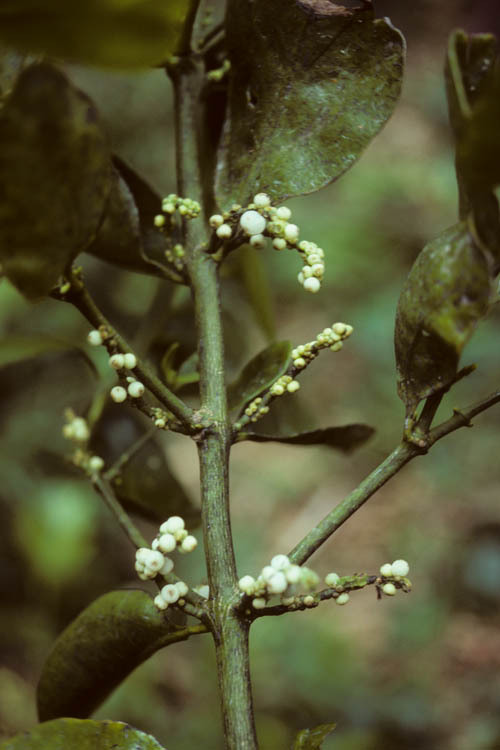 Staminate plant in flower and pistillate plant with fruits. Pecos, NM. Photos by D. L. Nickrent. 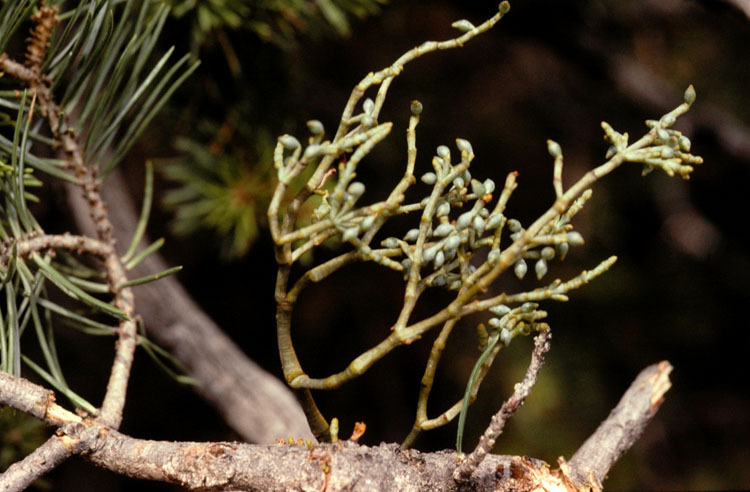 Pinus monophylla branches with mistletoe, pistillate plant with fruits, color variations. North of Baldwin Lake, San Bernardino Co, CA. [DLN 1897]. Photos by D. L. Nickrent. Staminate plant, closer view of staminate shoots with flowers, staminate shoot in hand, pistillate plant, pistillate shoot in hand. Mt. Withington, Socoro Co. NM. [DLN 1623]. Photos by D. L. Nickrent. One view and another of fruiting shoots. 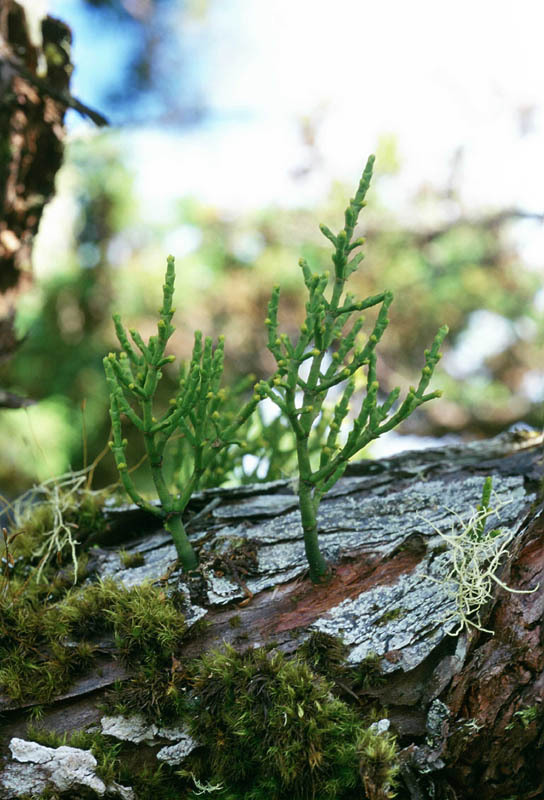 Parasitic on Pseudotsuga menziesii. Mt. Herman, El Paso Co. CO [DLN 1556]. Photos by D. L. Nickrent. Photo. 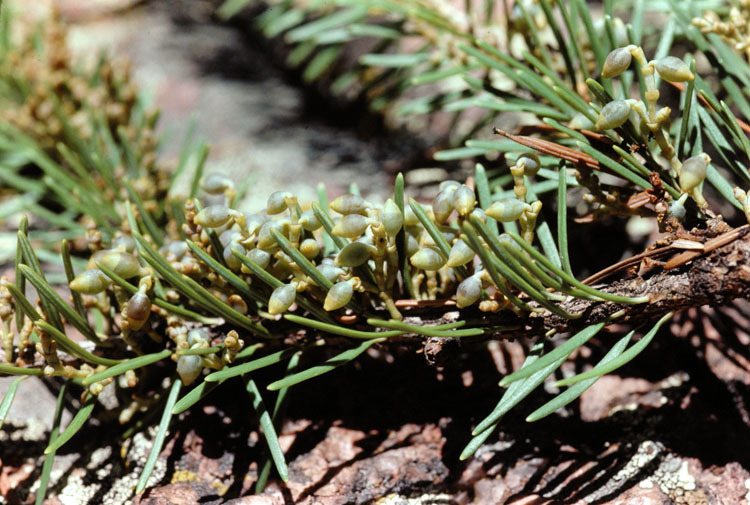 Host branches (Pseudotsuga) with severe systemic infections of Douglas fir dwarf mistletoe. Mt. Withington, Socoro Co. NM [DLN 1627]. Photo by D. L. Nickrent. Photo. Maroon colored shoots with fruits. Bear Wallow, Santa Catalina Mts., Pima Co. AZ. [DLN 1941]. Photo by D. L. Nickrent. Photo. Purple colored shoots with fruits. Pinalenos Mts., AZ. [DLN 1949]. Photo by D. L. Nickrent. Photo. 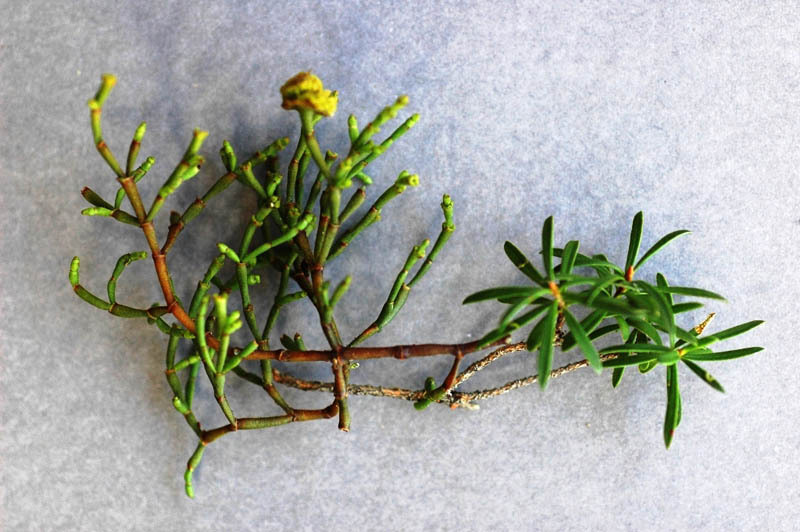 Pseudotsuga showing the different developmental stages of mistletoe corresponding to growth increments of host branches. Cerro Potosi, Nuevo Leon, Mexico [DLN 1984]. Photo by D. L. Nickrent. 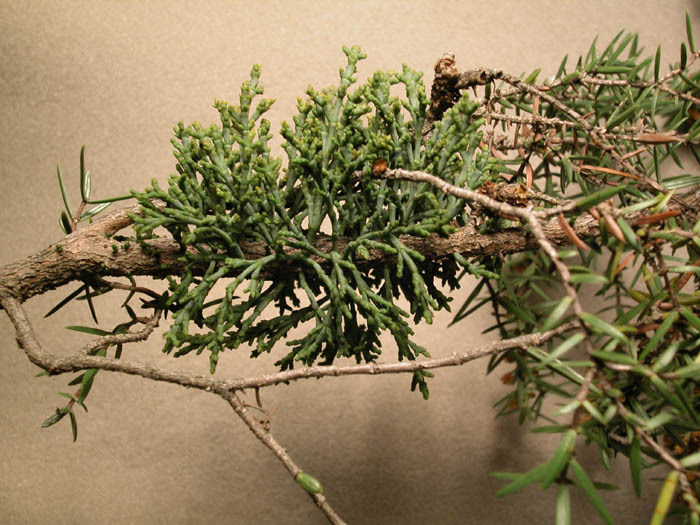 Host branch with staminate shoots and young pistillate shoots. Johnson Mesa, Santa Fe National Forest, Sangre de Cristo Mountains NM. Photos by D. L. Nickrent. 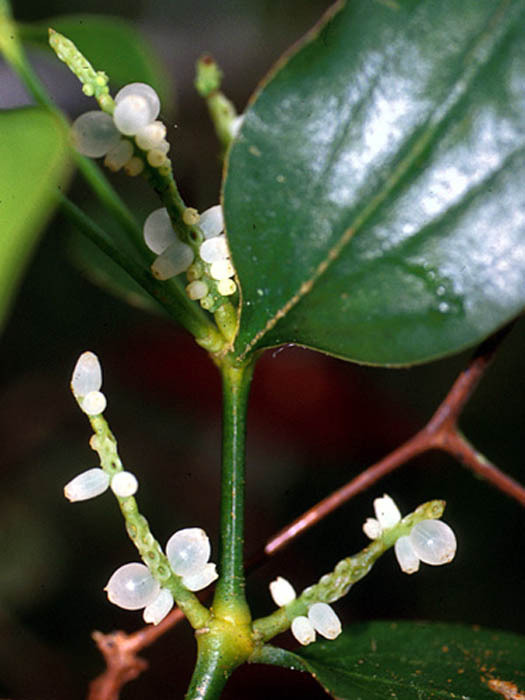 Staminate shoots infecting host stem and close-up of staminate shoot in flower. Photos by D. Wiens. 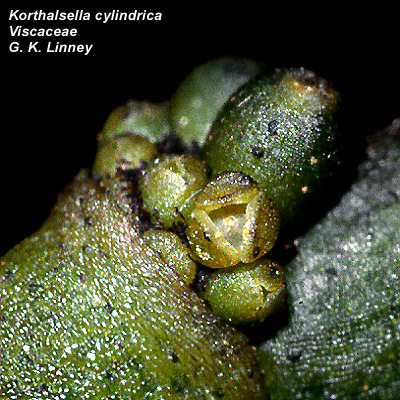 Plant with fungal hyperparasite Caliciopsis (Wallrothiella) arceuthobii. 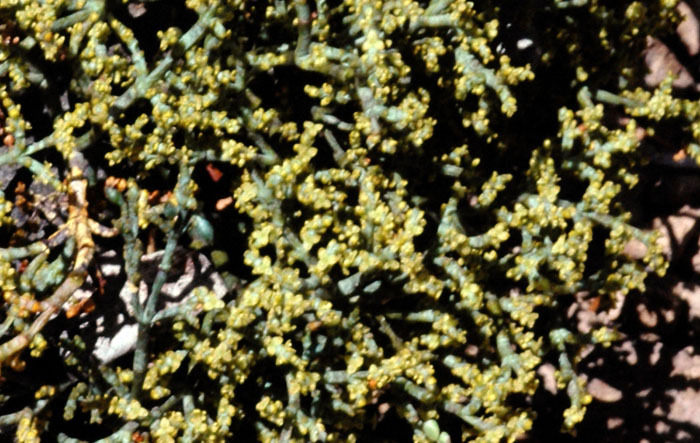 In this close-up, note the black stroma that contain perithecia on the stigmatic surface of these pistillate flowers. Sandia Mts., Sandoval Co., NM. Photo by D. L. Nickrent. 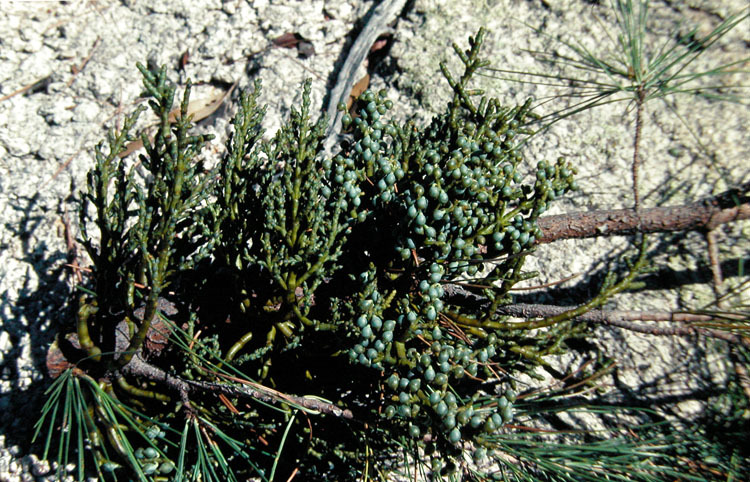 Photo Plant attached to stem of host, Pinus leiophylla var. chihuahuana. Bear Canyon, Santa Catalina Mts., Arizona. Photo by D. L. Nickrent [DLN 1938]. Photo Closer view of carpellate plants with fruits. Bear Canyon, Santa Catalina Mts., Arizona. Photo by D. L. Nickrent [DLN 1938]. Photo Fruiting stem in hand. Pima County, AZ. Photo by D. L. Nickrent [DLN 1663]. Photo Parasitic on Pinus wallichiana. Bhutan. Photo by Gerhard Glatzel. Photo on p. 228 of Agricultural Handbook 709. Photo on p. 228 Agricultural Handbook 709. 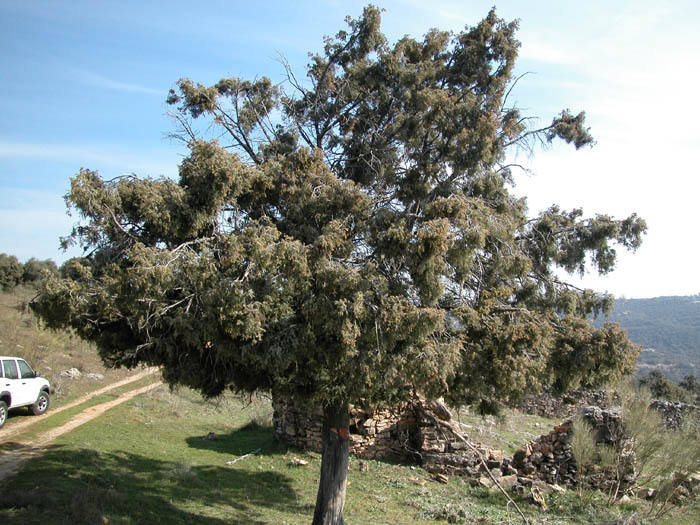 Host tree, Juniperus oxycedrus, infected with Arceuthobium oxycedri. San Agustin de Guadalix, north of Madrid, Spain. Photo by D. L. Nickrent. 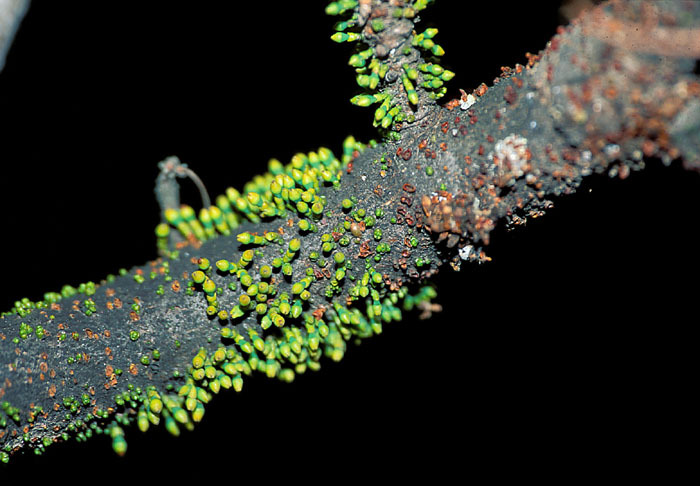 Photo Close-up of infection on host branch. San Agustin de Guadalix, north of Madrid, Spain. Photo by D. L. Nickrent. Photo. 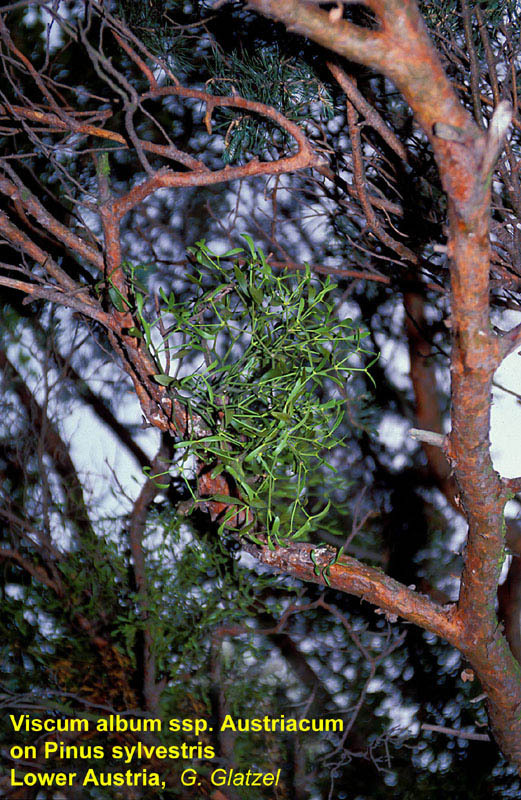 Habit of mistletoe on host tree, Juniperus oxycedrus. San Agustin de Guadalix, north of Madrid, Spain. Photo by D. L. Nickrent. 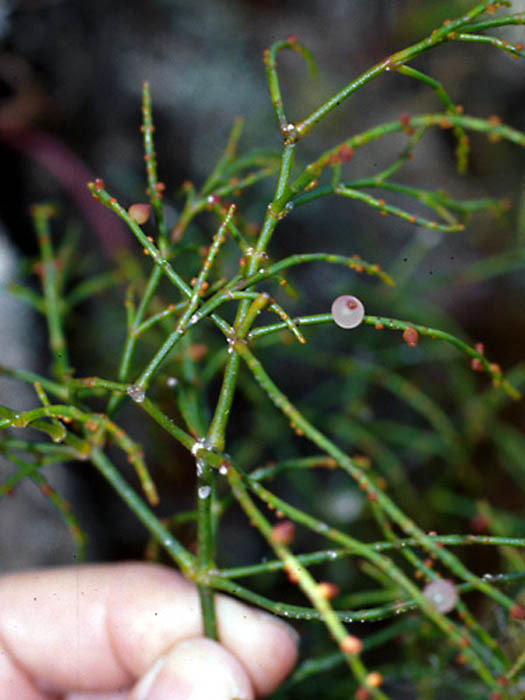 Photo Globose, young infection on host tree, Juniperus oxycedrus. San Agustin de Guadalix, north of Madrid, Spain. Photo by D. L. Nickrent. Photo. Infection on host branch. San Agustin de Guadalix, north of Madrid, Spain. Photo by D. L. Nickrent. 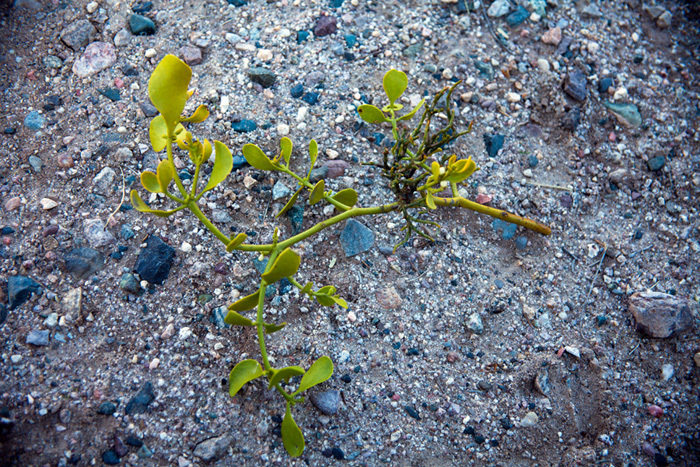 Photo Close-up of young shoots. San Agustin de Guadalix, north of Madrid, Spain. Photo by D. L. Nickrent. Photos. 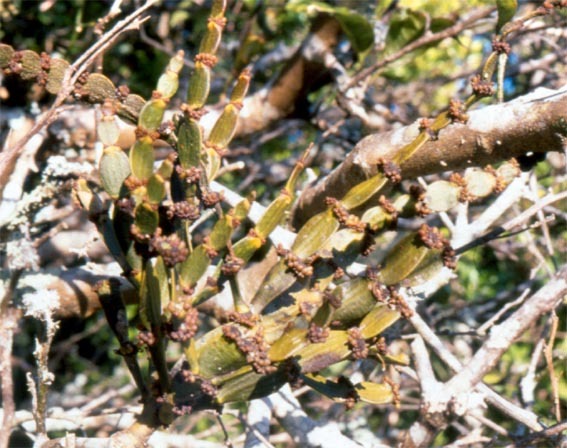 Mistletoe shoots on host branches. Lahaul-Spiti, Himachal Pradesh, India. Photo by Krishan Lal. Link goes to Flowers of India. Photo. 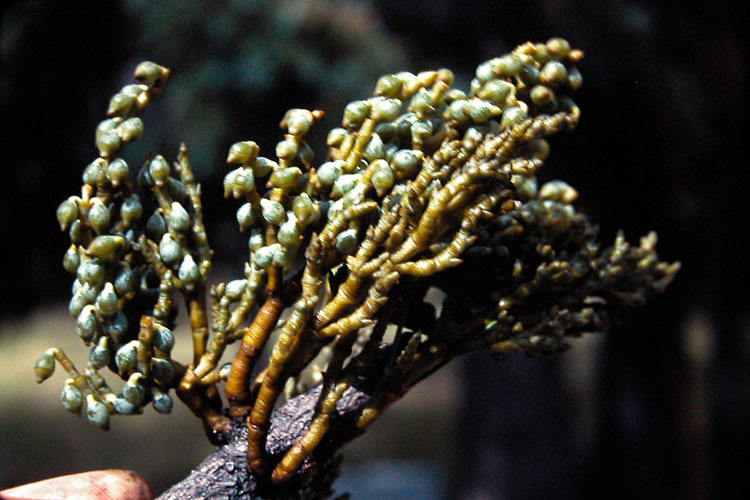 Habit of the mistletoe parasitic on Pinus yunnanensis, Baimaxueshan Nature Reserve in Northwest Yunnan, China. Photo by Cyril Greuter. Photo Link goes to PhytoImages. Photo. Fruiting shoots. Link goes to Subject Database of Chinese Plants. 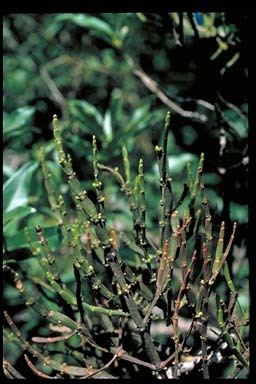 Photo Carpellate plants. China, Tibet, prov. Sichuan, Shalui Shan Mts., 30 km NE of Batang, S of Yidun, 30°16'N/99°25'E, 3800 m alt., 25 June.1994. Photo by Walter Obermayer. Photos. Link goes to PhytoImages (all subspecies at present). 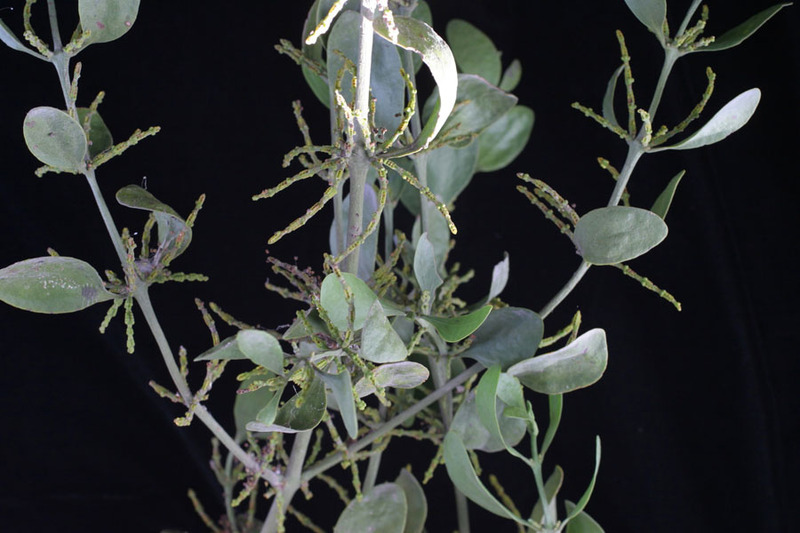 Photo Shoots of the western US mistletoe emerging months after a greenhouse inoculation of the host (Pinus ponderosa var. scopulorum). Photo by D. L. Nickrent. Photo. 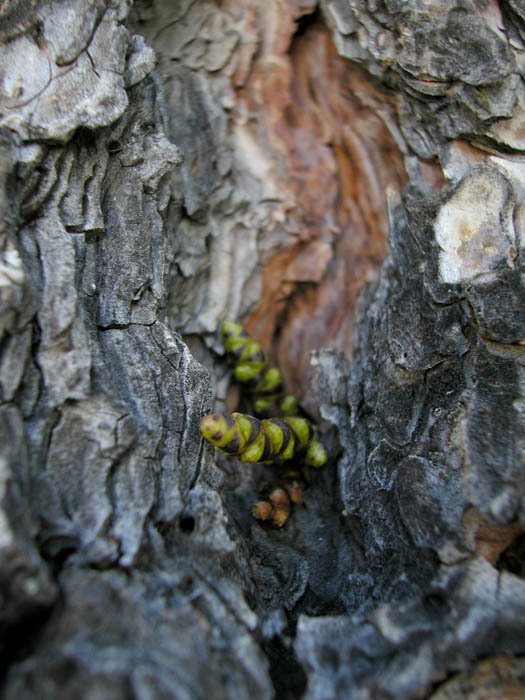 Young mistletoe shoots emerging from bark on main bole of Pinus ponderosa var. scopulorum. 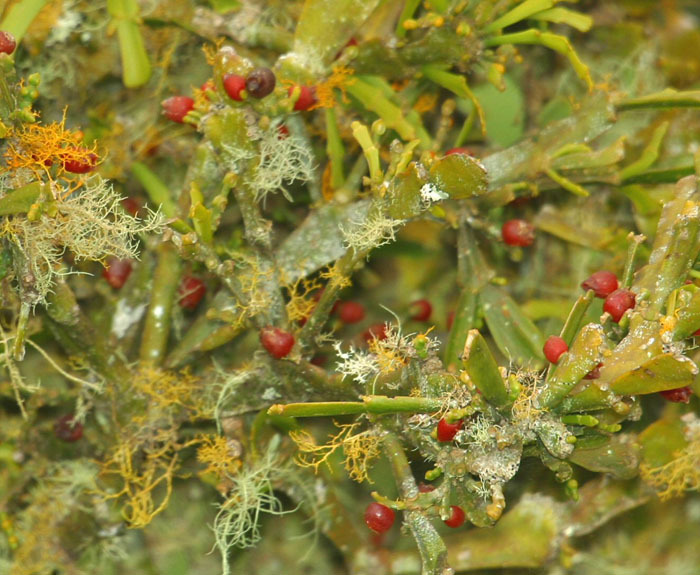 This shows how the mistletoe tissue can be latent and later emerge following disturbance (crack in bark, etc.). S of Tres Lagunas, along Rt. 63, N of Pecos, NM. Photo 3 June 2004 by D. L. Nickrent. Photo. 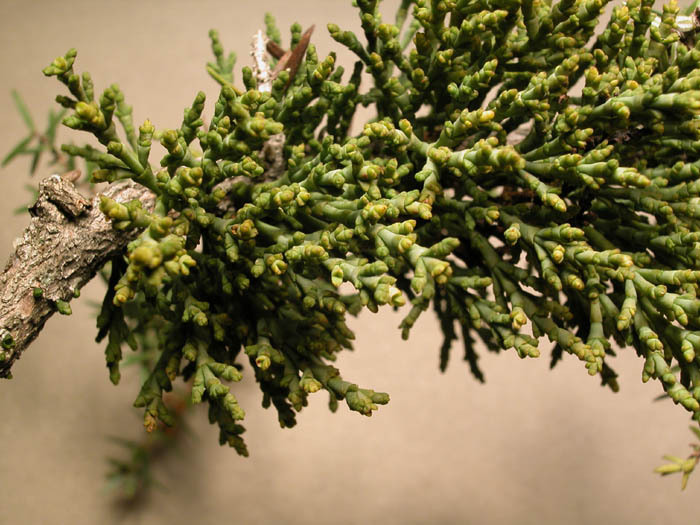 Carpellate (above) and staminate (below) shoots of the mistletoe emerging from host (Pinus ponderosa var. scopulorum). Santa Fe National Forest, Johnson Mesa, Sangre de Cristo Mountains. Photo 2 June 2004 by D. L. Nickrent. Photo. 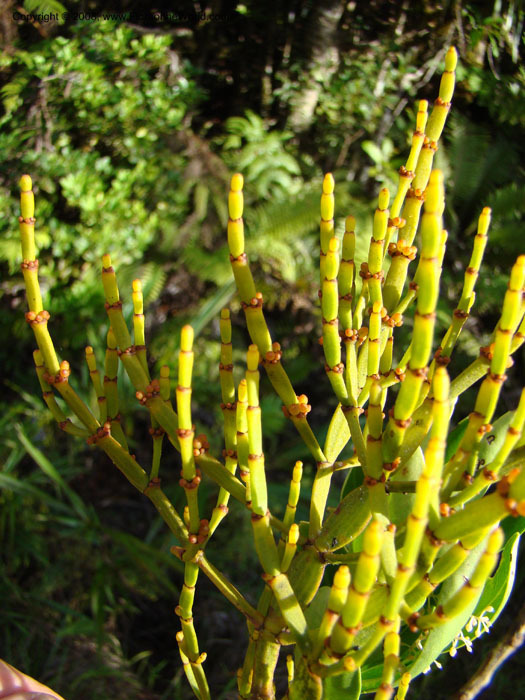 Close-up of staminate shoots. Note the variation in flower merousity; 3- and 4-merous flowers can be seen. Santa Fe National Forest, Johnson Mesa, Sangre de Cristo Mountains. Photo 2 June 2004 by D. L. Nickrent. 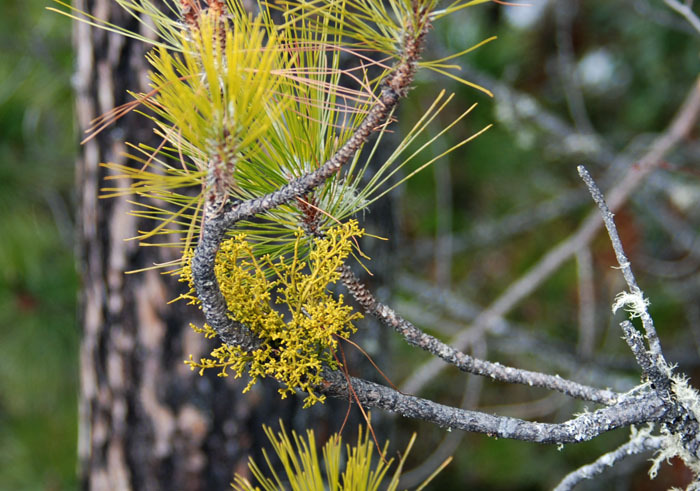 Photo Seedling with holdfast parasitizing a host pine (Pinus ponderosa var. scopulorum) under greenhouse conditions. Durango, Mexico. Photo by D. L. Nickrent. 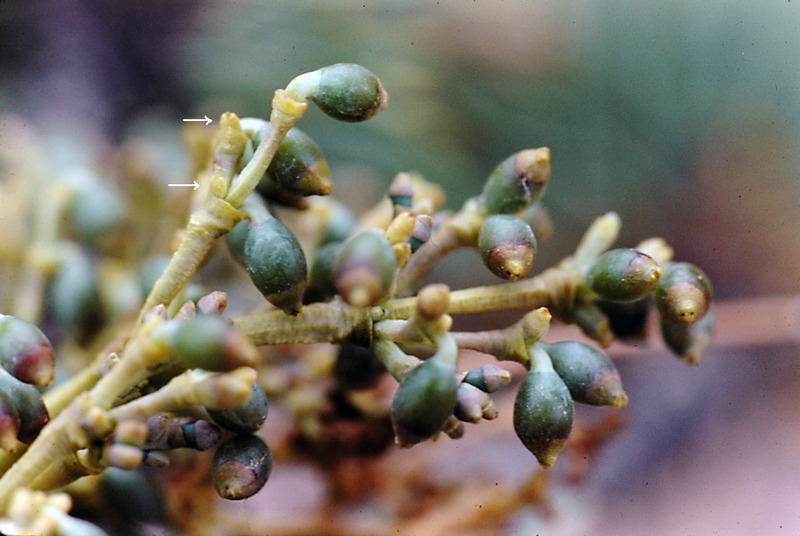 Photo Carpellate plant showing the explosive dehiscence of the seed from the shoot. Durango, Mexico. Photo by Ken Robertson. 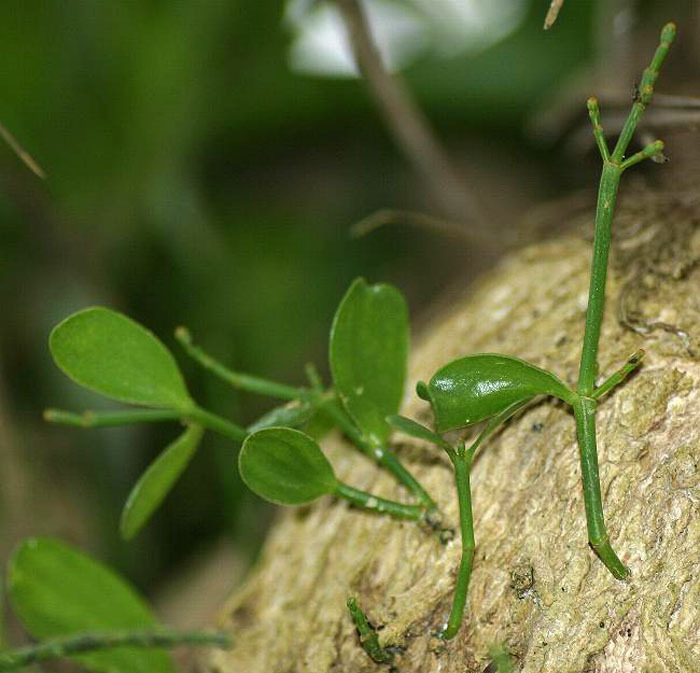 Photo Plants being disarticulated by leaf-cutter ants (Atta mexicana). Durango, Mexico.Photo by D. L. Nickrent. Illustration of leaf-cutter ants (Atta mexicana) and Arceuthobium durangense by D. L. Nickrent. Click HERE to see the Golden Bough paper on this interesting association. 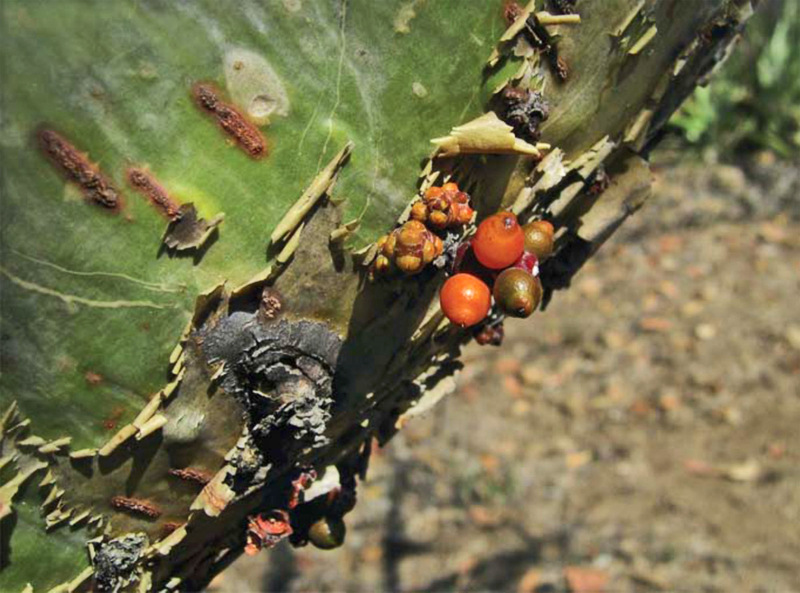 Photo Seeds of this Mexican taxon without (left) and with (right) viscin coat. Note bubbles formed by photosynthesizing endosperms. [DLN 1980]. Photo by Ken Robertson. Photo in Chapter 16, p. 258 in Agricultural Handbook 709. Photo 1 and photo 2. Cuba. From Neotropical Live Plant Photos. Photo IDs 26982, 26983. Photos by Robin Foster. Photo Ecuador. From Neotropical Live Plant Photos. Photo ID 10932. Photo by Robin Foster. Photo1, Photo2. 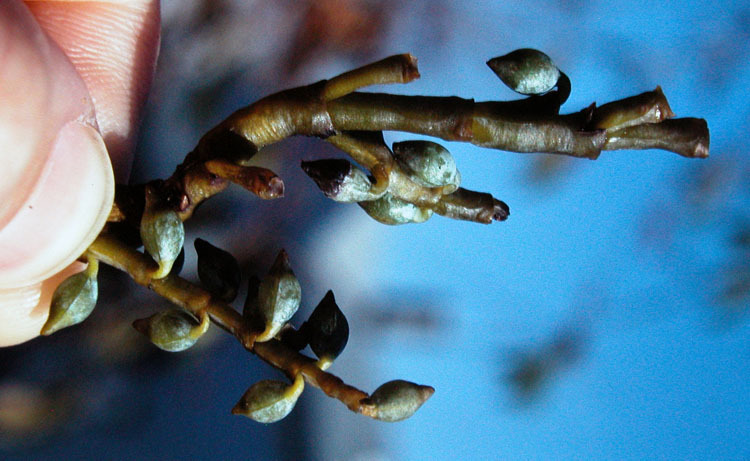 Flowering and fruiting shoots. San Jose Prov., Dist. Dota, San Geraldo, Costa Rica. Photo by Mauricio Bonaficino, June 17, 2004. Photos. Fruiting shoots. Puntarenas, Puntarenas, Costa Rica. Santamaría & Monro 8695. Link goes to TROPICOS. 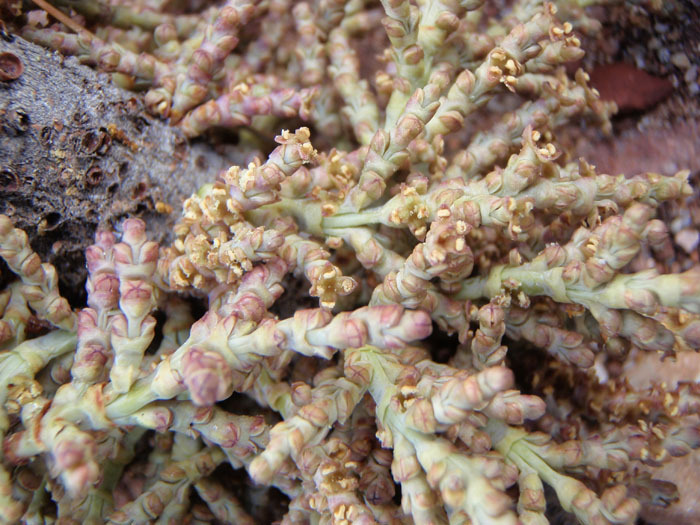 Photo 1 showing plant habit and Photo 2 close-up of infructescence. Along ridge leading to Río Teribe, Bocas del Toro, Panama. Sandra Knapp & Alex K. Monro no. 5228. Link goes to TROPICOS. Photos. Slopes of Cerro Itamut near camp 1, 12.1 km NE (straight line) of Estación Pittier, Bocas del Toro, Panama. Sandra Knapp & Alex K. Monro no. 9868. Link goes to TROPICOS. Photos. Fruiting shoots. Limón, Costa Rica. Monro et al. 7085. Link goes to TROPICOS. Photo Shoots with young inflorescence. Costa Rica, Volcan Poás. Photo by Mauricio Bonaficino, July 8, 2004. Photo Shoots with mature and maturing fruits. Costa Rica, Volcan Poás. Photo by Mauricio Bonaficino, July 8, 2004. Photo Mature, flattened fruits. Costa Rica, Volcan Poás. Photo by Mauricio Bonaficino, July 8, 2004. Photos. NE of camp 2, along ridge leading to Río Teribe, Bocas del Toro, Panama. Sandra Knapp & Alex K. Monro no. 9924. . Link goes to TROPICOS. Photo. South slopes of Cerro Itamut, Bocas del Toro, Panama. Sandra Knapp & Alex K. Monro no. 9976. Link goes to TROPICOS. Photos. Parque Internacional La Amistad,, Costa Rica. Monro et al. 7226. Link goes to TROPICOS. Photo. Páramo Santa Inés, Antioquia, Colombia. A. Guarin (4283). Link goes to TROPICOS. Photo. Perú. From Neotropical Live Plant Photos. Photo ID 14265. Photo by Robin Foster. 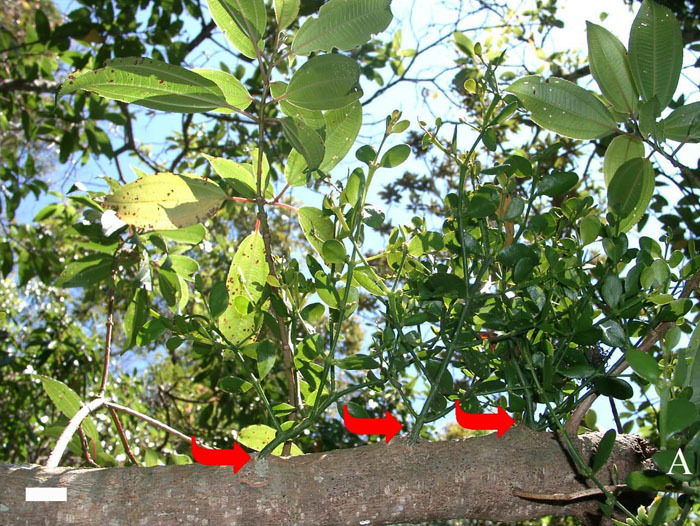 Habit of mistletoe parasitic on Tibouchina (arrows, bar = 3 cm) and close-up of fruiting shoot (bar = 3 cm). Figure 37 from Reif (2007). English translation of the thesis available HERE. Photo. 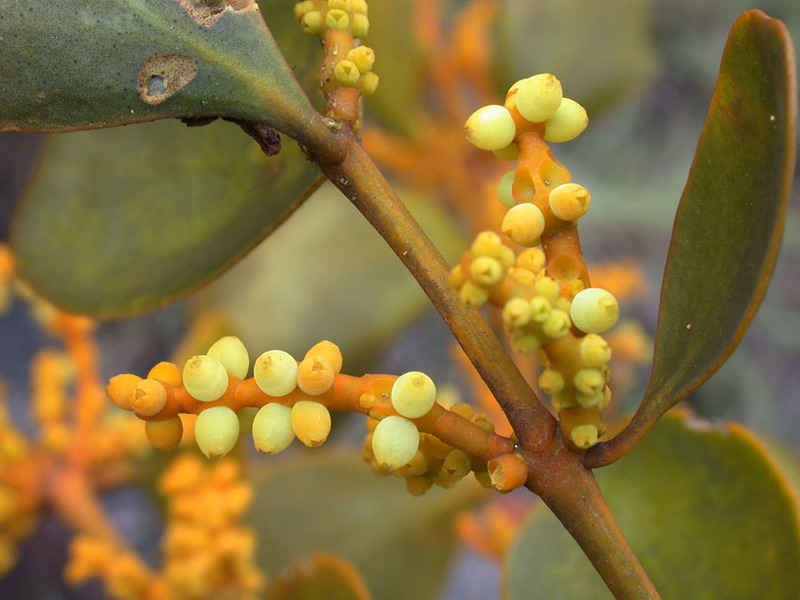 Close-up of inflorescences with young fruits. Puerto Rico, Municipio of Sabana Grande, 30 June 1991, James S. Miller & Chris D. Sherman 6615. Link goes to TROPICOS. 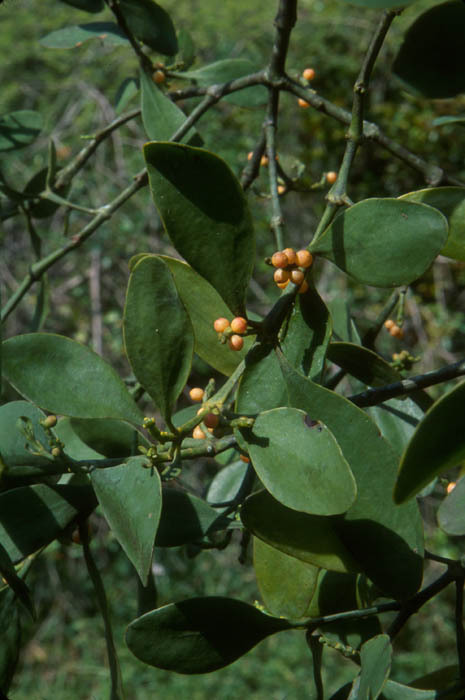 Habit of mistletoe on host branch. Camuy Caverns Park, Camuy, NW Puerto Rico. From Father Sanchez's Web Site of West Indian Natural History. Photo. Fruiting shoots. Panama. From Kuijt & Harrison (2015. Phytologia 97:139-144). Photos. Ecuador. David A. Neill - 15884. Link goes to TROPICOS. Photo. Cerro Neblina Valle de Titricó, N of Pico Phelps Amazonas, Venezuela. Photo by T. Croat, voucher 59546. From TROPICOS image library MO. Photo. Ecuador. From Neotropical Live Plant Photos. Photo ID 11743. Photo by Robin Foster. Photos. Fruiting shoots. Montane forest, La Suiza Vieja, Peru. Van der Werff et al. 22855. Link goes to TROPICOS. Photos. Fruiting shoots. Cloud forest and puna vegetation, Along trail Milpo to Sta. Barbara, Peru. Van der Werff et al. 23158. Link goes to TROPICOS. Photo. Above Hardwar Gap, St. Andrew, Jamaica. Photo by A. Gentry, voucher no. 28325. Link goes to TROPICOS. 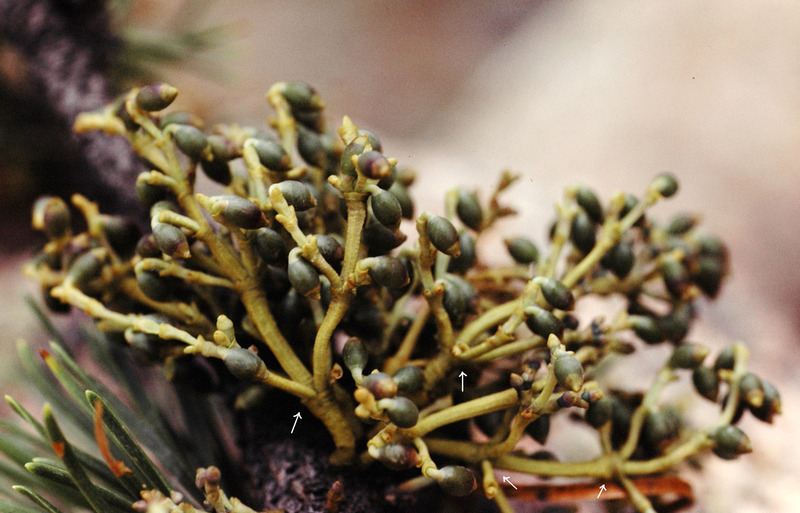 Photo of the mistletoe shoots, photo of the stem base, and photo of fruiting shoots covered with lichens. Blue and John Crow Mountains National Park, east-central Jamaica. From Father Sanchez's Web Site of West Indian Natural History. Photo. Perú. From Neotropical Live Plant Photos. Photo ID 23558. Photo by Robin Foster. Photo. Perú. From Neotropical Live Plant Photos. Photo ID 23563. Photo by Robin Foster. Photo. Flowering shoots. Panama. From Kuijt & Harrison (2015. Phytologia 97:139-144). Photo. Inflorescences. Panama. From Kuijt & Harrison (2016. Phytologia 98(2):142-145). Photo. Flowering shoot. Bolivia, La Paz, Murillo. James Solomon 19048. Link goes to TROPICOS. 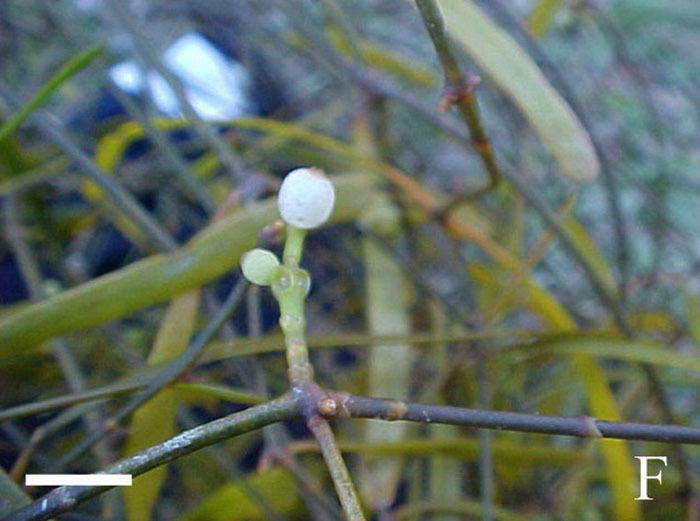 Photo of young mistletoe shoots emerging from host branch. Camuy Caverns Park, Camuy, NW Puerto Rico. From Father Sanchez's Web Site of West Indian Natural History. Photos. 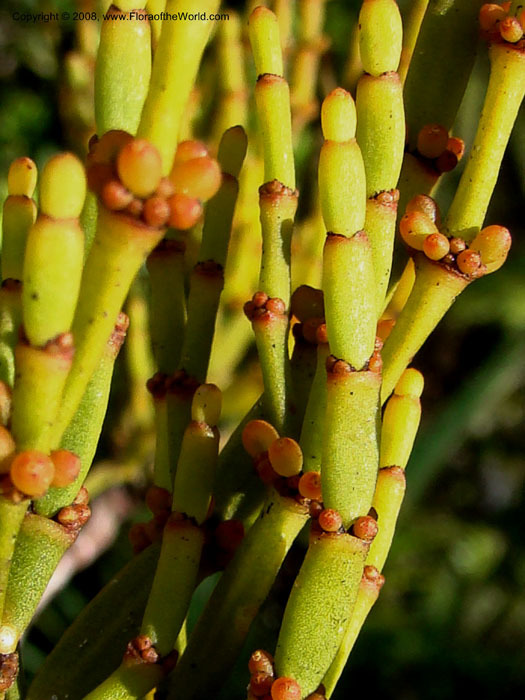 Mistletoes with flowering and fruiting spikes. Slopes of Cerro Itamut, Bocas del Toro, Panama. Sandra Knapp & Alex K. Monro 9869. Link goes to TROPICOS. Photos. 12.3 km NE of Estación Pittier, SE slopes of Cerro Itamut, ridge above small quebrada running between Itamut and El Pyramide, Bocas del Toro, Panama. Sandra Knapp & Alex K. Monro no. 10010. Link goes to TROPICOS. 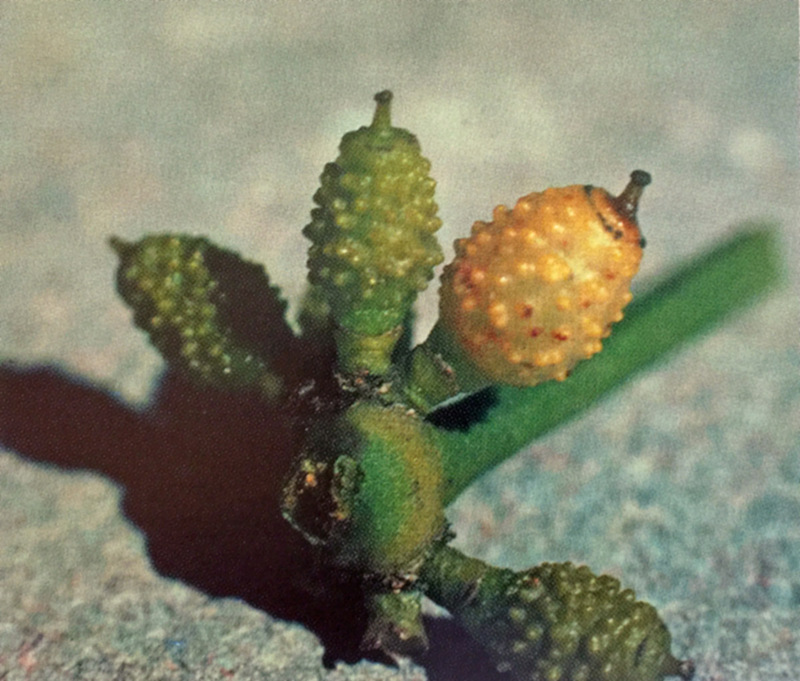 Photo of plant in fruit. Costa Rica. Photo by Ronald Jones. Link goes to PhytoImages. Photograph of isotype. Link goes to New York Botanical Garden. Photo Shoots. New Zealand. Photo by Dave Norton. 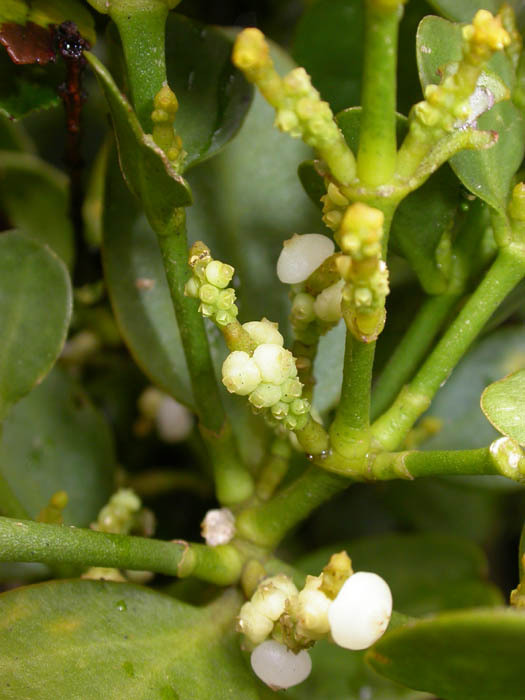 Flowering shoots, close-up of flowers. 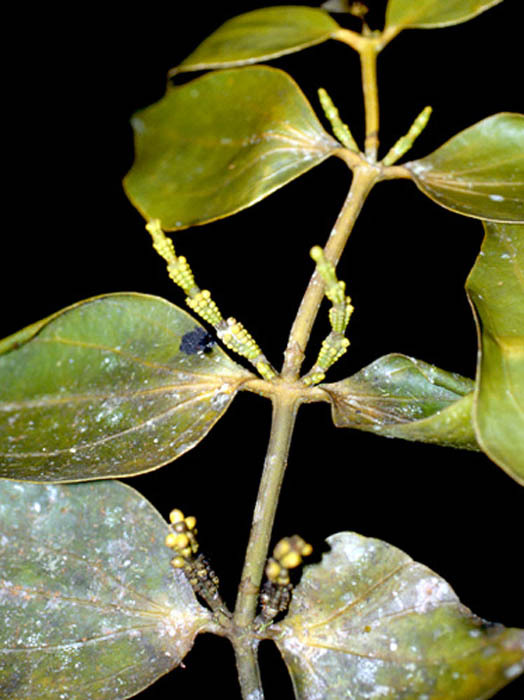 Link goes to University of Hawaii Vascular Plant Families. 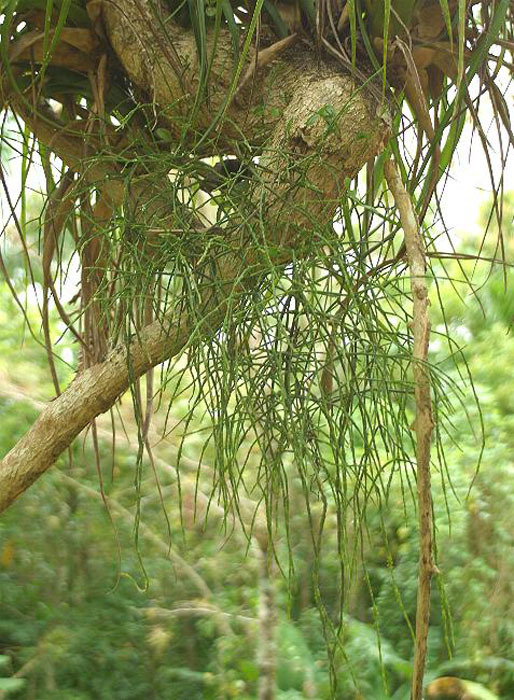 Photo Habit of plant. Norfolk Island (between New Zealand and New Caledonia). Photo by Peter Bannister. 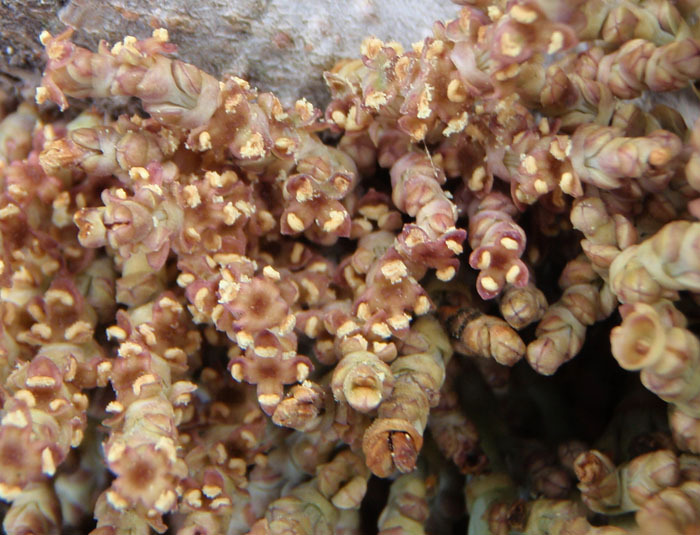 Photos of shoots and close-up of fruiting shoots. Mandjelia, New Caledonia. Photo 13 Nov. 2007 by C. Davidson (coll. J. Munzinger 4752). From FloraoftheWorld.org. 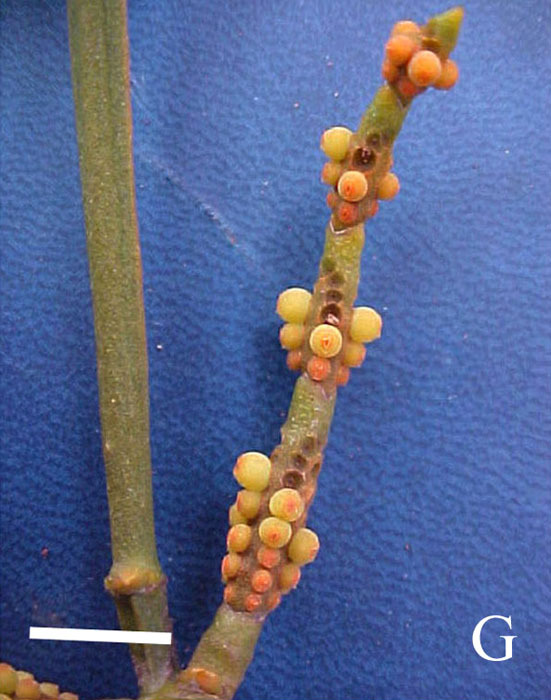 Photo Close-up of stem, photo close-up of fruits. Link goes to Australia National Botanic Gardens. Photo. New Caledonia. Link goes to TROPICOS. Photo Habit. Link goes to Australia National Botanic Gardens. 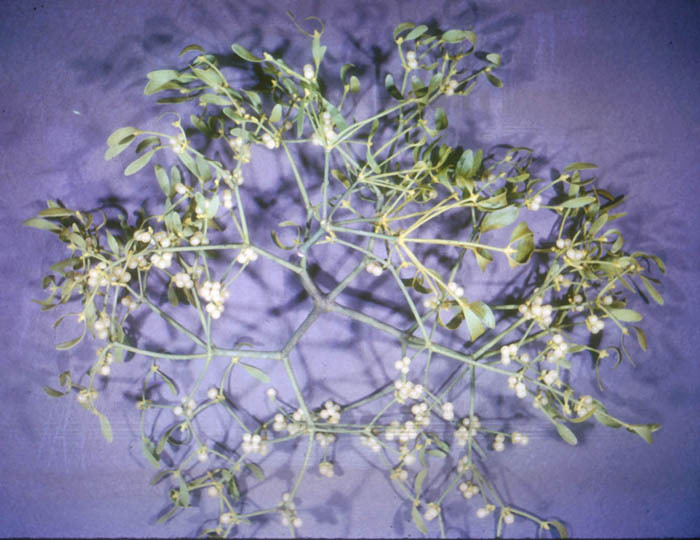 Photo (by G. Butler) habit of mistletoe, photo (by M. Fagg) closer view of shoots and photo (by M. Fagg) of fruiting stem. From Australian Mistletoes by Bryan Barlow. Photos. Province du Nord, New Caledonia. Photos 13 Nov 2007 by C. Davidson. Link goes to Flora of the World. Photo habit of plant, photo of shoots with young fruits. 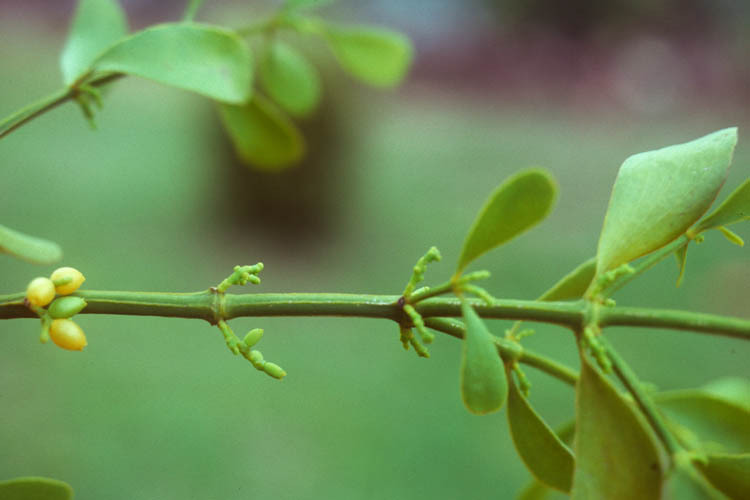 From Australian Mistletoes by Bryan Barlow. Shoots with fruits. 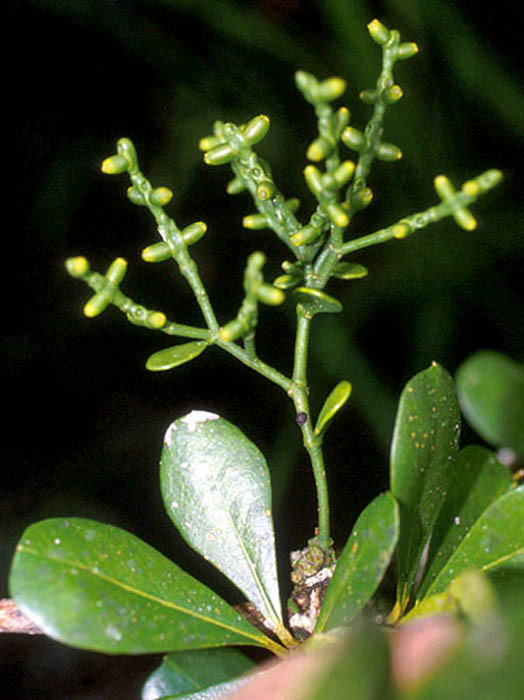 From Rare Plants of American Samoa. Photo 1994 by W. Arthur Whistler. Photo Shoot showing flowers and fruits. Tarumizu, Kagoshima, Japan. 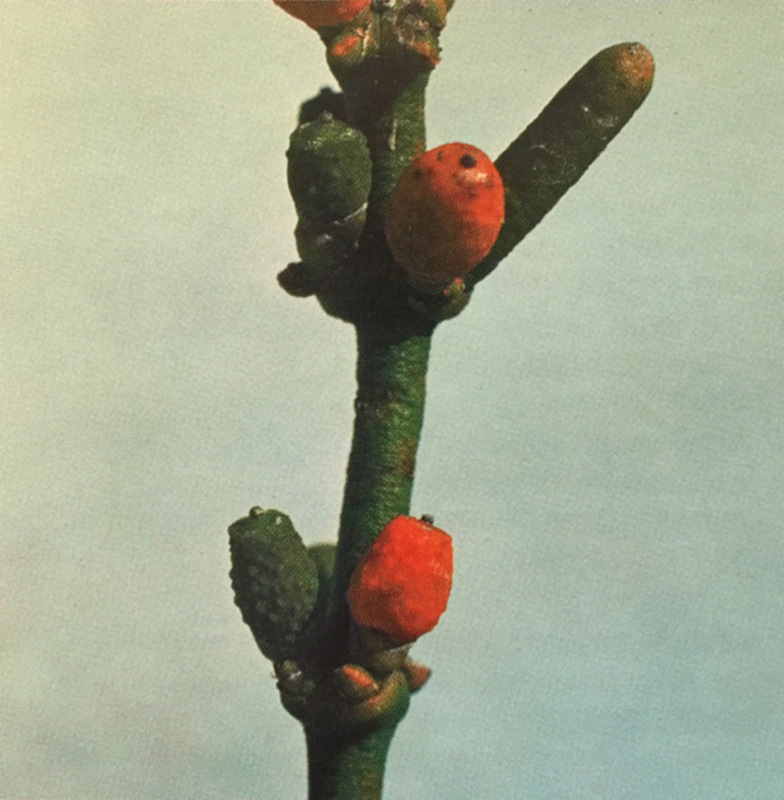 Photograph by Nagata Yoshio, published in "World of Plants" article by Mitsuru Hirota (Weekly Asahihyakka, Jan. 22, 1995). Photo1, Photo2. Madagascar. Link goes to TROPICOS. Photos. A series of close-up photos of flowers, fruits, etc. Taiwan. Photos by Mingiweng. Link goes to Flickr. Photos ssp. brassiana. 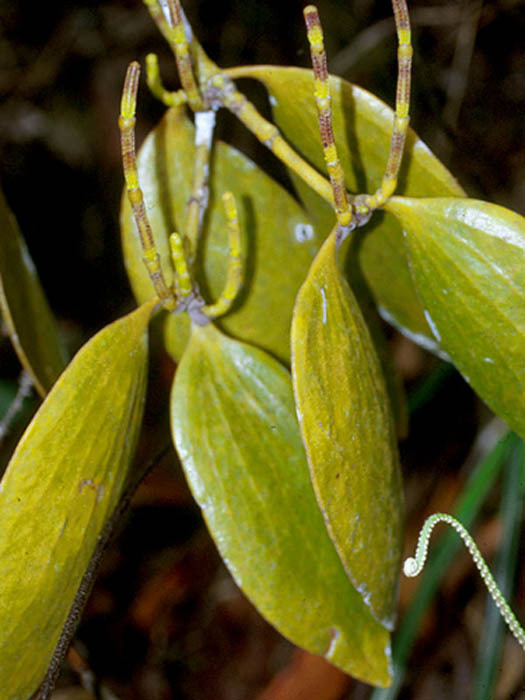 Link goes to Australian Tropical Rainforest Plants. Photos ssp. 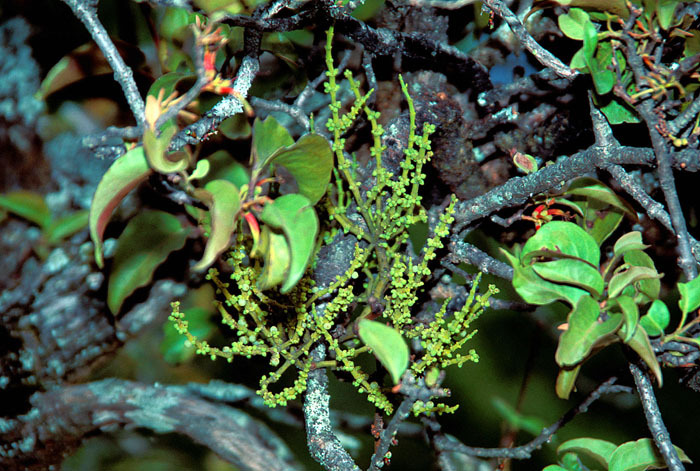 brassiana Link goes to Australian Parasitic Plants by Roger Fryer and Jill Newland. Photos. 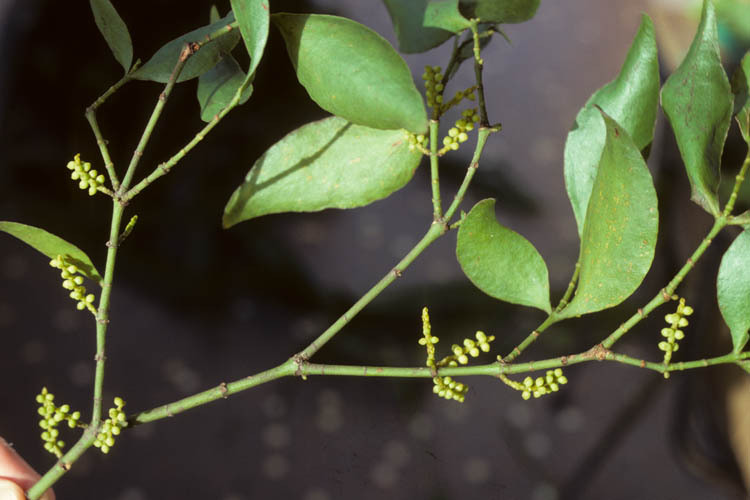 Mistletoe shoots on host branches. Sirmaur Dist., Himachal Pradesh, India. Photos by Krishan Lal. Link goes to Flowers of India. Photo. An excellent photo of this species from Koke'e State Park, Kaua'i, Hawaii. Link goes to Picas web albums by John. Photo. Shoots. 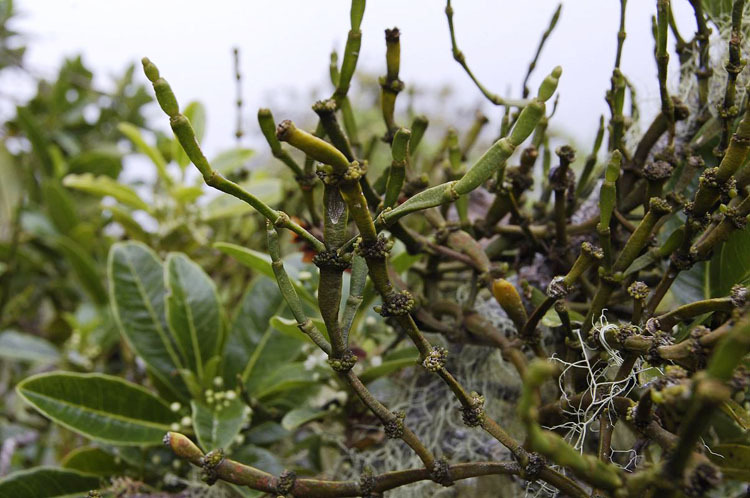 Link goes to University of Hawai'i Vascular Plant Families. Photo. Shoots (as K. complanata). From Polynesia. Link goes to Die Pflanzenwelt Polynesiens. Photo by Forest and Kim Starr. Photo. 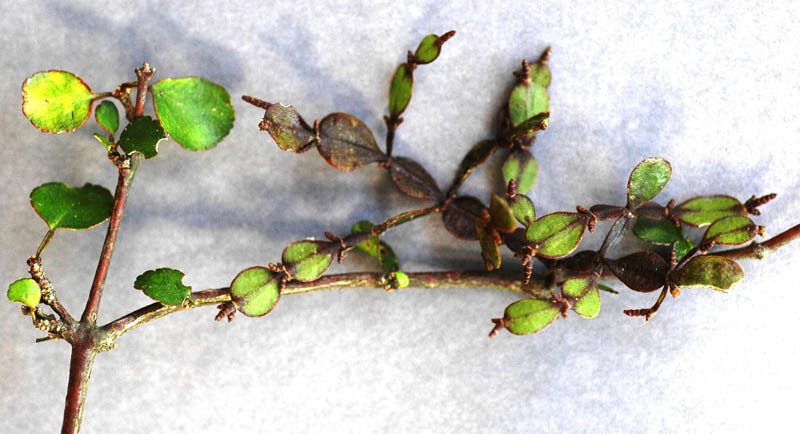 Parasitic on Coprosma crassifolia. New Zealand. Photo by Peter Bannister. Photo. Parasitic on on Melicope simplex. New Zealand. Photo by Peter Bannister. Photo. Most similar to var. gaudichaudi. Parasitic on the endemic Euodia borbonica. La Réunion. Photo by Rogier van Vugt, Feb. 9, 2008. Photo. Most similar to var. richardi. La Réunion. Photo by Rogier van Vugt, Feb. 13, 2008. 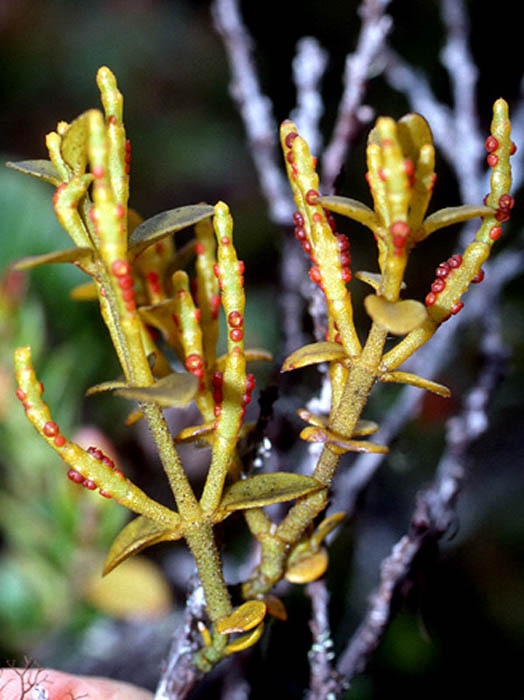 Photos Link goes to Australian Parasitic Plants by Roger Fryer and Jill Newland..
Photo. From Polynesia. Link goes to Die Pflanzenwelt Polynesiens. Photo by Kenneth R. Wood. Photo. From Polynesia. Link goes to Die Pflanzenwelt Polynesiens. Photo by Jupiter Nielsen. Photos. A series of excellent photos of the plant by Margaret Donald. These may be K. rubra subsp. geijericola. Link goes to Flickr. 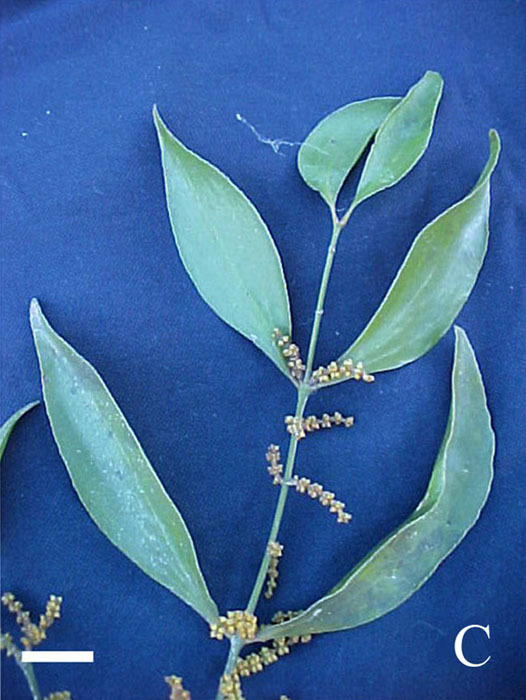 Photo habit of plant. 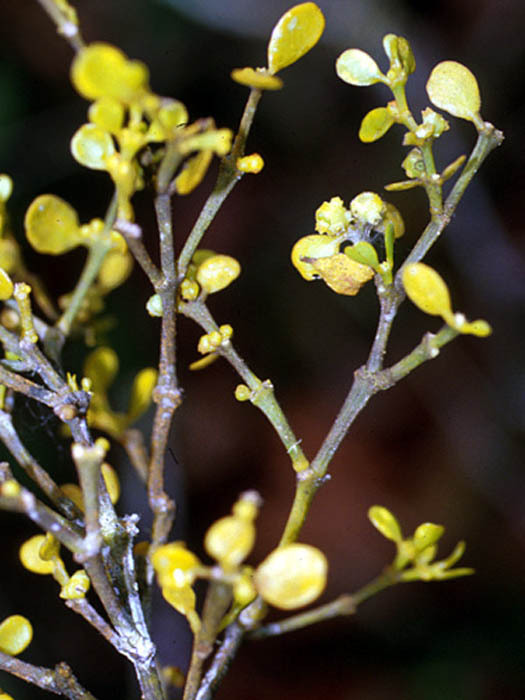 From Australian Mistletoes by Bryan Barlow. Photo. 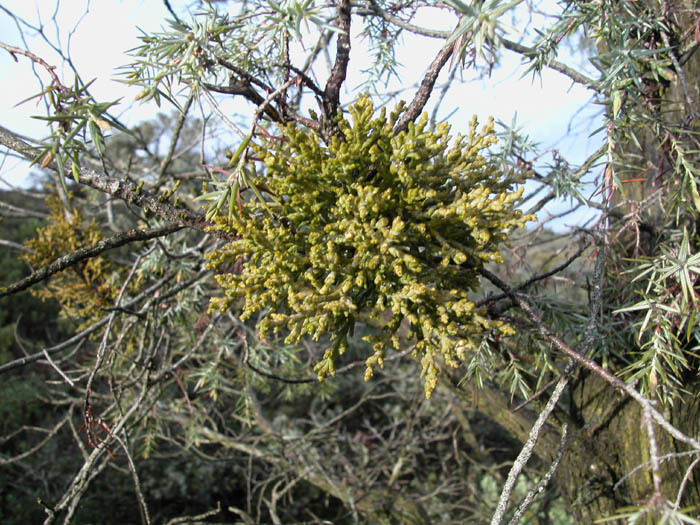 Parasitic on Erica lusitanica (an introduced host). New Zealand. Photo by Peter Bannister. Photo. Parasitic on Kunzea ericoides. New Zealand. Photo by Peter Bannister. 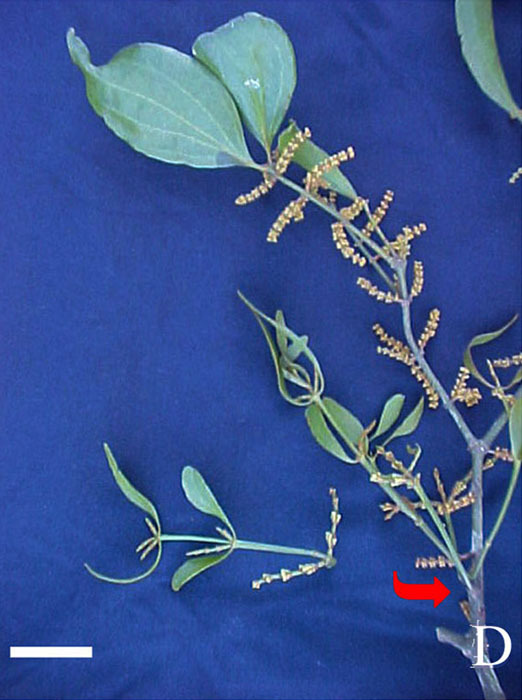 Photo habit of plant and photo of flowering shoot1 and flowers. 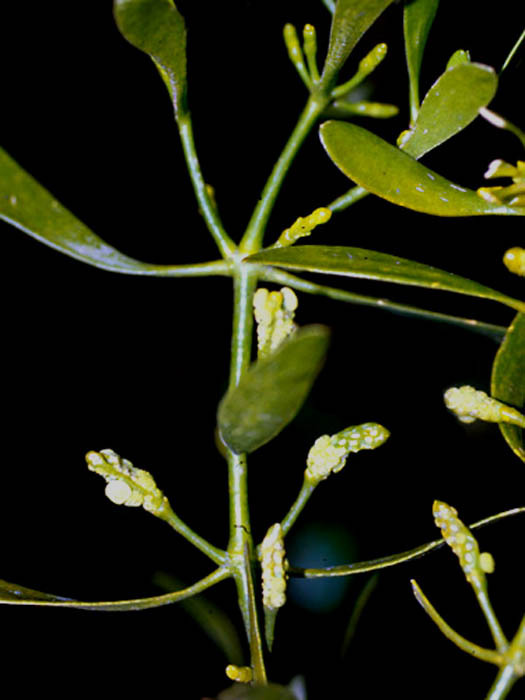 From Australian Mistletoes by Bryan Barlow. 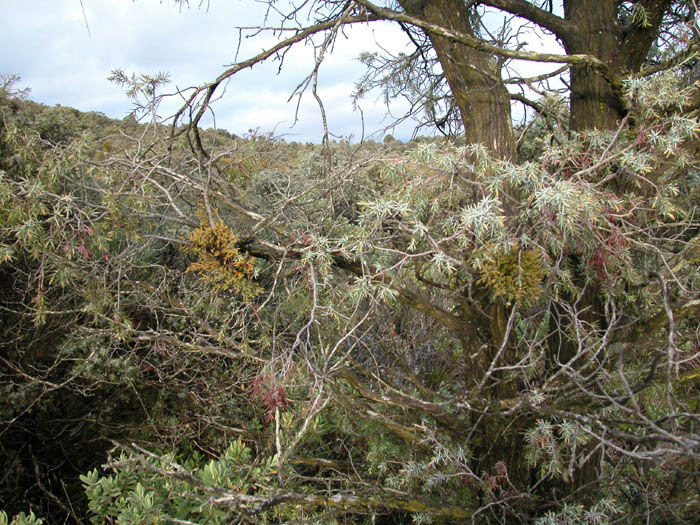 Photos Link goes to Australian Parasitic Plants by Roger Fryer and Jill Newland. .
Photo Habit of the plant parasitizing Melaleuca. Queensland, Australia. Photo by Gerhard Glatzel. Photo Plant showing haustorial connection to host. Queensland, Australia. Photo by Gerhard Glatzel. 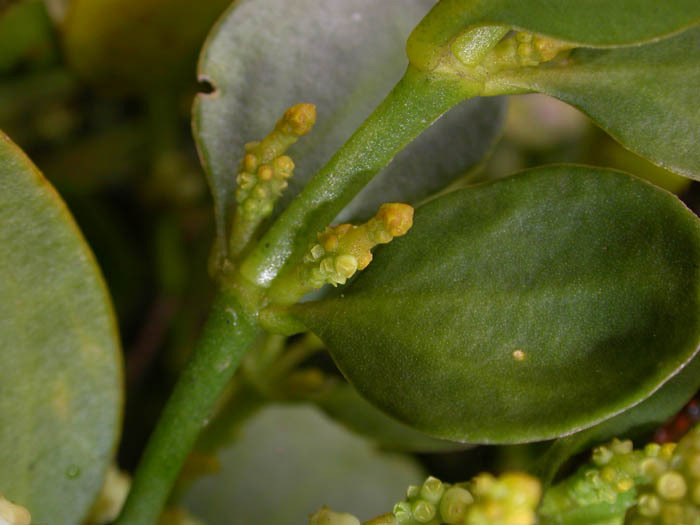 Photo Closer view of mistletoe shoots. Queensland, Australia. Photo by Gerhard Glatzel. Photos. Coastal flat behind Moonee Beach, north of Coffs Harbour, New South Wales. Photos by Tony from Sydney. Link goes to Flickr. 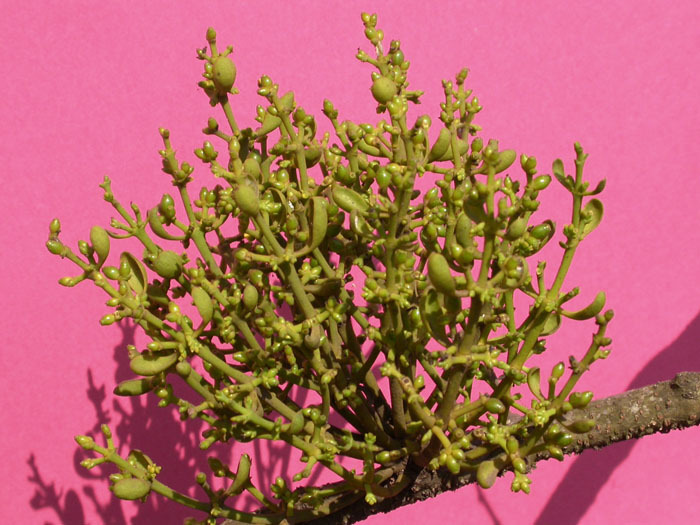 Photo of flowering shoot, photo of flower and photo of fruiting shoots. From Australian Mistletoes by Bryan Barlow. 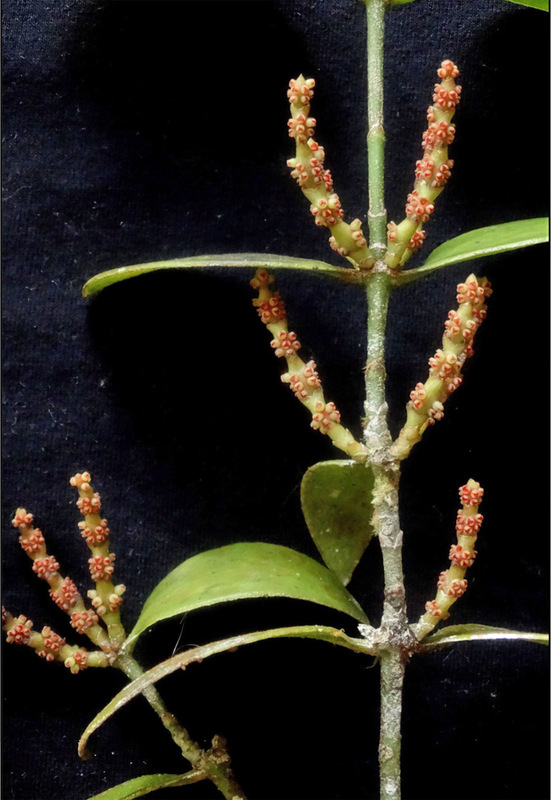 Photo of flowering shoot and photo of fruiting shoots. From Australian Mistletoes by Bryan Barlow. Photos. Excellent photos of flowers and fruits. By Steve and Alison from Redland Bay, Queensland. Link goes to Flickr. 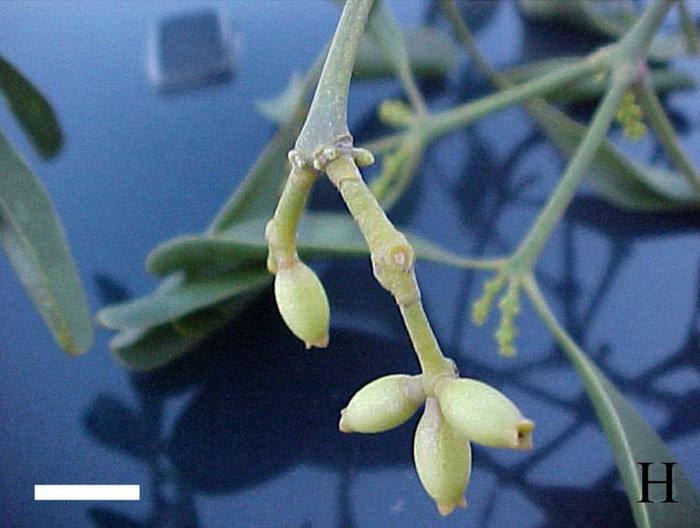 Photo of mistletoe habit on host branch, photo of flowering shoot, photo of flowers and photo of fruits. 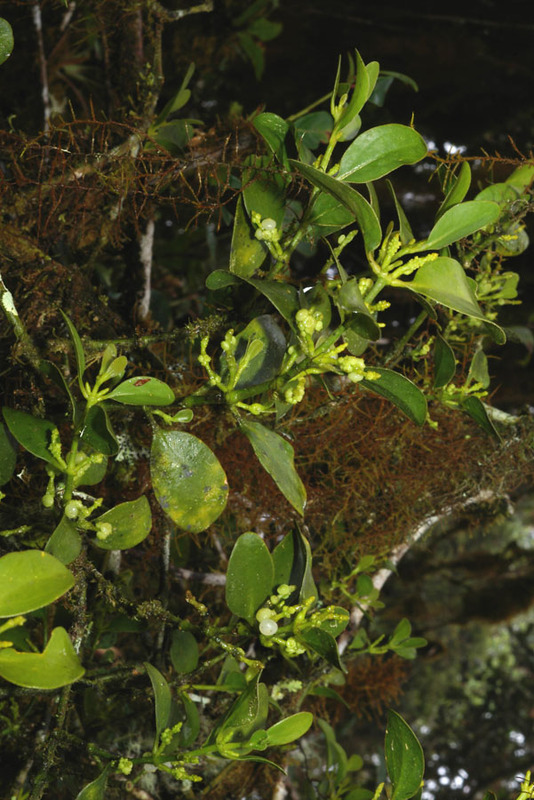 From Australian Mistletoes by Bryan Barlow. 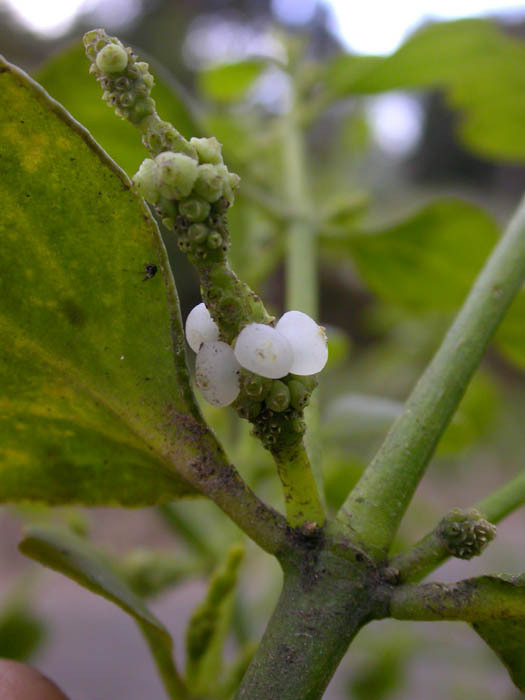 Photo of plant in fruit. 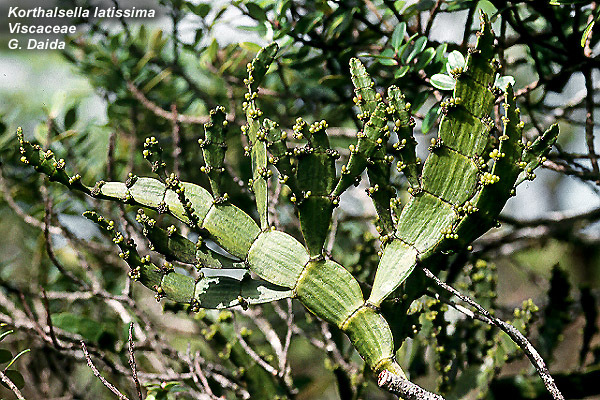 Cerrado Campineiro, near Campinas, Sao Paulo, Brazil. Photo by Marco Silva (originally from Picasaweb). Photo. Zappi, D.C. 3331 - Brazil: Minas Gerais. 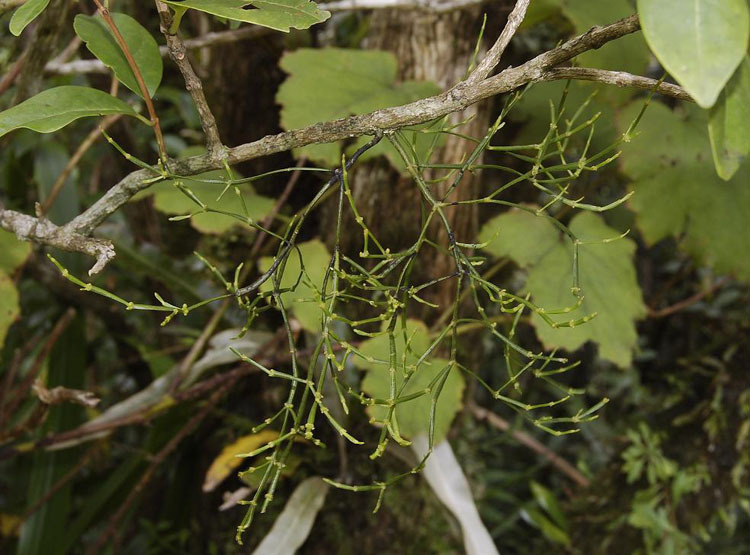 Link goes to Neotropical Plants image database at Kew. Photo. Fruiting shoots. Guanica, Puerto Rico. Photo from Smithsonian Institution, taken by Pedro Acevedo-Rodriguez. See USDA Plants page HERE. Photo. A. 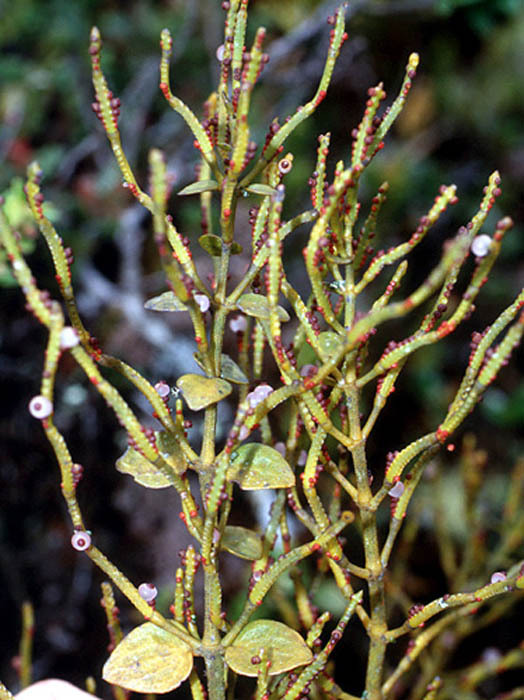 Habit of plant on Ruprechtia laxiflora. B. Shoot with young fruits. C. Young glaucous shoots. 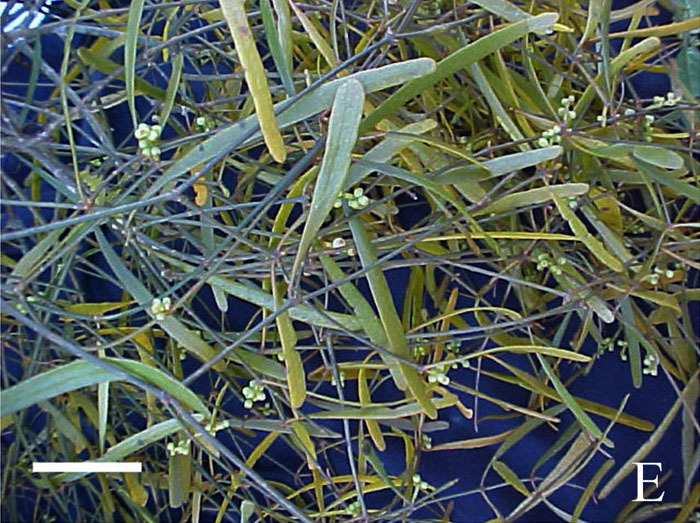 D. Inflorescences with staminate and pistillate flowers (arrows). E. Fruits. From Dettke et al. (2011. Darwiniana 49: 86-89). Photo. Branches with leaves and spikes (bar = 2 cm). From Reif (2007). English translation of the thesis available HERE. Photo. Detail of the spike (bar = 1 cm). From Reif (2007). English translation of the thesis available HERE. Photo. 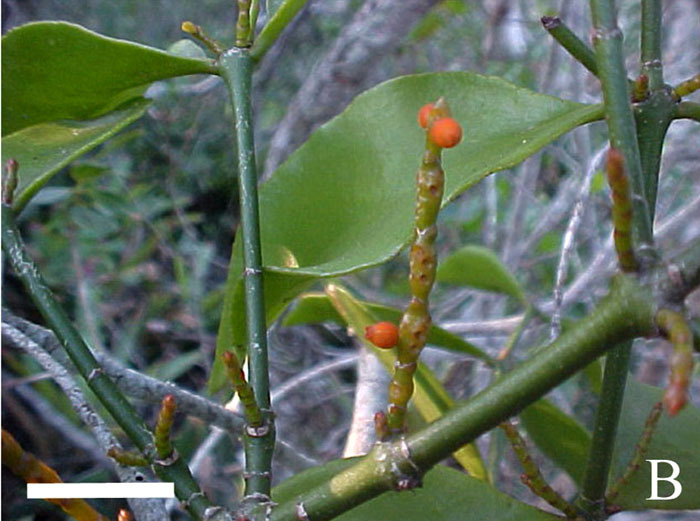 Mistletoe parasitizing Galapagos Croton. Photo by John Pitts. Link goes to Flickr. Photos. Nicaragua. Photos by Stevens 30604. Link goes to TROPICOS. Photo. Fruiting plant. Mojave National Preserve, San Bernardino Co., CA. Photo by Yaxbalam. Link goes to Flickr. Photo. 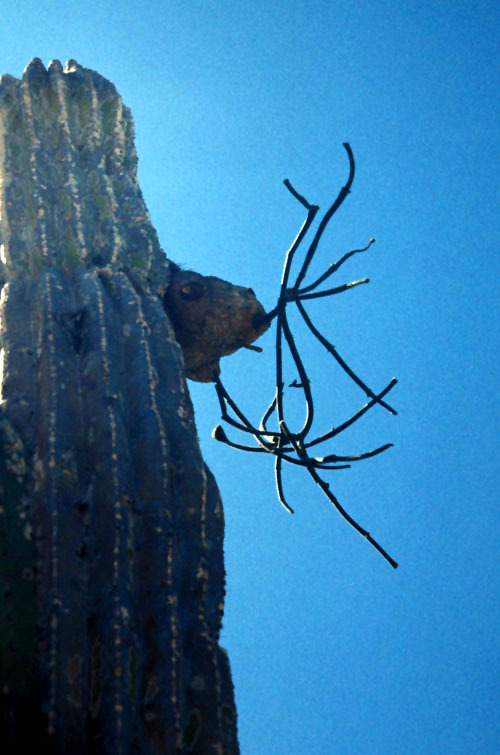 Parasitic on Pachycereus pringlei, forming subglobular excrescence to 3 dm on truck. Cape Region of Baja California Sur, Mexico. Photo 27 Nov. 1969 by Reid Moran (slide archived at the San Diego Natural History Museum). Photo. A second image of the above unusual host/parasite combination. 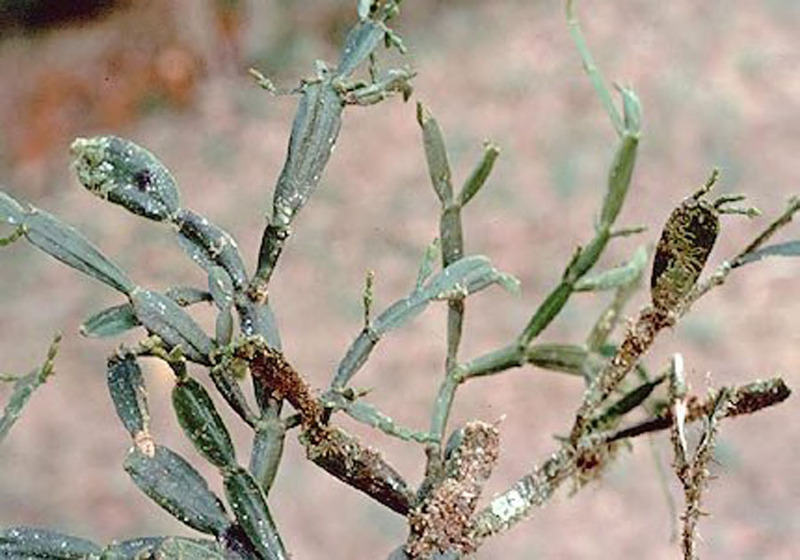 Note the extensive canker formation, caused by hypertrophy of host tissue at the site of the mistletoe haustorium. North of Migrino, Baja California Sur, Mexico. 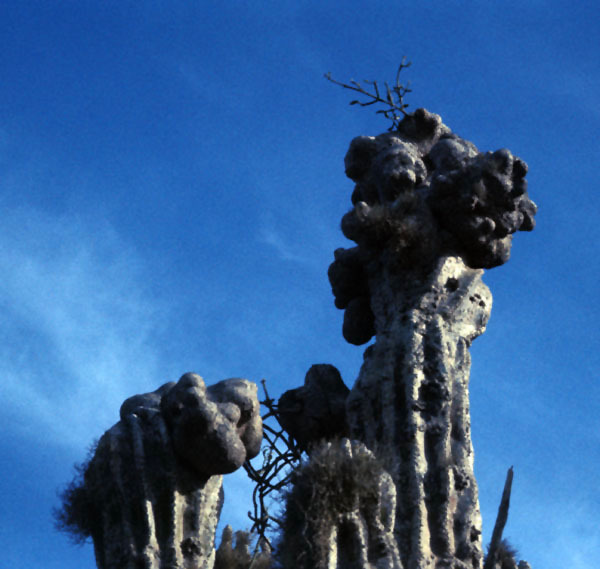 Photo 8 Nov. 1971 by Reid Moran (slide archived at the San Diego Natural History Museum). Photos. Several excellent photos of plant. Coachella Valley, California. Photos by Joe Decruyenaere. Link goes to Flickr. Photo. 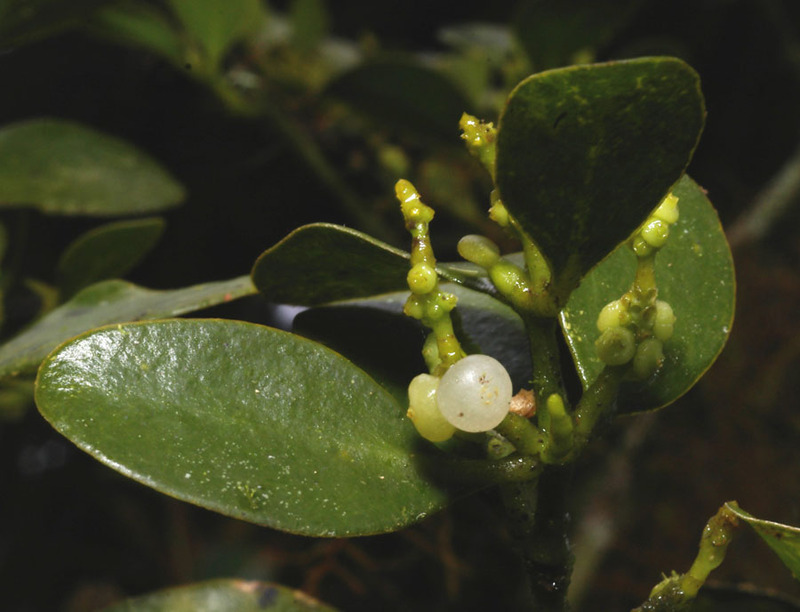 Phainopela feeding on Phoradendron californicum fruits. SE Arizona. Photo by Gary Clark (originally on Picasaweb). Photos. A nice series of photos of this species from San Bernardino Co., CA. Photos by Dennis Stevenson. Link goes to PlantSystematics.org. Photo1, photo2. 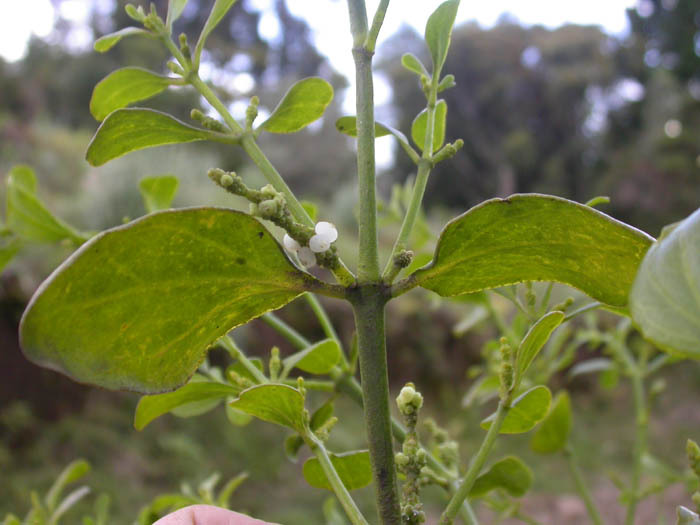 Showing a rare condition epiparasitic upon P. serotinum ssp. macrophyllum. The latter upon Fraxinus velutina. Moristown, AZ. Photos by Paul Kaufman. See his web site HERE. Photos. Riverside County, California, USA. Photos 3 Mar 1977 by C. Davidson. Link goes to Flora of the World. Photos. Parque Estadual do Biribiri - Serra do Espinhaço - Diamantina - Minas Gerais - Brazil. Photos by João Medeiros. Link goes to Flickr. Photo. Infructescences. Mexico. G. Cornejo-Tenorio & G. Ibarra-Manriquez. Link goes to Neotropical Live Plants, Field Museum. Photo. Belize. From Neotropical Live Plant Photos. Photo ID 9692. Photo by Robin Foster. Photo. Ecuador. From Neotropical Live Plant Photos. Photo ID 21275. Photo by Robin Foster. Photo Perú. Possibly this taxon. From Neotropical Live Plant Photos. Photo ID 15785. Photo by Robin Foster. Photo 1 and Photo 2. Possibly this taxon. Shoot with axillary spikes. Santo Domingo, sector Tintaya, Franz Tamayo, La Paz, Bolivia. A. Fuentes et al. 11088. Link goes to TROPICOS. Photo. Inflorescence. Chiriaco, lower slope of Cerro Tayu, Perú. Van der Werff 24660 (same as 24682). Link goes to TROPICOS. Photos. Vicinity of Peñas Blancas, Carchi, Ecuador. Photos 18 Feb 2005 by C. Davidson. Link goes to Flora of the World. Photos. Link goes to Atrium. Photo. 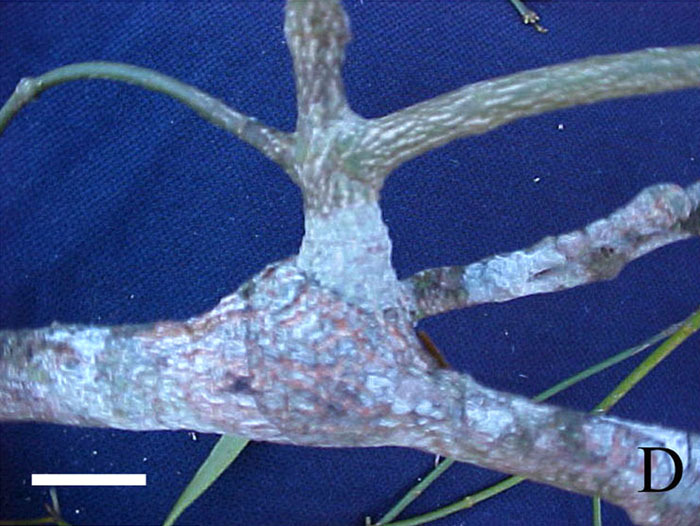 Branch with fertile sheathing intercallary cataphylls (bar = 2 cm). From Reif (2007). English translation of the thesis available HERE. 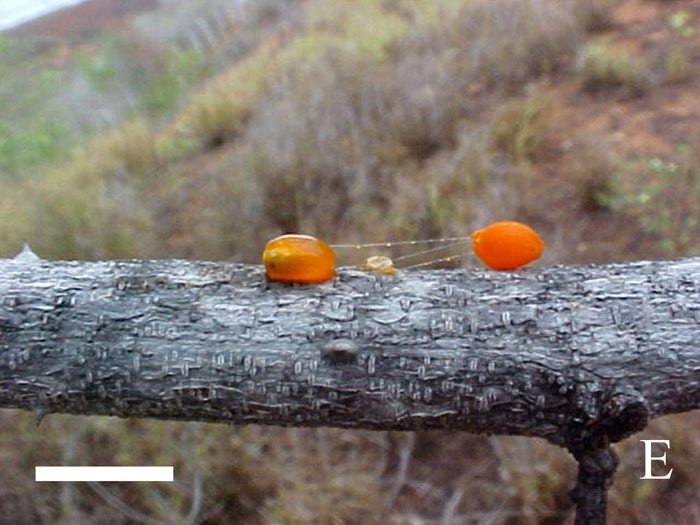 Photo Branch parasitized by P. dipterum (arrow) (bar = 1 cm). From Reif (2007). English translation of the thesis available HERE. Photos. Shoots with inflorescences. Santa Cruz, Vallegrande Bolivia. Parada et al. 4803. Link goes to TROPICOS. Photos. Shoots with inflorescences. Pasco, Oxapampa, Peru. Vásquez et al. 36149. Link goes to TROPICOS. Photos. Series of excellent photos. Link goes to Flore de Guyane. 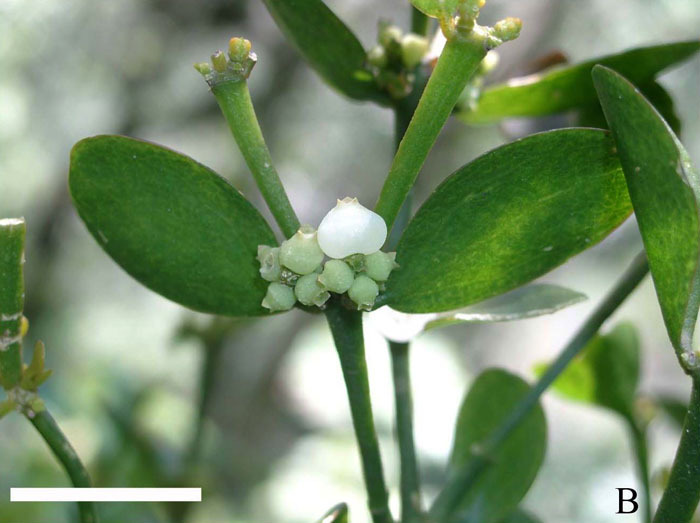 Photo Close-up of the attachment of the mistletoe (arrow) on P. crassifolium, an epiparasitic relationship (bar = 1.5 cm). From Reif (2007). English translation of the thesis available HERE. Photo Close-up of branch with spikes (bar = 1 cm). From Reif (2007). English translation of the thesis available HERE. 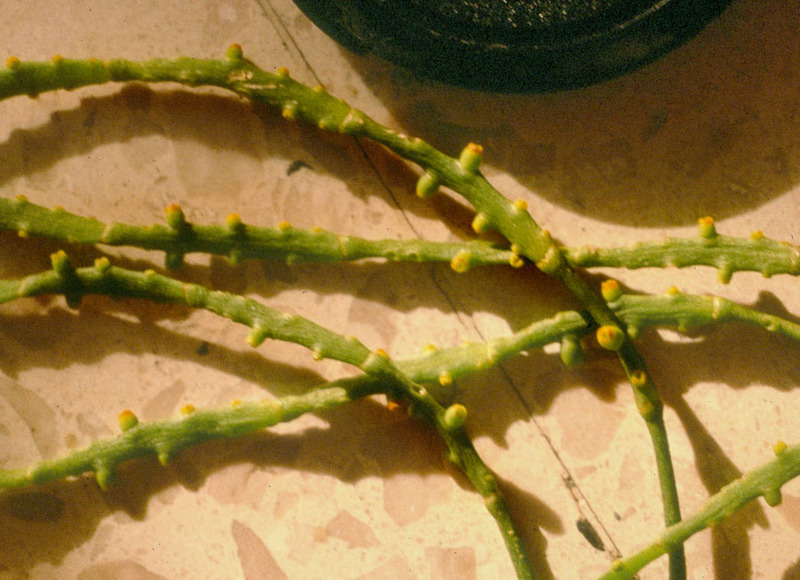 Photo Close-up of the fruiting spike (bar = 1 cm). From Reif (2007). English translation of the thesis available HERE. Photo. Shoot with inflorescences. Chiapas, Mexico in the vicinity of San Cristobal de las Casas. Photo August 2008 by Christopher Randle. 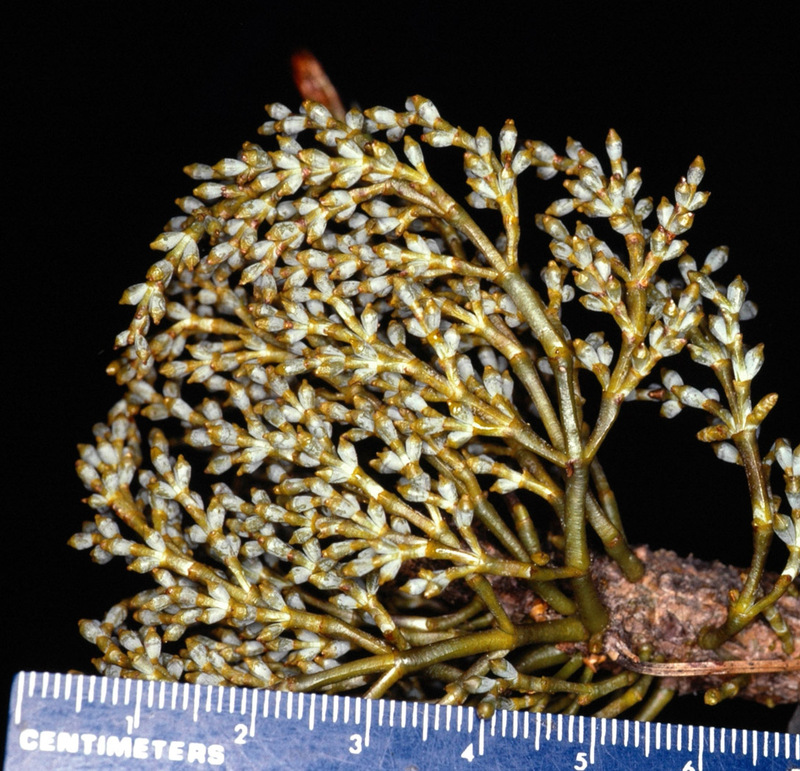 Photo Aspect of the flowering branch (bar = 4 cm). From Reif (2007). English translation of the thesis available HERE. 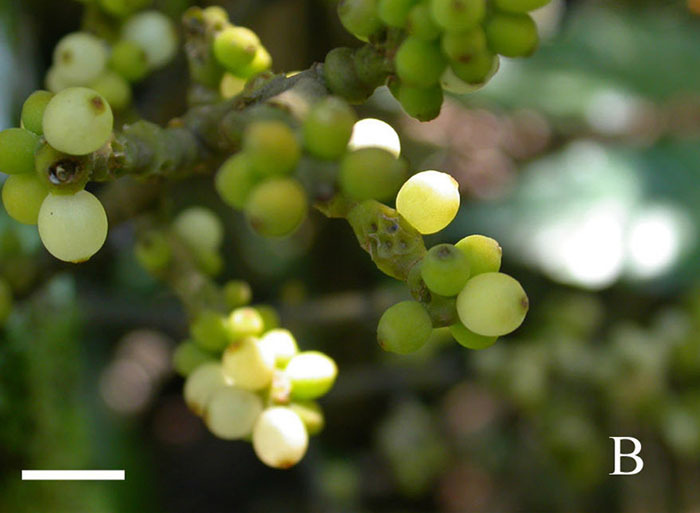 Photo Close-up of the fruits (bar = 5 mm). From Reif (2007). English translation of the thesis available HERE. Photo1, Photo2. Puerto Rico. Photos by C. M. Taylor. Link goes to TROPICOS. Photos. Fruiting shoot. Possibly this species. Santa Cruz, Vallegrande Bolivia. Parada et al. 503. Link goes to TROPICOS. Photos. Deschutes County, Oregon, USA. Photos 21 Oct. 2011 by C. Davidson. Link goes to Flora of the World. 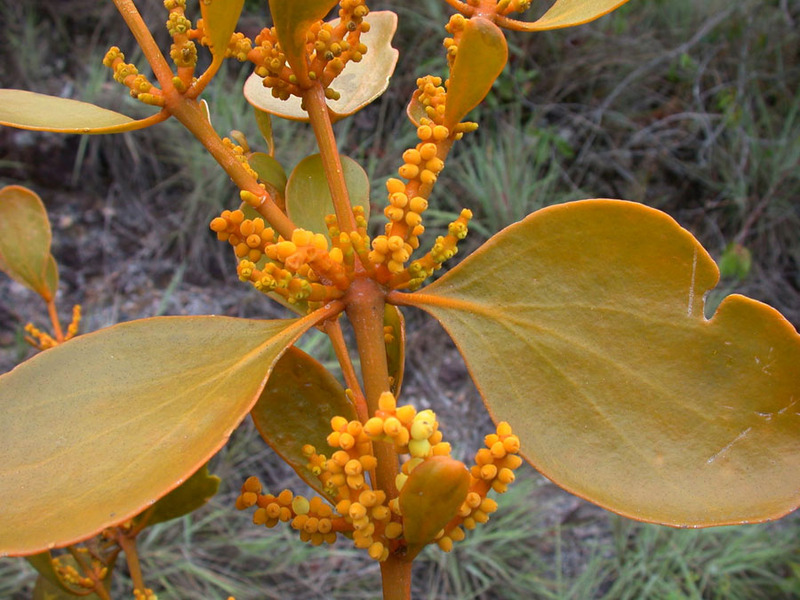 Phoradendron leucarpum. 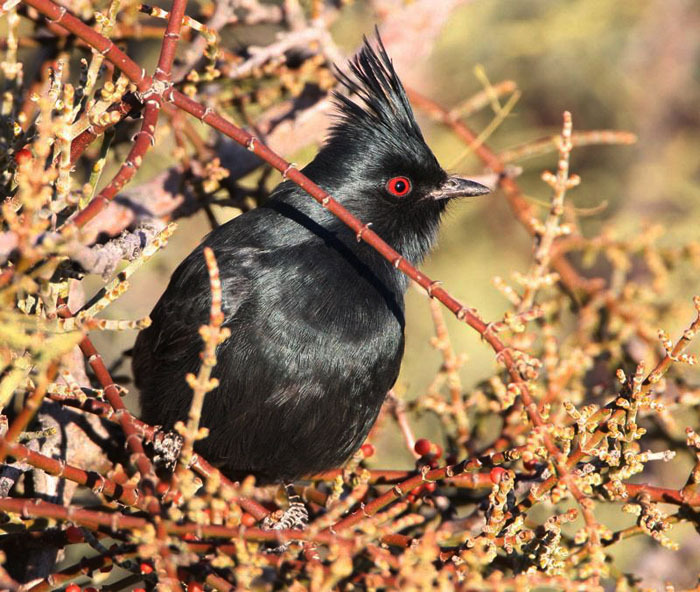 Four subspecies of this taxon were recognized in the monograph by Kuijt (2003); however, these cannot be distinguish by morphological or molecular means, thus all will be considered parts of a polymorphic and wide-ranging species. Photos. A number of photos of this species. Link goes to PhytoImages. Photo Parasitic on Quercus coccinea, Elmore Co, Alabama, USA. [DLN 2135]. Photo by D. L. Nickrent. 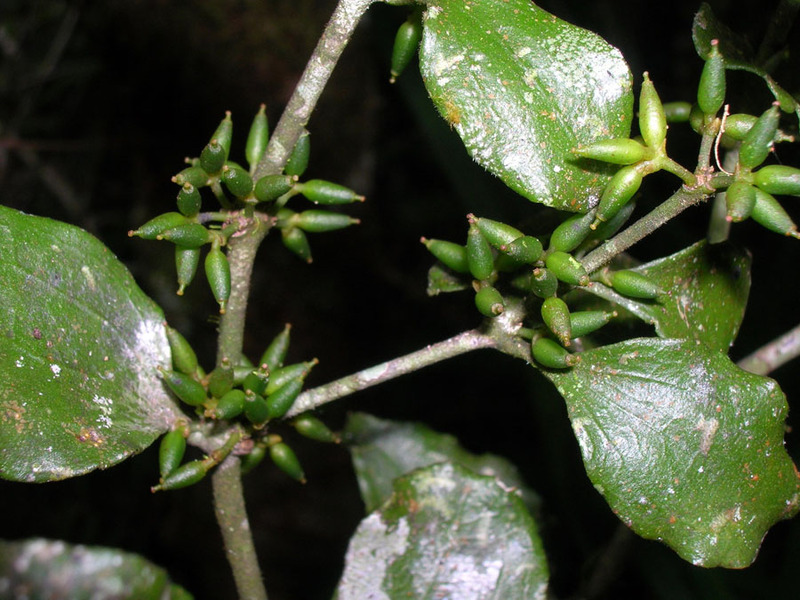 Photos of the plant (considered P. leucarpum ssp. macrophyllum). Cattle Canyon, San Gabriel Mountains near Los Angeles, CA. Photos by Sedges Have Edges. Link goes to Flickr. 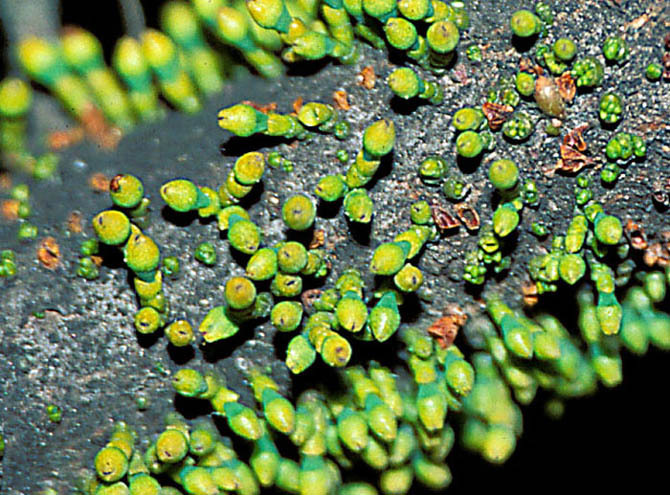 Photo Close-up of the haustorium on the host branch (bar = 1 cm). From Reif (2007). English translation of the thesis available HERE. 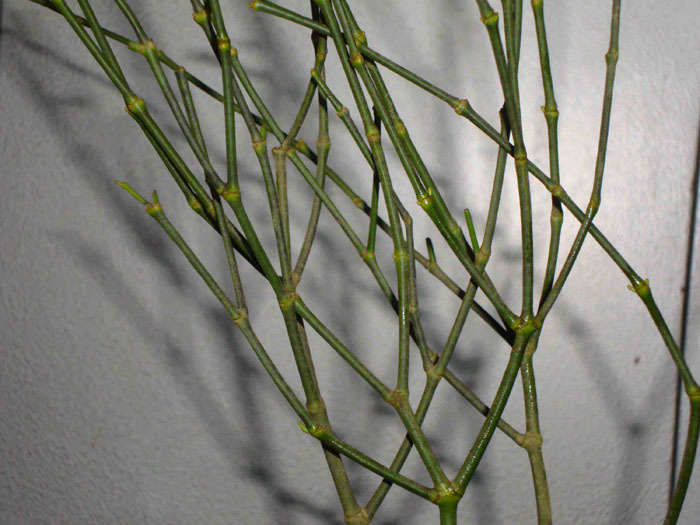 Photo Branches and leaves of the mistletoe (bar = 2 cm). From Reif (2007). English translation of the thesis available HERE. 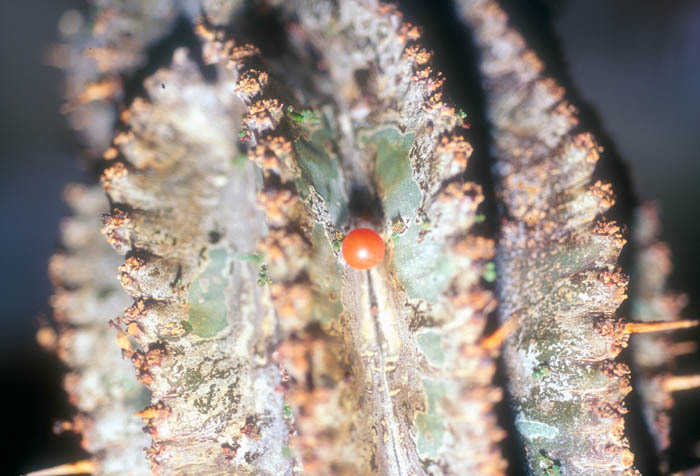 Photo Close-up of the fruit (bar = 1 cm). From Reif (2007). From Reif (2007). English translation of the thesis available HERE. Photos. Area Natural de Manejo Integrado Madidi, La Paz, Franz Tamayo, Bolivia. Photos 17 Sept. 2006 by C. Davidson. Link goes to Flora of the World. Photo. Zappi, D.C. 1836 - Brazil: Minas Gerais. 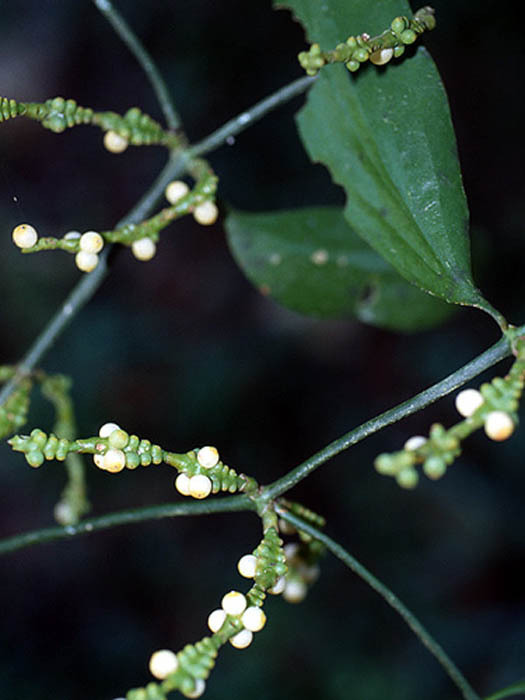 Link goes to Neotropical Plants image database at Kew. Photos. Shoot with inflorescences. Cloud forest remnant along Panamerican Highway to San Juan de Limay, Estelí, Nicaragua. Stevens & Montiel 34001. Link goes to TROPICOS. 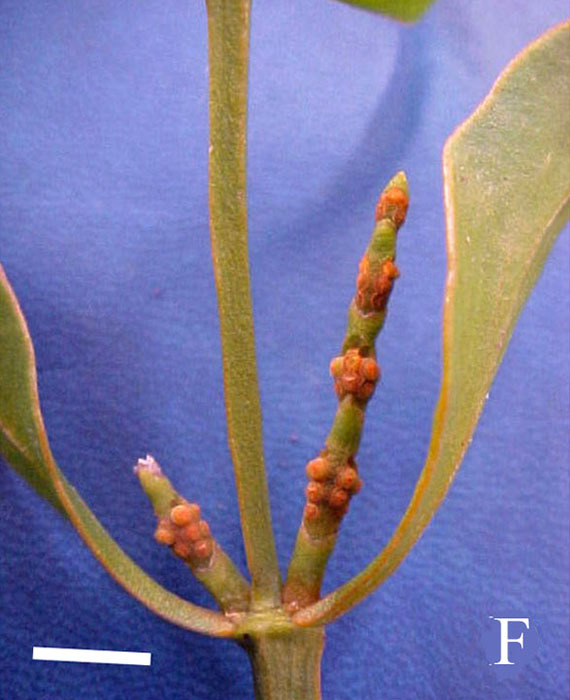 Photo Mistletoe on the host (bar = 10 cm). From Reif (2007). English translation of the thesis available HERE. 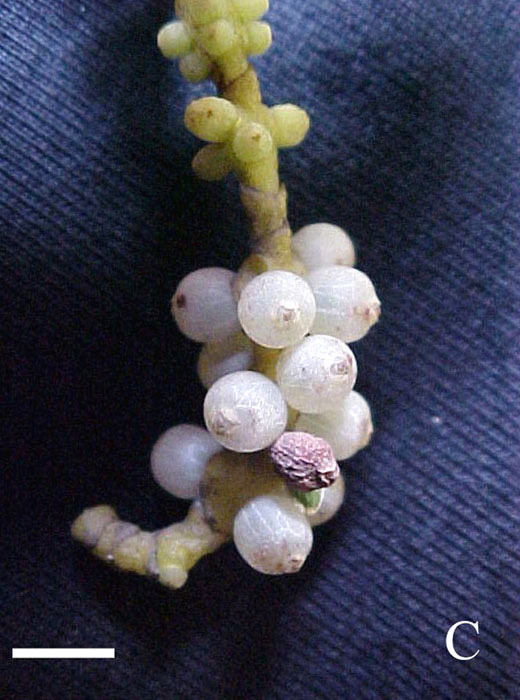 Photo Close-up of the fruits (bar = 1 cm). From Reif (2007). English translation of the thesis available HERE. Photo. D. Sasaki et al. 2247 - Brazil: Mato Grosso. 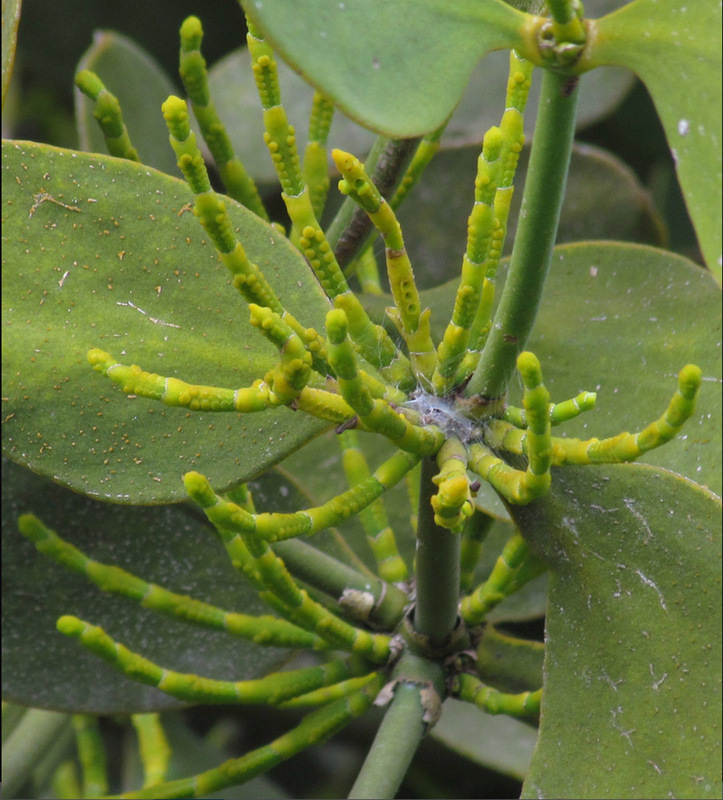 Link goes to Neotropical Plants image database at Kew. 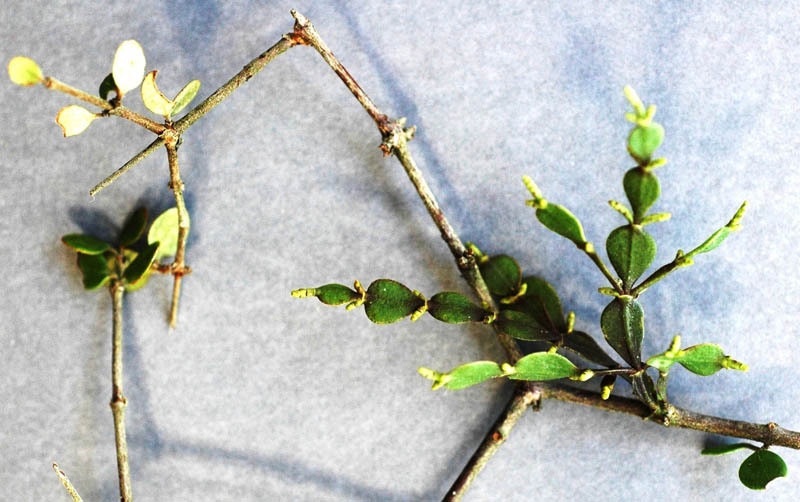 Photo of the host Bursera with the tiny mistletoe emerging from its branches. 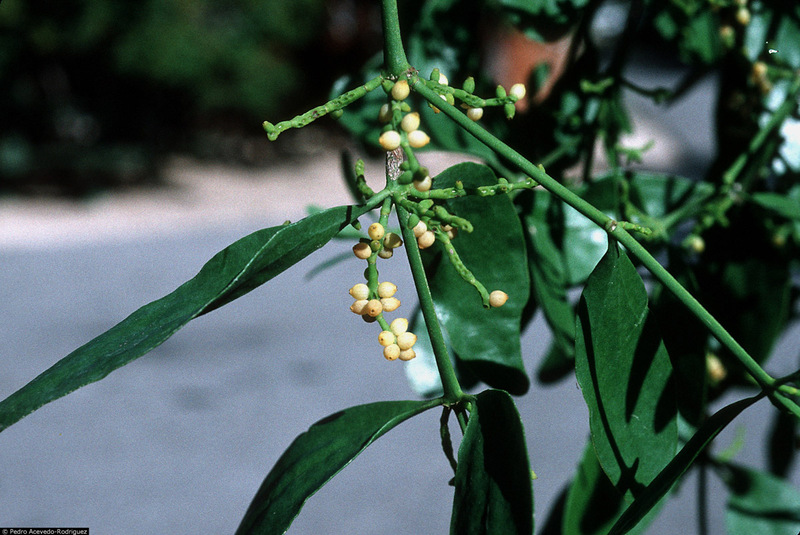 Photo of the mistletoe in fruit. Cuernavaca municipio, Morelos, Mexico. Photographs by Esteban Martínez. This species was first described by Rzedowski & Calderon Rzedowski (2011 - see translation HERE) from a population near Mariscala, Oaxaca, Mexico. Photos. Plant in fruit. Serra do Cipó, Minas Gerais, Brazil. Photos by Gregório Ceccan-Tini. Link goes to Flickr. Photo. Zappi, D.C. 2476 - Brazil: Minas Gerais. Link goes to Neotropical Plants image database at Kew. Photos. A nice series of good photos showing various parts of the plant. Photos by Alan Franck. Link goes to Flora of Clarendon Parish Region, Jamaica. 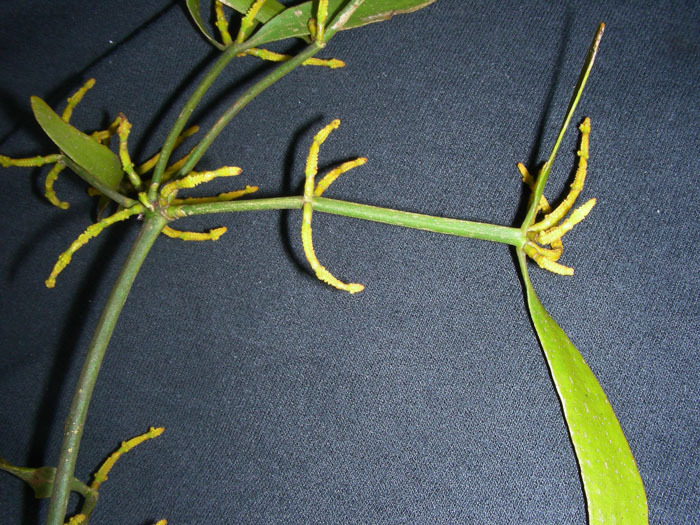 Photo Mistletoe shoots with flowering spikes (bar = 3 cm). From Reif (2007). English translation of the thesis available HERE. 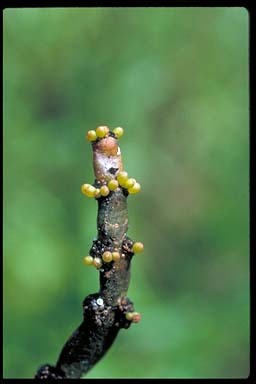 Photo Fruiting spikes (bar = 3 cm). From Reif (2007). From Reif (2007). English translation of the thesis available HERE. Photos. Fruiting shoots. Chontales, Nicaragua. Stevens et al. 28532. Link goes to TROPICOS. Photos A series of digital photos showing various parts of the plant (leaves, inflorescences, fruits, etc.) Link goes to La Flora Digital de La Selva. Photos. Volcan San Martin, Veracruz, Mexico. Photos 22 May 2001 by C. Davidson. Link goes to Flora of the World. Photos. Fruiting shoots. Loreto, Loreto, Peru. Vásquez et al. 34960. Link goes to TROPICOS. Photo. Click on the forward arrow below the image to see more photos. D. Sasaki et al. 2262 - Brazil: Mato Grosso. 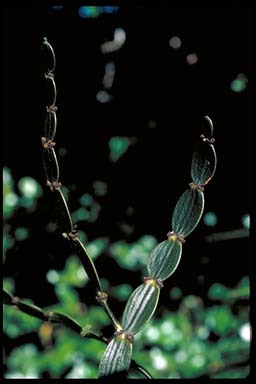 Link goes to Neotropical Plants image database at Kew. Photo 1 and photo 2. Panamá. From Neotropical Live Plant Photos. Photo IDs rf3 and rf4. Photos by Robin Foster. 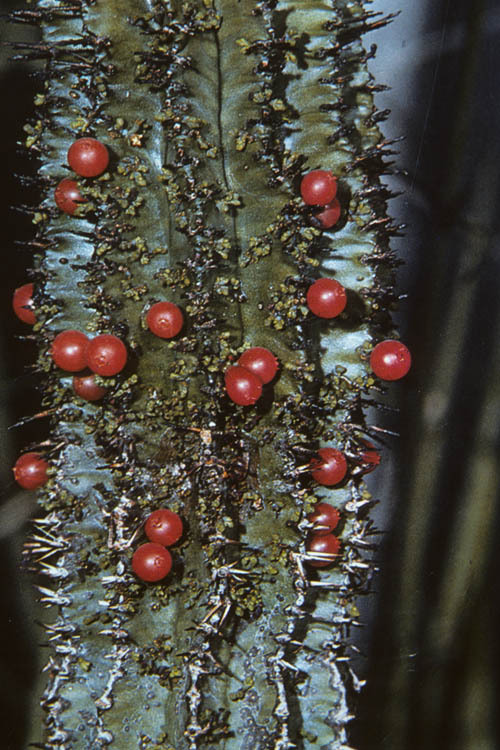 Photo Close-up of the spike with fruits (bar = 5 mm). From Reif (2007). English translation of the thesis available HERE. 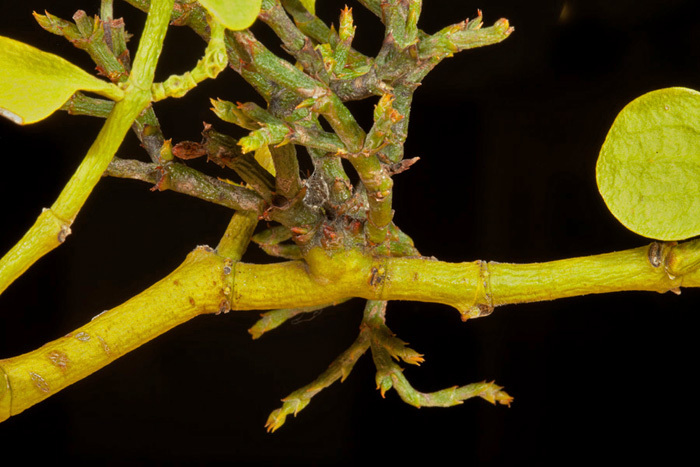 Photo Seeds on host branch showing viscin stands. From Reif (2007). English translation of the thesis available HERE. Photo Fruiting shoot, parasitic on Ficus. Km 168 on Highway 1, 16 km N of Estelí, Cuesta de Kukamonga, nearly dry stream bed leading down to Río Estelí, Nicaragua. W. D. Stevens et al. no. 27030. Link goes to TROPICOS. Photo Fruiting shoots, parasitic on Ficus. 8.1 km NE of La Libertad (parque) along road to Santo Domingo, Chontales, Nicaragua. W. D. Stevens et al. 27353. Link goes to TROPICOS. Photos. Fruiting shoot. Municipio de Somoto, Cerro Quisuca, Madriz, Nicaragua. Coronado González 4076. Link goes to TROPICOS. Photos. Fruiting shoot. Estelí, Nicaragua. Coronado González 6879. Link goes to TROPICOS. Photos. Fruiting shoot. Granada, Nicaragua. Rueda 18569. Link goes to TROPICOS. Photos. Fruiting shoot. Bocos del Toro, Panama. Knapp and Monro 9928. Link goes to TROPICOS. 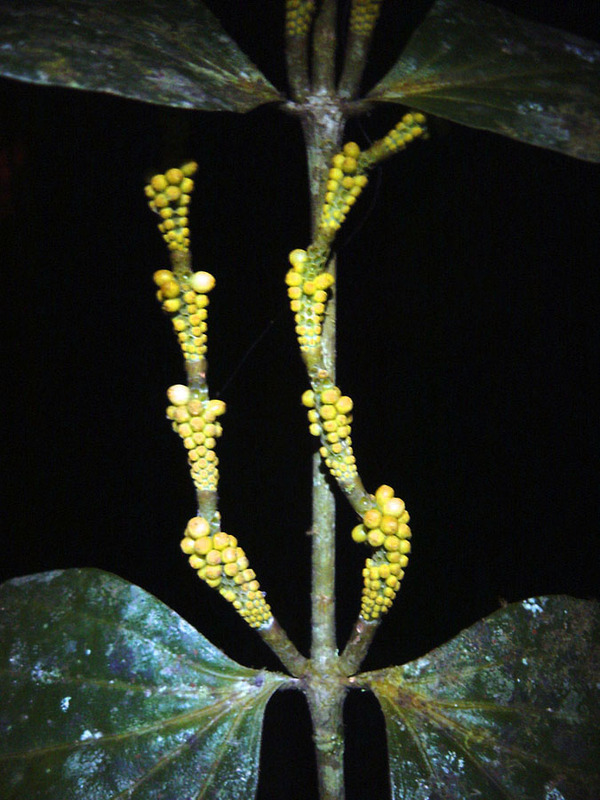 Photos of plant from near Iquitos, Peru. By Alexey Yakovlev. Link goes to Flickr. Photo. 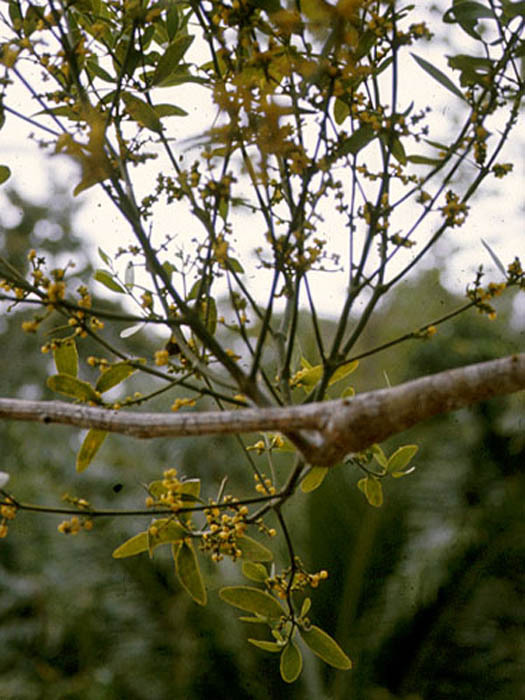 Mistletoe from Dominican Republic. Link goes to PhytoImages. Photo. Shoot with inflorescences and infructescences. Mexico. G. Cornejo-Tenorio & G. Ibarra-Manriquez. Link goes to Neotropical Live Plants, Field Museum. Photos. Shoots with inflorescences. A. K. Monro 4950. Link goes to TROPICOS. Photos. Manual de Plantas de Costa Rica. Testigo: Hammel et al. 26985. Link goes to Flickr. Photos. Guanacaste dry forest, Costa Rica. Photos D. Janzen. Link goes to BOLDSYSTEMS. Photo. 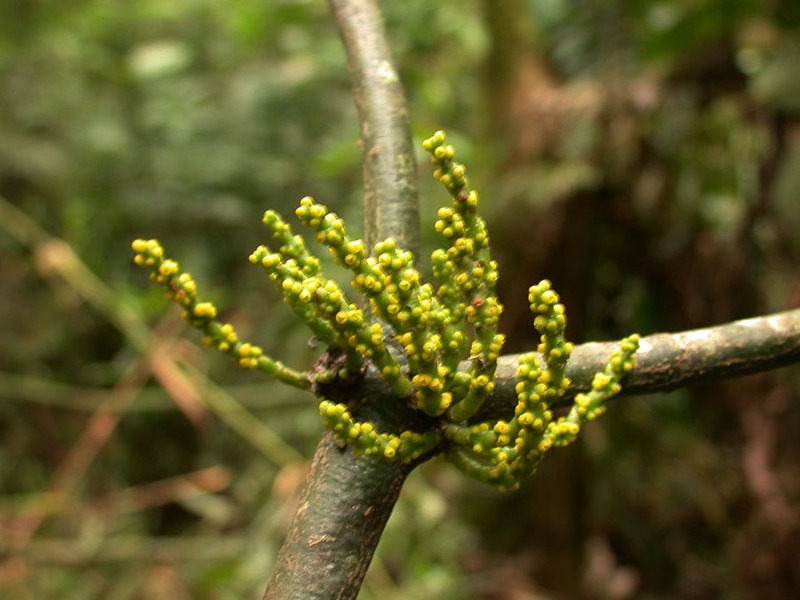 Close-up of inflorescence (note branching!). Costa Rica. Photo from Flickr. 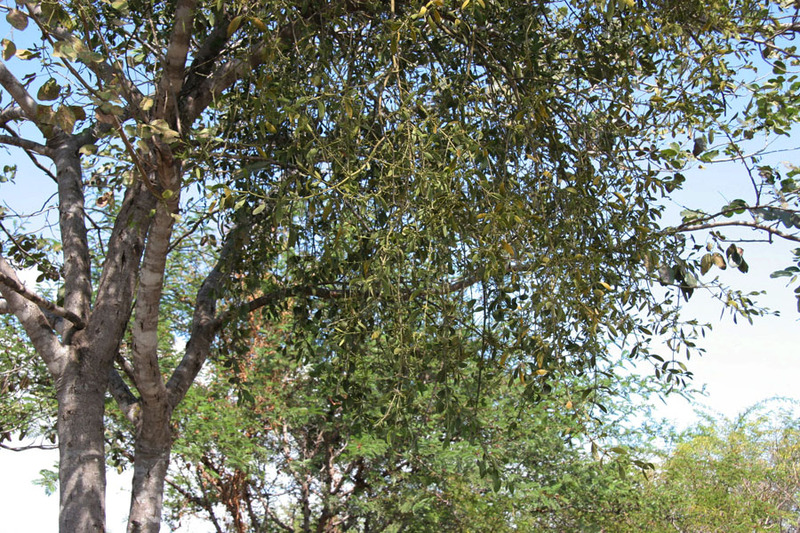 Photo 1 showing habit in host tree (Caesalpinia) and Photo 2 flowering shoots. Possibly this species. Along Carretera Panamericana between Ciudad Darío and Sebaco, near Las Tunas, Matagalpa, Nicaragua. W. D. Stevens and O. M. Montiel J. no. 26626. Link goes to TROPICOS. Photo. Flowering and fruiting shoots. 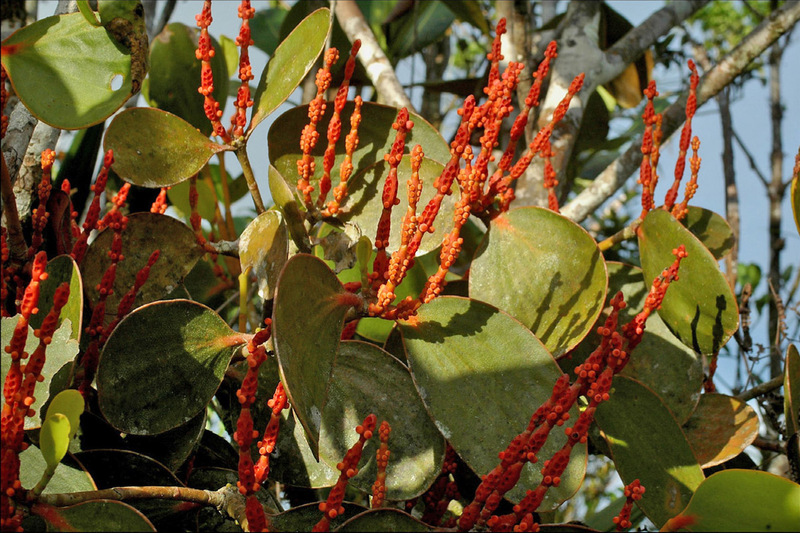 From Atlas of Florida Vascular Plants, Wildflowers of the Everglades. Photo by Roger Hammer. Photos. From Peru. Link goes to Atrium. Photo. 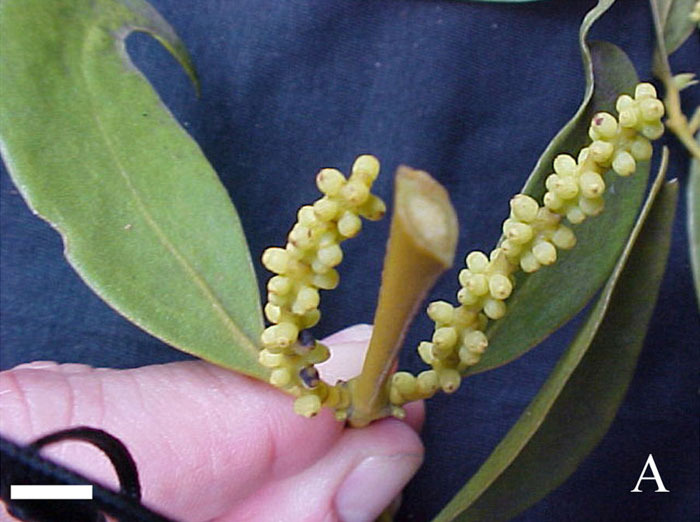 Inflorescence with young developing fruits. Parque Estadual da Serra das Andorinhas / Martiros e da APA Sao Geraldo do Araguaia, Brazil. Photo by André Cardoso. Link goes to Flickr. Photos. Fruiting shoot. The alveolar rims are quite expanded, like in P. annulatum but that species is not recorded from Bolivia. Santa Cruz, Vallegrande, Bolivia. Parada et al. 2859. Link goes to TROPICOS. Series of photos. Bahia, Brazil. Photos by Alex Popovkin. Link goes to Flickr. Photos. 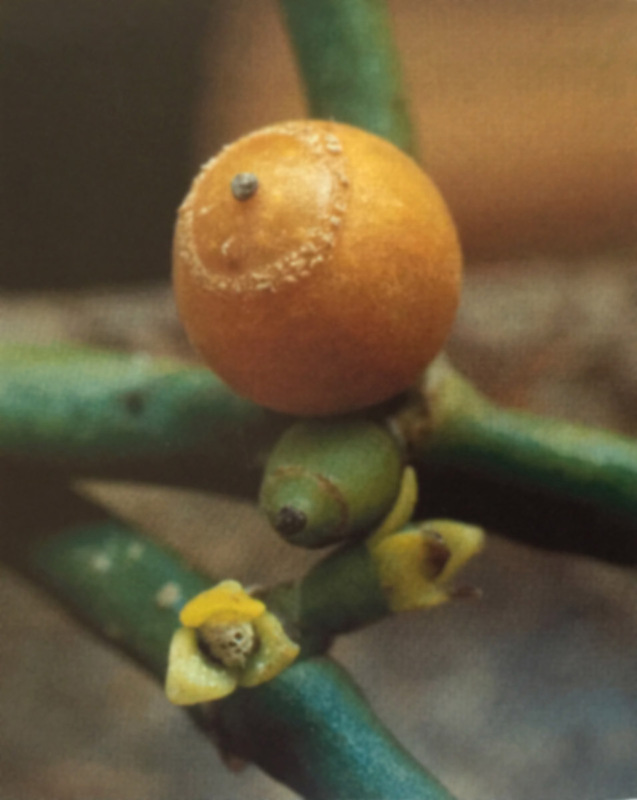 Excellent photos of fruiting plants in Costa Rica by B. Hammel (22446). Link goes to TROPICOS. Photo. Fruiting shoots, parasitic on Tecoma stans. Madriz, Nicaragua. Stevens & Montiel 26731. Link goes to TROPICOS. Photos. Fruiting shoots. Boaco, Nicaragua. Stevens & Montiel 31808. Link goes to TROPICOS. 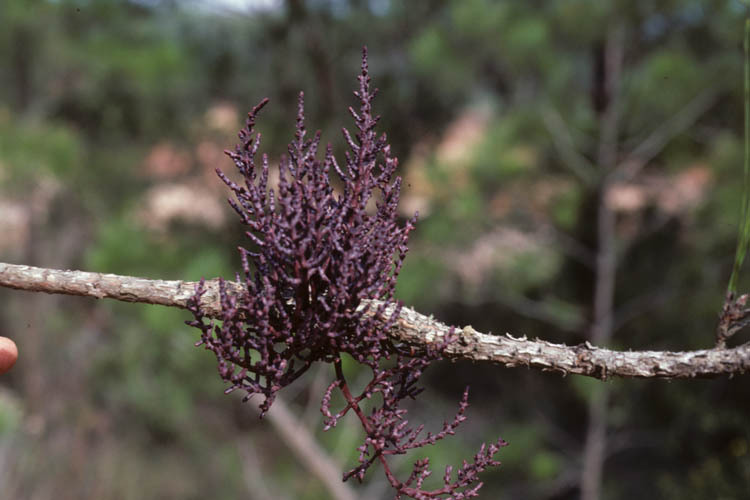 Photo of fruiting plant. Zapotitlan, Mexico. Photos by Art Vogel (originally in Picasa web album). Photo. 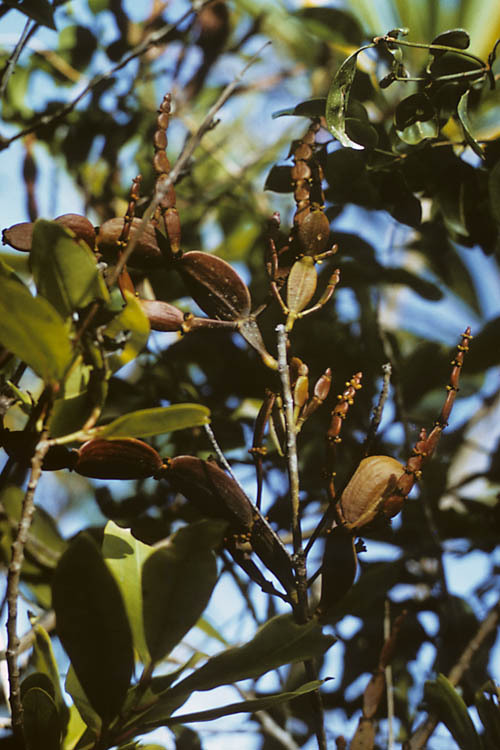 Young female inflorescences. Photo by Pedro Juárez (PJ612). As P. piperoides. Link goes to Neotropical Live Plant Photos. Photos. 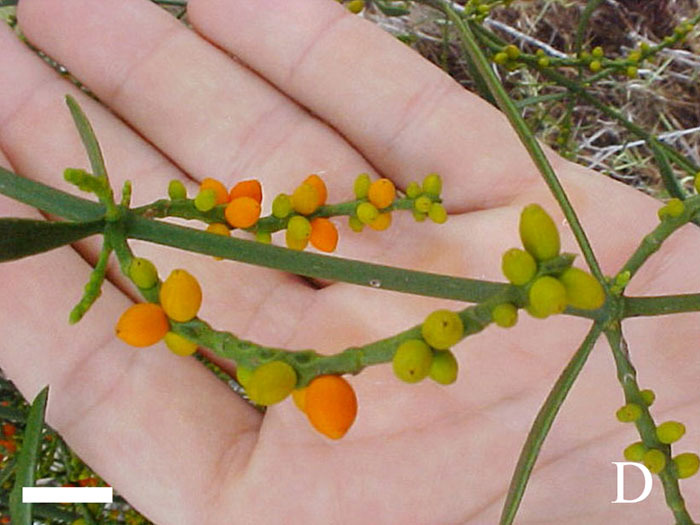 Series of photos of female plant with immature fruits. Costa Rica. Link goes to PhytoImages. 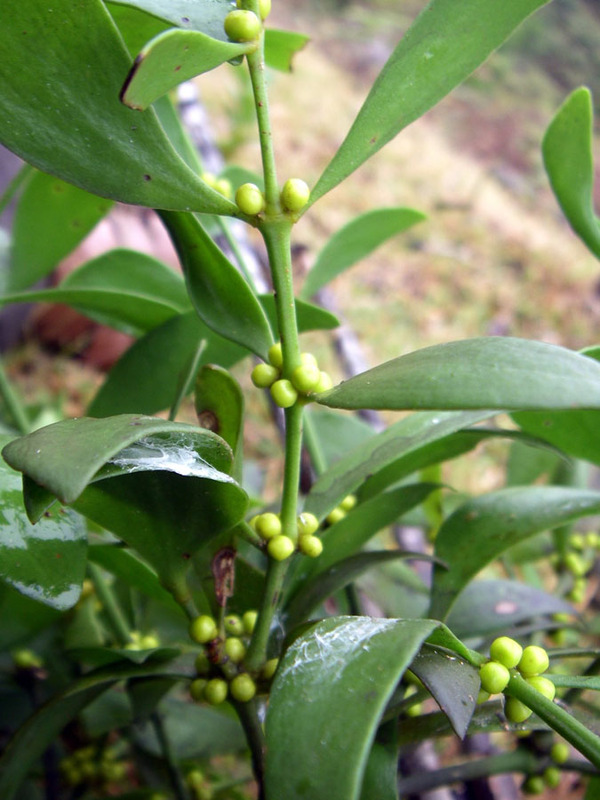 Photo Habit of mistletoe (bar = 1.5 cm). From Reif (2007). English translation of the thesis available HERE. Photo. Spikes with flowers. Bolivia. A. Fuentes et al. (4522). Link goes to TROPICOS. Photo. Fruiting shoot. Panama. Monro (4497). Link goes to TROPICOS. Photo. 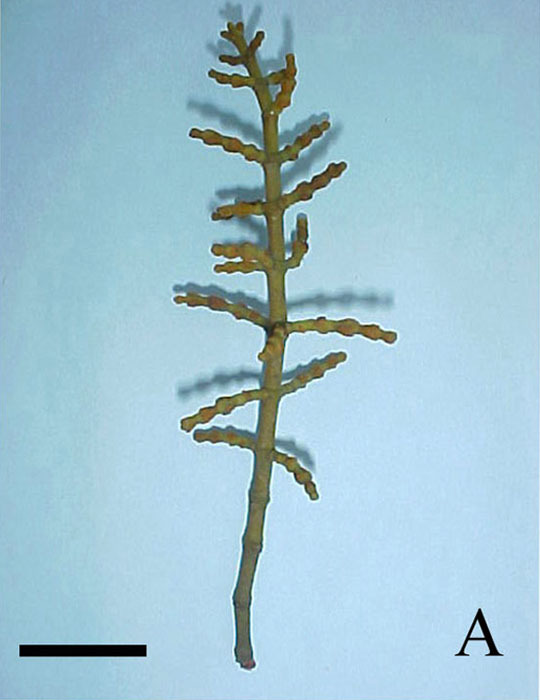 Fruiting branch, sectioned at the ancipital internode (bar = 1 cm). From Reif (2007). English translation of the thesis available HERE. Photo. Branchlet with sheathing cataphylls evident (arrow) (bar = 1.5 cm). From Reif (2007). English translation of the thesis available HERE. Photo . 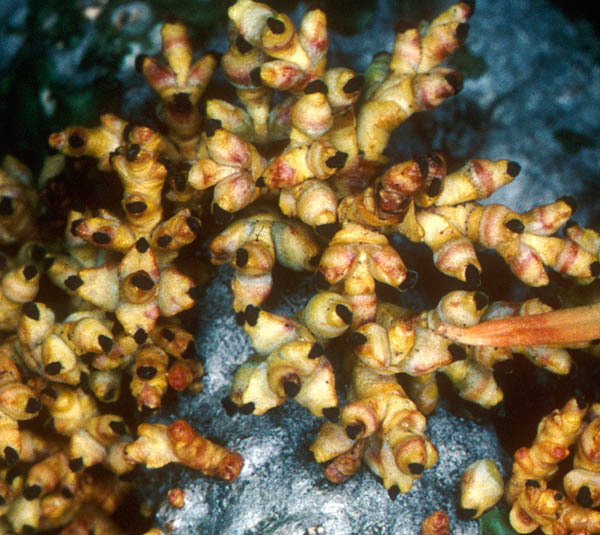 Close-up of the fruiting spike (bar = 5 mm). From Reif (2007). English translation of the thesis available HERE. Photos. Hacienda Tapezco-Hda. La Suerte, Limon, Costa Rica. Photos 22 Aug. 1979 by C. Davidson. Link goes to Flora of the World. Photo. Zappi, D.C. 2503 - Brazil: Minas Gerais. 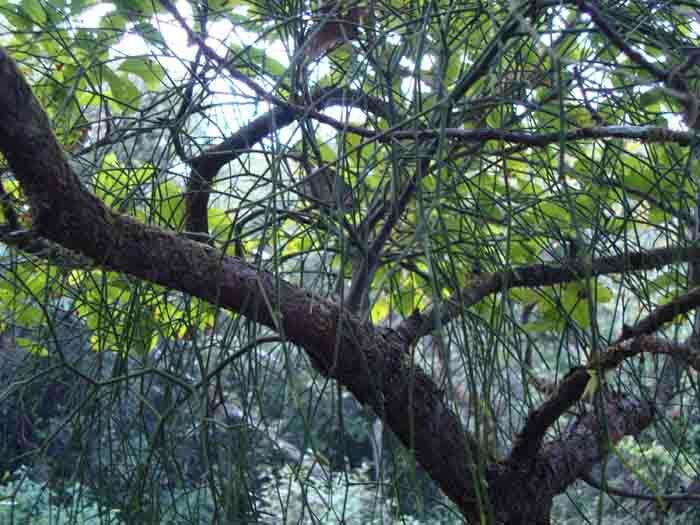 Link goes to Neotropical Plants image database at Kew. Photos. A nice series of photos of this species from Kern Co., CA. Photos by Dennis Stevenson. Link goes to PlantSystematics.org. Photos. Fruiting shoot. Original ID P. crassifolium (Kuijt 2011). Bocas del Toro, Panama. Monro & Alfaro 4371. Link goes to TROPICOS. Photo Near Boca Limon, NW of San Vito, Costa Rica. The parasite has nearly taken over the entire host tree! Photo by D. L. Nickrent. Photo Perú. From Neotropical Live Plant Photos. Photo ID 14419. Photo by Robin Foster. Photo Perú. From Neotropical Live Plant Photos. Photo ID 14402. Photo by Robin Foster. Photo 1 of shoots with young fruits and Photo 2 a close-up from that photo. Along Carretera Panamericana between Ciudad Darío and Sebaco, near Las Tunas, Matagalpa, Nicaragua. W.D. Stevens & O.M. Montiel J. 26628. 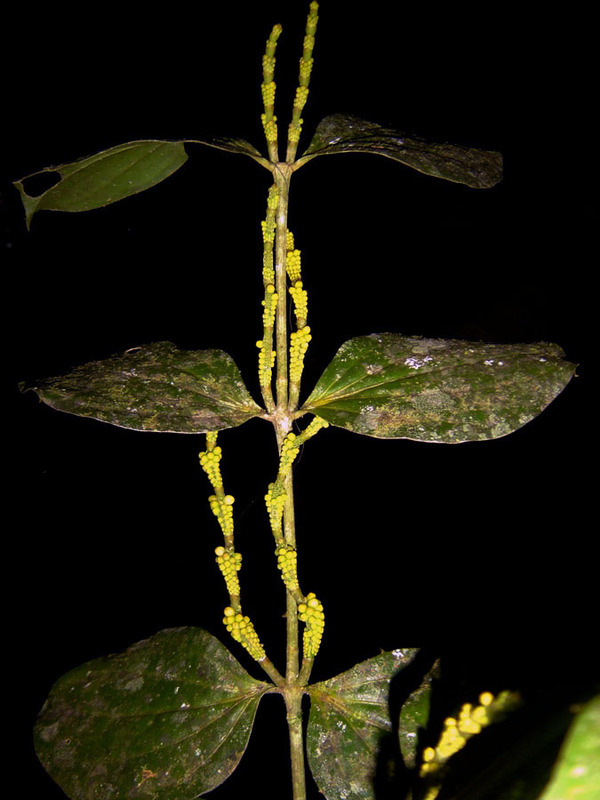 Differs from P. mucronatum and P. rigidifolium in several features; thus a new species? Link goes to TROPICOS. 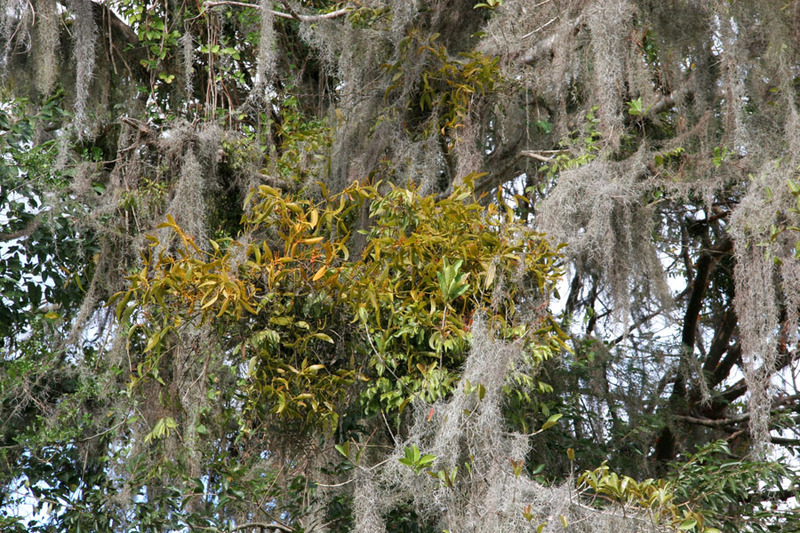 Photo 1 showing mistletoe in epiphyte-covered Ficus and Photo 2 of infructescence. Along road to San Marcos from Jinotega to San Rafael del Norte highway, 2 km from highway, Jinotega, Nicaragua. W. D. Stevens and O. M. Montiel J. no. 27765. Link goes to TROPICOS. Photo. Inflorescences. Parasitic on Cordia alliodora. 7 km NNE of Cuapa along road toward Muy Muy, Chontales, Nicaragua. W. D. Stevens & O. M. Montiel J. no. 27988. Link goes to TROPICOS. 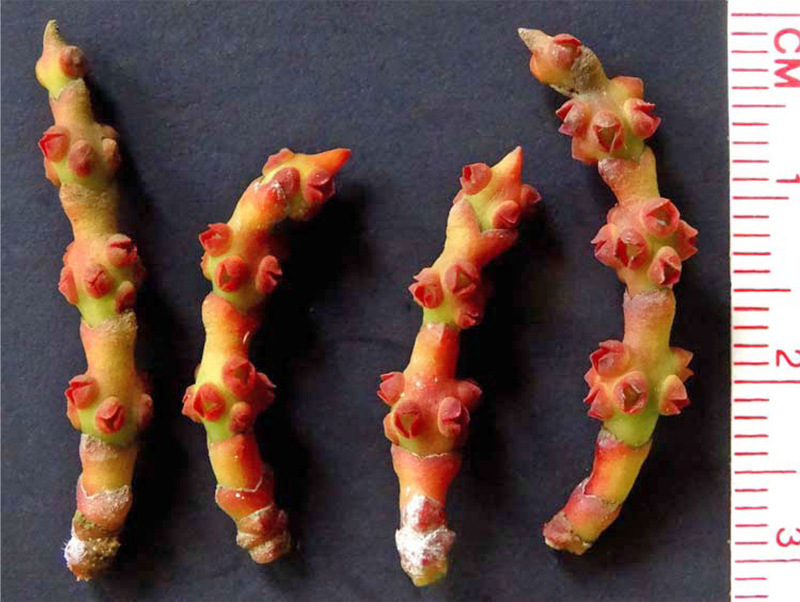 Photos 1 and 2 of flowering shoots (some with young fruits) and photo 3 of fruiting shoots. Compare with P. brittonianum and P. pteroneuron. Bolivia. A. F. Fuentes Claros et al. no. 5592. Link goes to TROPICOS. Photos. 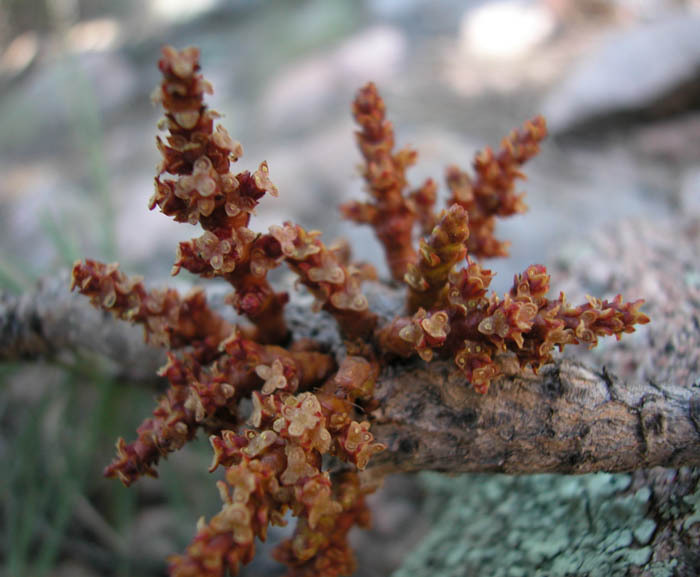 The Vasquez 33123 and Neill 15884 are Dendrophthora. 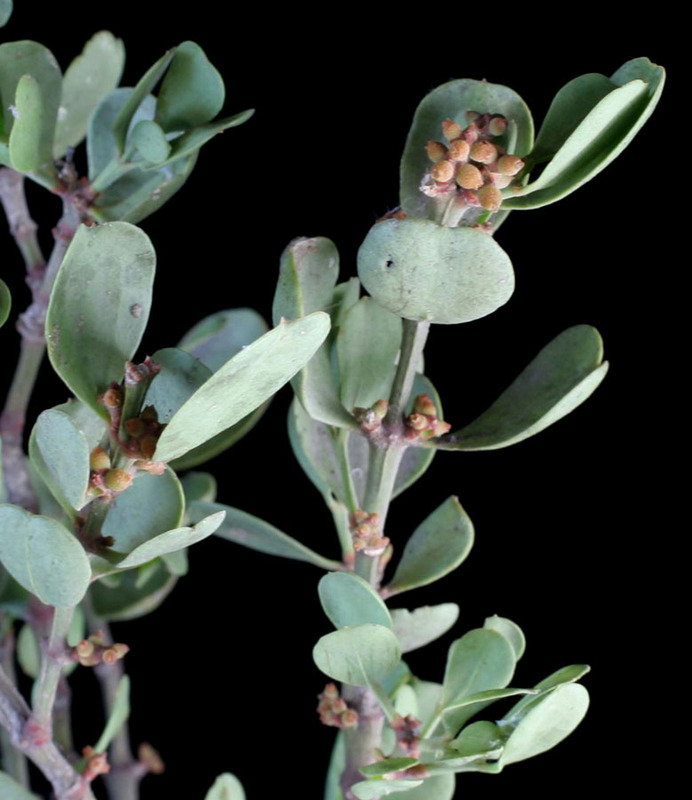 Others are Phoradendron. From Mexico and Peru. Photos by C. Davidson. Link goes to Flora of the World. 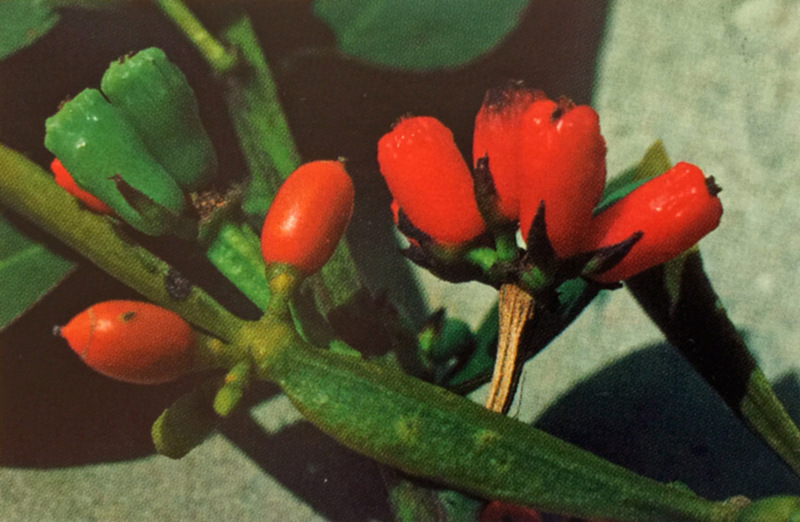 Photo Fruiting plant, from population introduced to California, USA. Photo by D. Wiens. Photo Several photos, including close-ups of the fruits. Link goes to BioImages: The Virtual Field-Guide (UK). Photos From Google Image search. 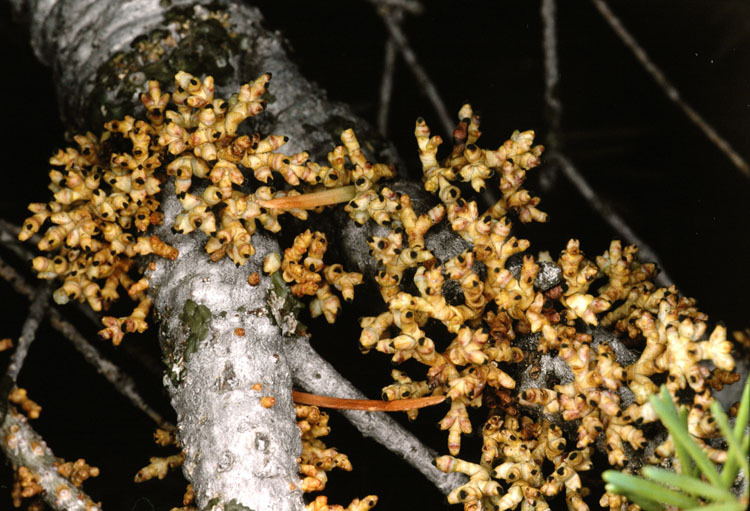 Photo Parasitic on Pinus sylvestris. Lower Austria. Photo by Gerhard Glatzel. 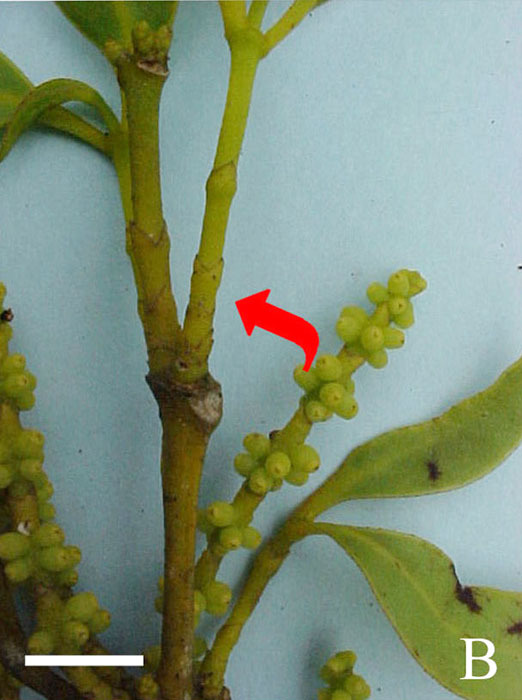 Photo of plant on host, Randia dumetorum (Rubiaceae) and photo showing closer view of shoots. Mahabaleshwar, India (Western Ghats). Photo January 2009 by R.B. Jadhav. Photo An endemic species, parasitic on Alnus, found in the central mountains at about 2000 m. Photo by J.-M. Hu, June 16, 1993. Nan-Tou, Taiwan. Photos. 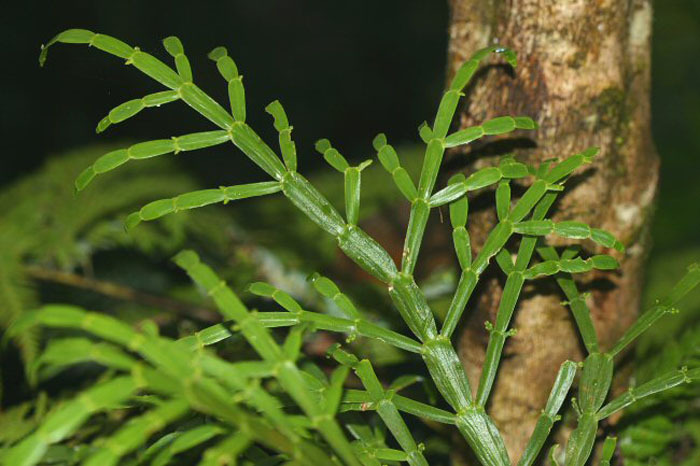 Nice close-ups of plant from Taiwan. Photos by Mingiweng. Link goes to Flickr. Photos. 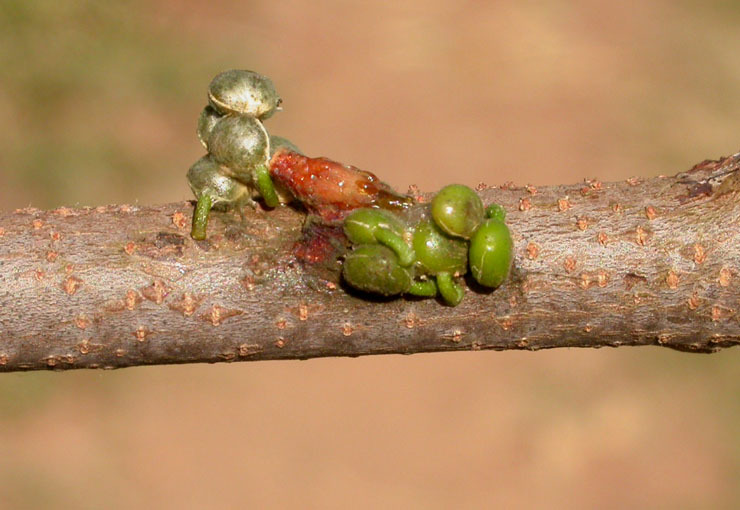 Parasitic on Zanthoxylum capense in South Africa. Link goes to iSpot Share Nature. 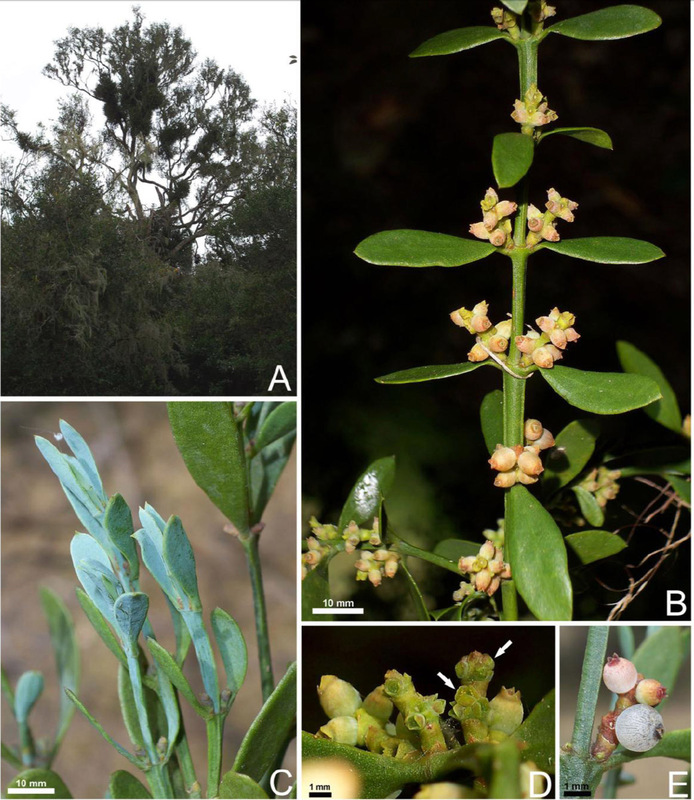 Photo of mistletoe habit on host branch with Dendrophthoe homoplasticum, photo of shoot, photo of flower and photo of fruits. From Australian Mistletoes by Bryan Barlow. 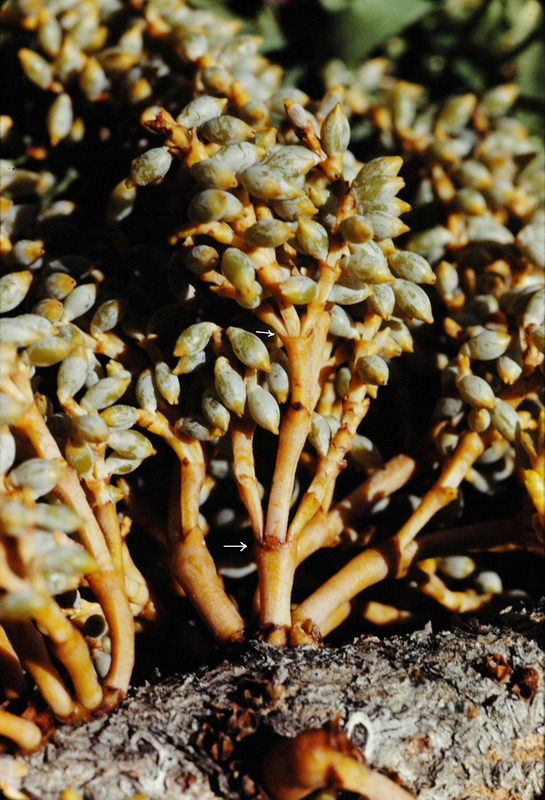 Photos Link goes to Australian Parasitic Plants by Roger Fryer and Jill Newland. Photo. Fruiting shoot on host branch. Maharashtra, India. Photo by Prashant Awale. Link goes to Flowers of India. Photos. Link goes to Subject Database of China Plant. 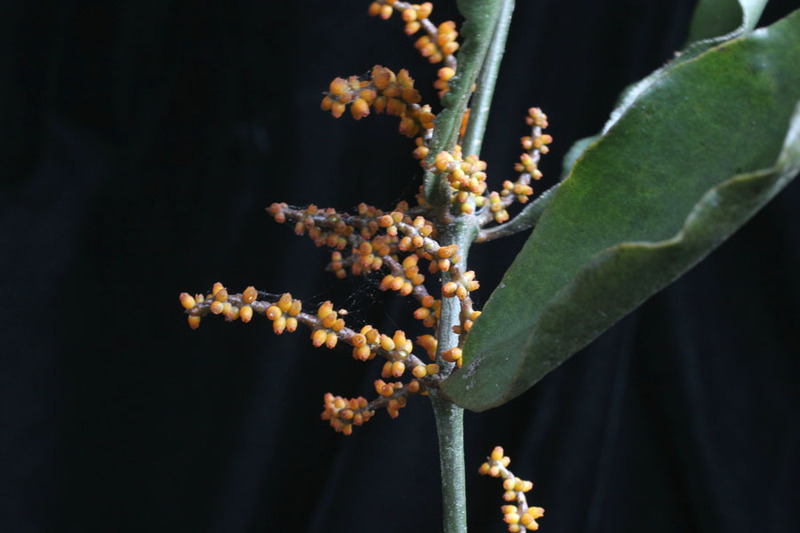 Photo of male flowers and fruits by M. G. Gilbert. 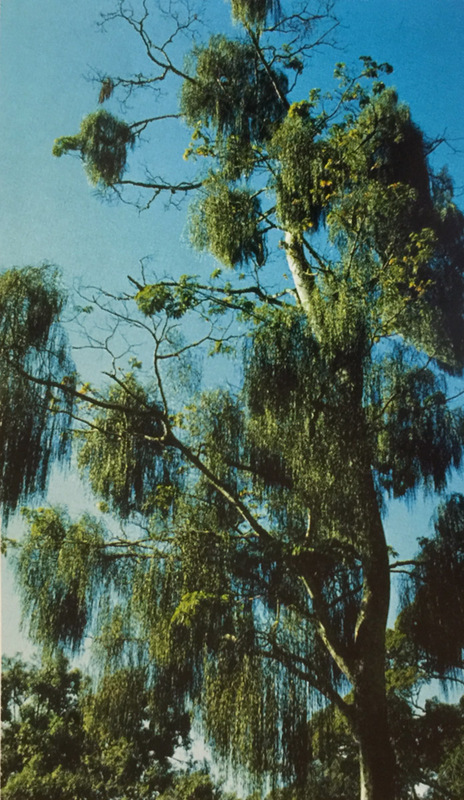 From Polhill & Wiens (1998) "Mistletoes of Africa". Photos. 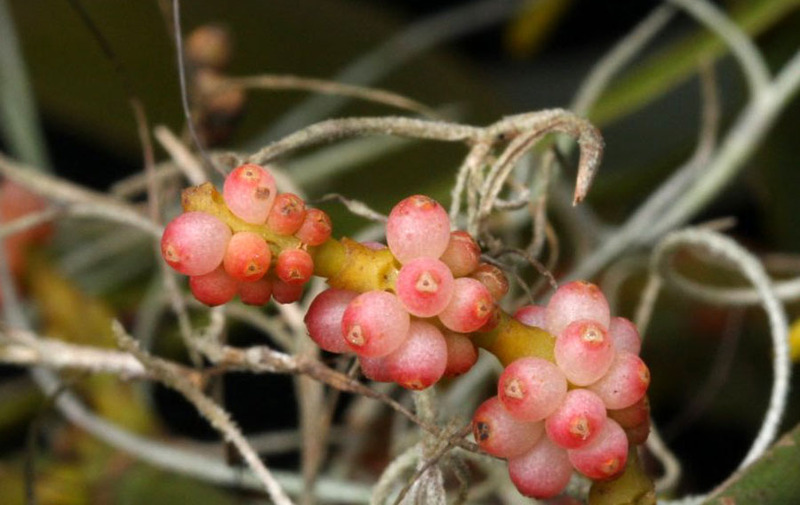 Female plant with young fruits. Original ID V. myriophlebium. But note presence of three main veins (not many small ones), and grouping of up to three flowers per peduncle. Madagascar. Link goes to Conservatoire et Jardin Botaniques Ville de Geneve. 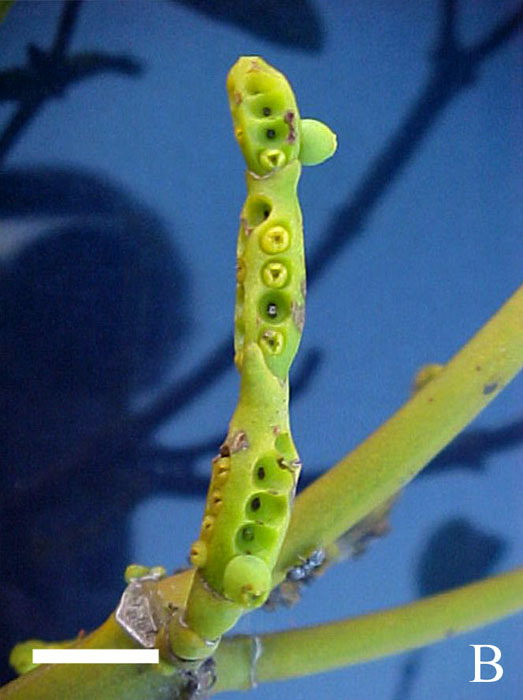 Photo of plant with unripe fruits and seeds forming haustoria on host. 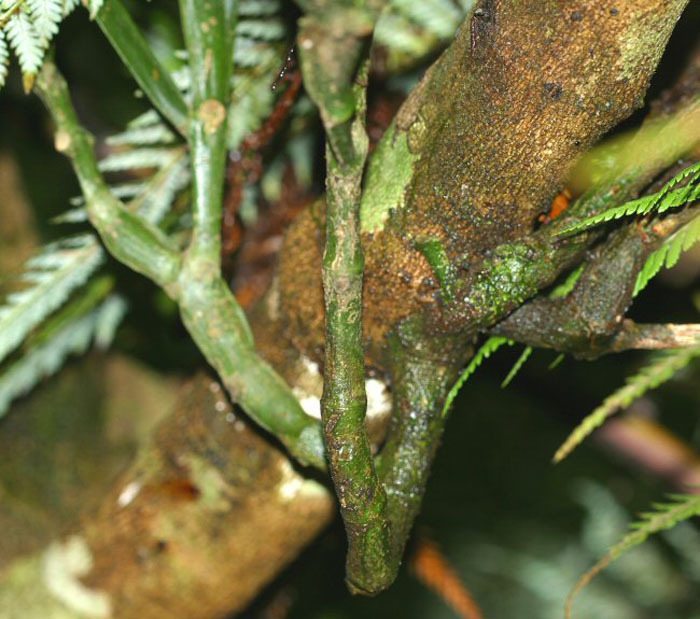 Epiparasitic on Dendrophthoe falcata which was itself parasitic on Mangifera indica. Western Ghats, India. Photos by R. B. Jadhav. Photos. Jilin Shirakawa street, China. Photo by Xuke Xue. Link goes to PlantPhotoBank.cn. Photos. As V. alni-formosanae. Link goes to Flickr. Photos. Series of photos, from Zimbabwe. Link goes to Flora of Zimbabwe. Photos. Eastern Cape, South Africa. Photos by C. Davidson. Link goes to Flora of the World. Photos. 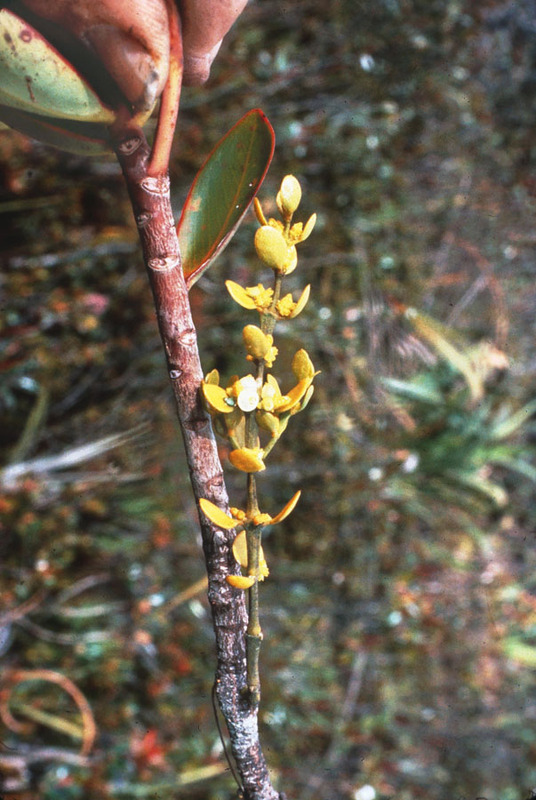 Female plant in full flower. Madagascar (Antilahimena - 8350). This Viscum has an almost showy flower! Link goes to TROPICOS. Photo Shoot with young fruits. Specimen unidentified. Madagascar. A. Razanatsima et al. no. 274. Link goes to TROPICOS. Photos. 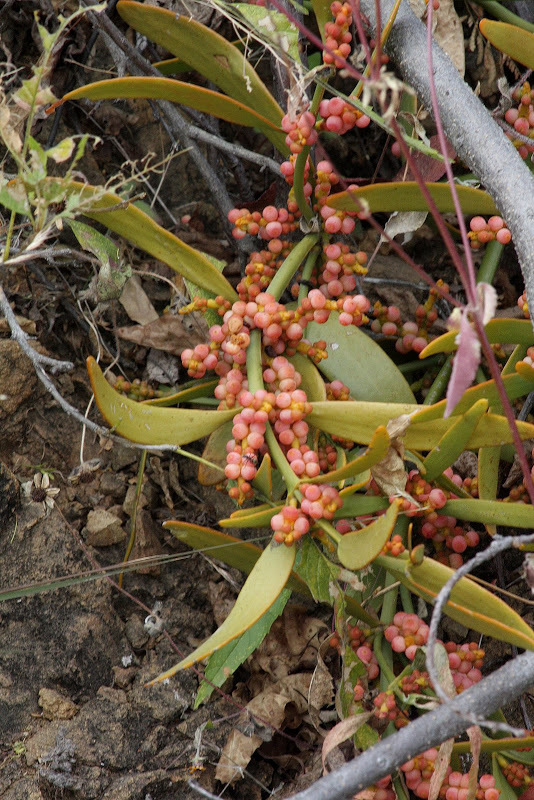 Plant with young fruits. Fianarantsoa, Vatovavy-Fitovinany, Madagascar. Photos by C. Davidson. IDed as V. multiflorum but that species lacks a bibracteal cup and has single, not grouped flowers. Link goes to Flora of the World. Photos Fujian, Hu Bo Liu, China. Photo by Xuke Xue. Link goes to PlantPhotoBank.cn. 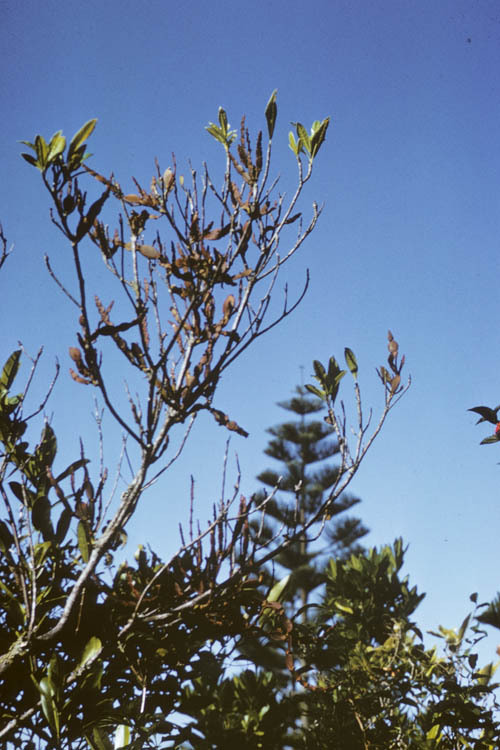 Photo, habit of plants in host tree and fruits, by Del Wiens. 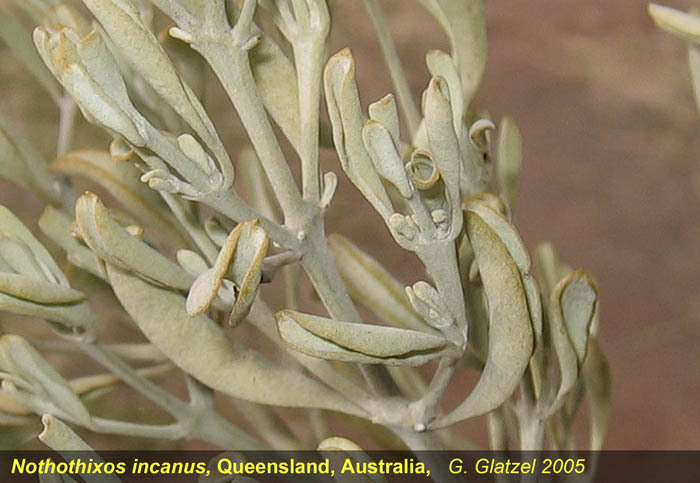 From Polhill & Wiens (1998) "Mistletoes of Africa". Photo. Link goes to Wikimedia Commons. Photos. Madagascar. Link goes to TROPICOS. Photo. Shoot with female flowers. Possibly this species. Madagascar. Callmander 641. Link goes to TROPICOS. 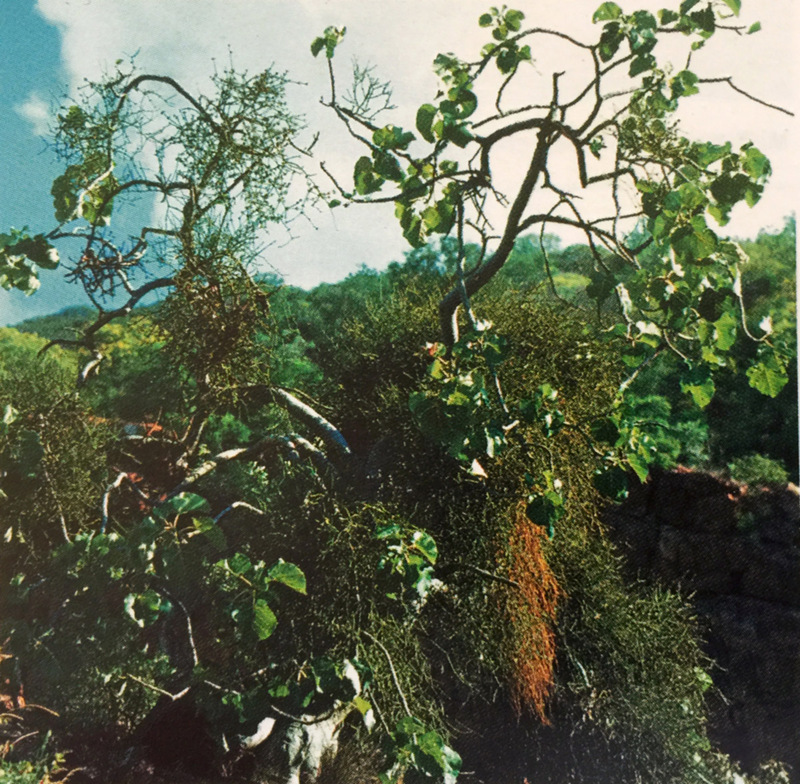 Photo, habit of plants in host tree and fruiting shoot, by Del Wiens. 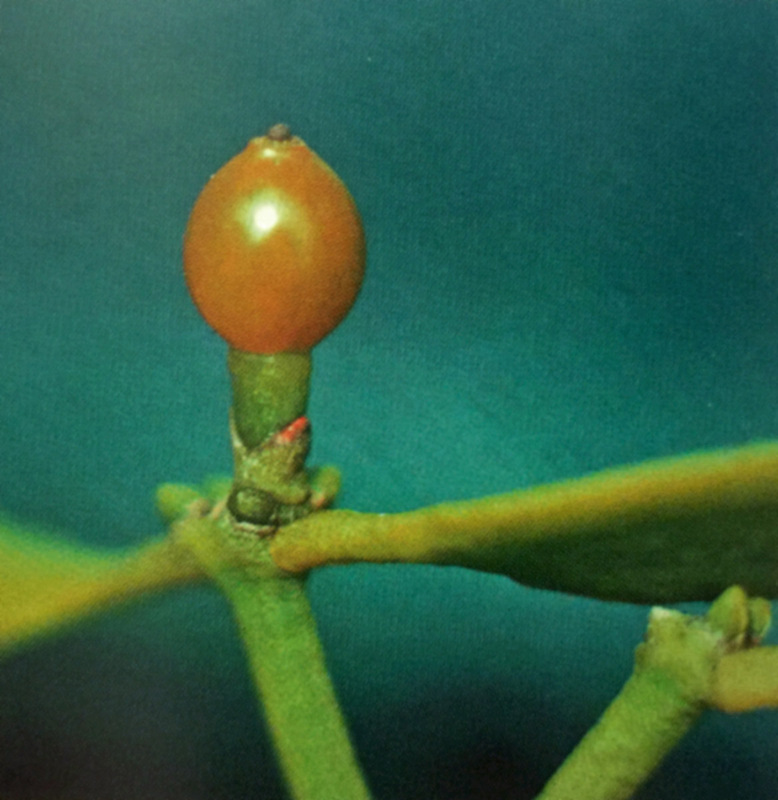 From Polhill & Wiens (1998) "Mistletoes of Africa". Photo Plant in fruit. On Euphorbia sp. Photo by J. Mauseth. Photos. Madagascar. Link goes to PhytoImages. Photos. Plant with mature fruit. Madagascar. Callmander 422. Link goes to TROPICOS. Photos. This plant, unidentified to species, could be V. multiflorum. Madagascar. P. Antilahimena 7834. Link goes to TROPICOS. Photos. 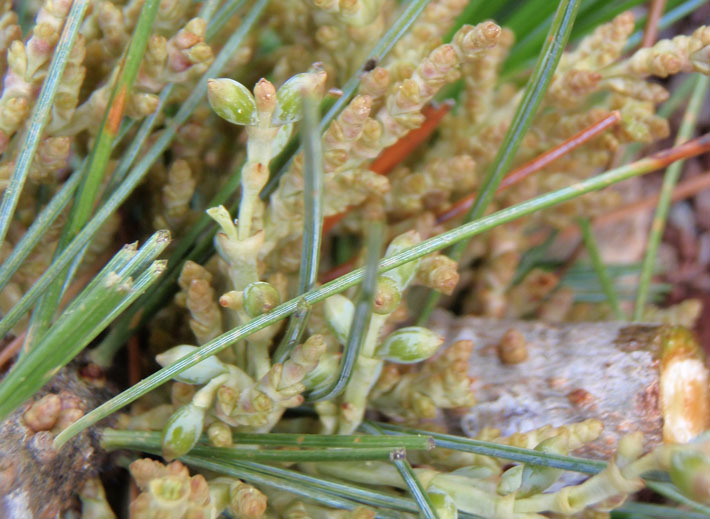 Close-up of leaf base and axil showing young inflorescence still covered in bud scales. Note presence of numerous leaf veins. Madagascar. Ravelonarivo Désiré 4555. Link goes to TROPICOS. Photos. 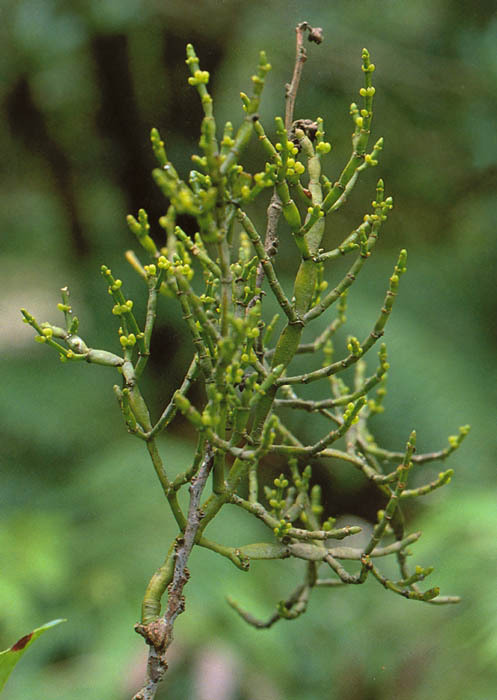 Plant with young inflorescence still covered in bud scales. Possibly V. myriophlebium var. 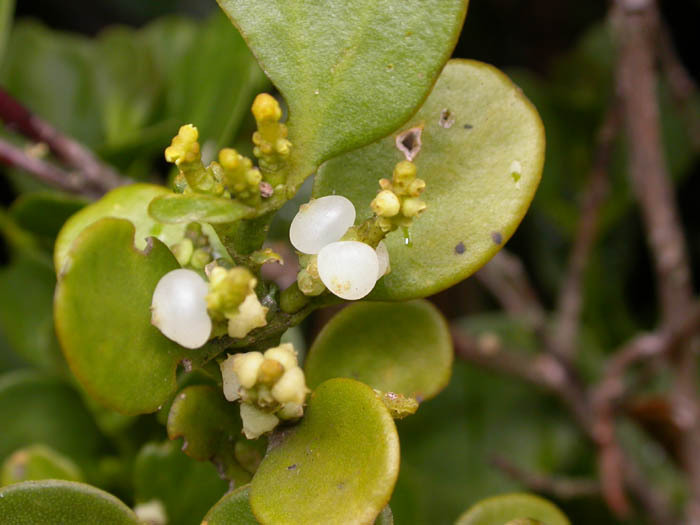 longifolium. Madagascar. Rakotoarivelo 189. Link goes to TROPICOS. Photos. Link goes to www.planta.cn NONFUNCTIONAL?. Photos. Western Cape, South Africa. Photos by C. Davidson. Link goes to Flora of the World. Photo. Fruits by Del Wiens. From Polhill & Wiens (1998) "Mistletoes of Africa". Photo. Fruit, by Del Wiens. 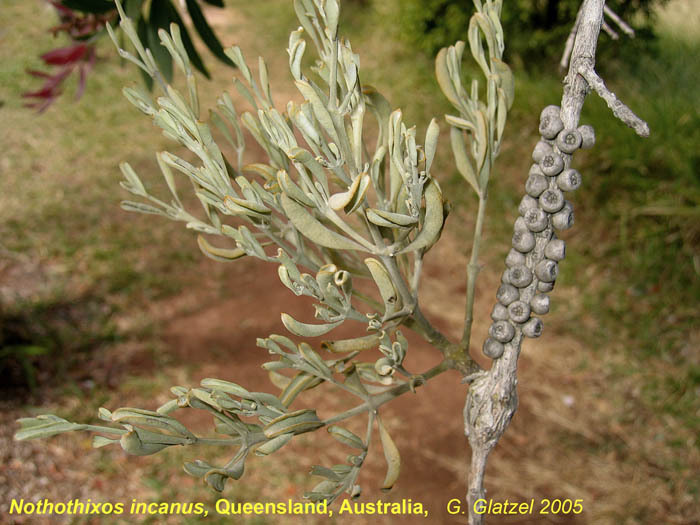 From Polhill & Wiens (1998) "Mistletoes of Africa". 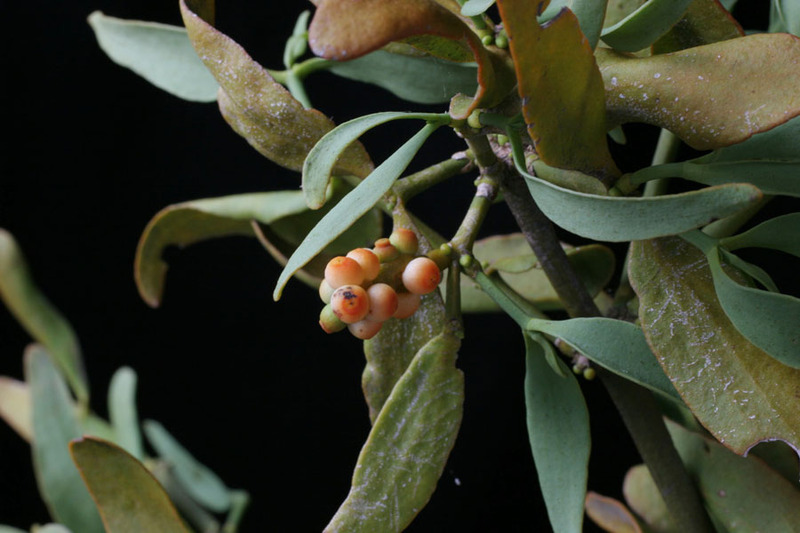 Photo of mistletoe with young fruits and photo of mature fruit. 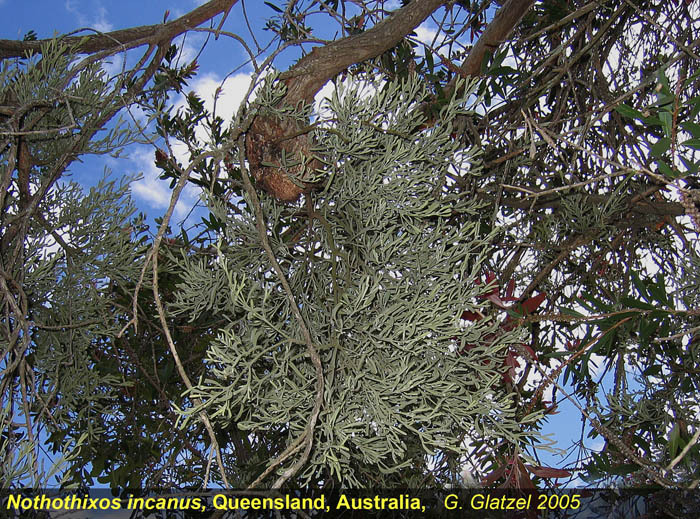 From Australian Mistletoes by Bryan Barlow. Photos. 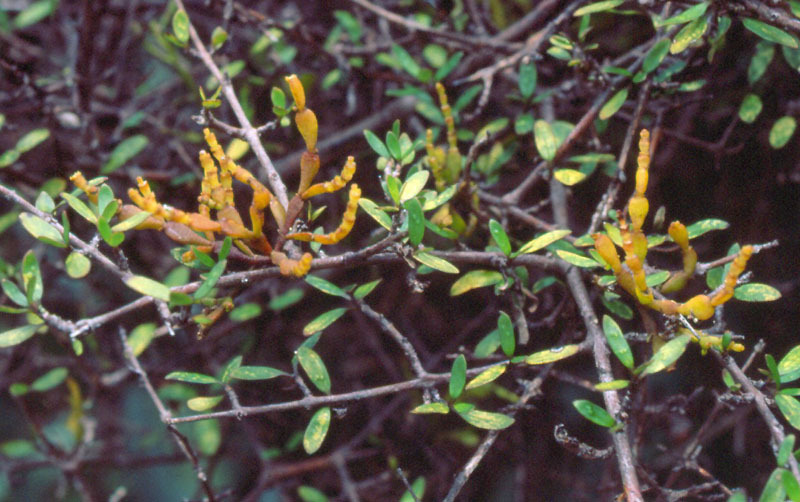 Parasitic on Euclea in Cape Region, South Africa. Link goes to iSpot Share Nature. Photos. 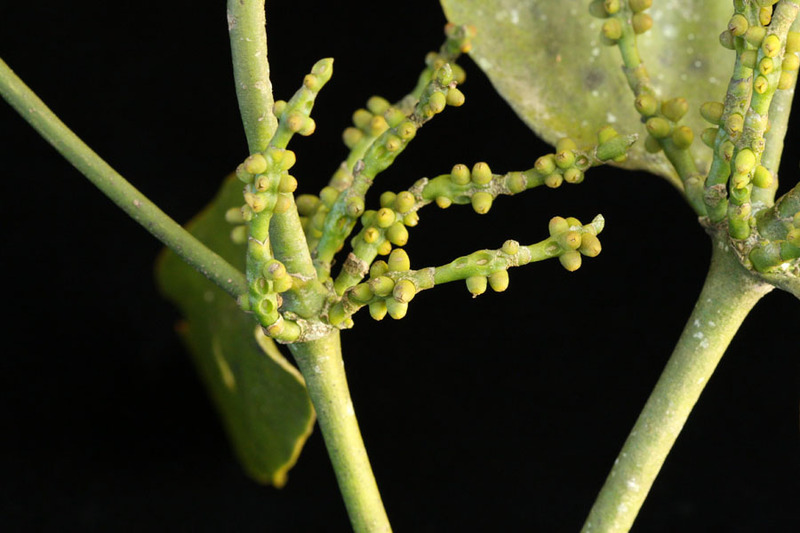 Female plant with flowers and young fruits. Madagascar. Rasoazanany 582. Link goes to TROPICOS. Photo. Fruiting shoot. Possibly this species. Madagascar. Rakotonirina 42. Link goes to TROPICOS. Photos. 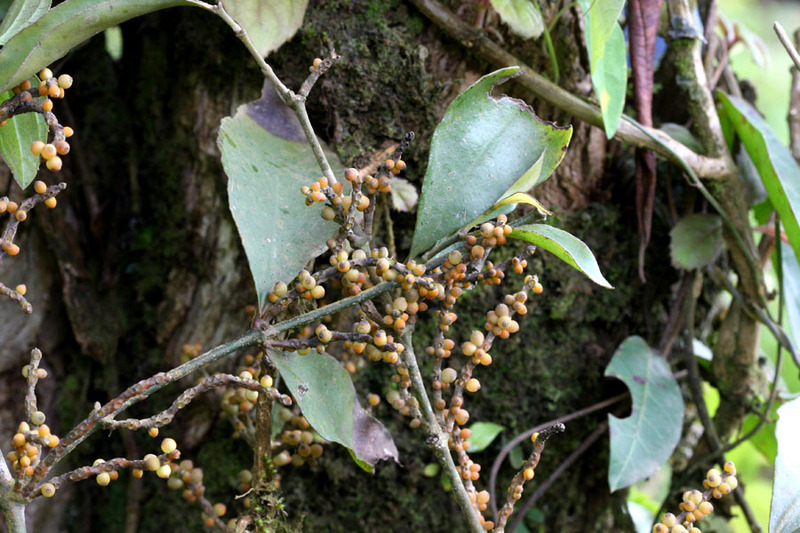 Plant with young fruits. Original ID V. multiflorum. 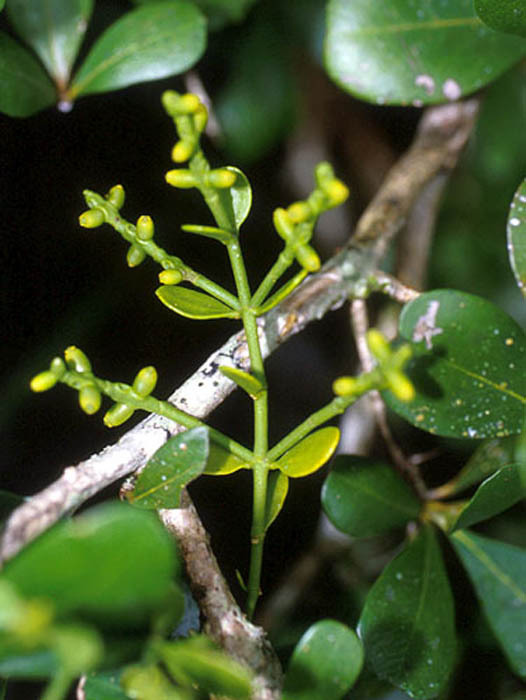 But that species does not have a bibracteal cup and its flowers are not grouped at the end of the peduncle. Madagascar. Callmander 629. Link goes to TROPICOS. Photos. 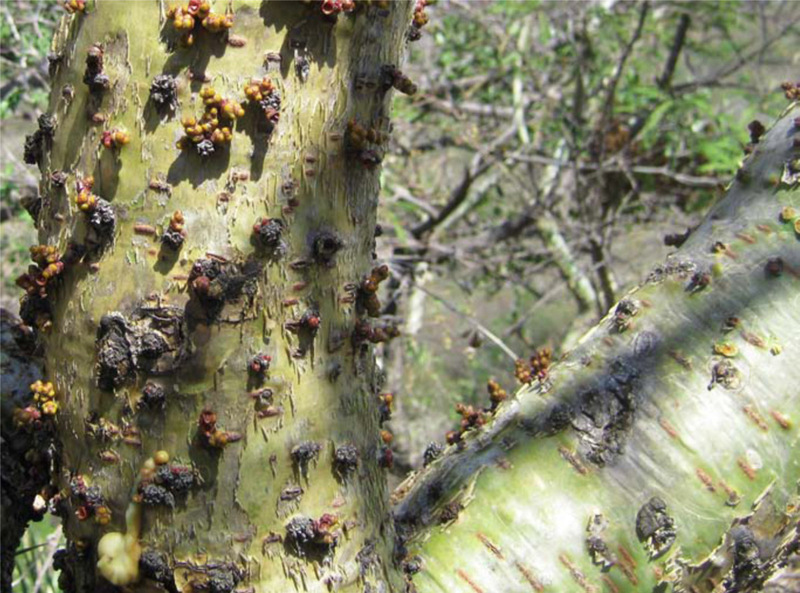 Parasitic on Boscia foetida in Namibia. Link goes to iSpot Share Nature. Photo. Fruits, by Del Wiens. 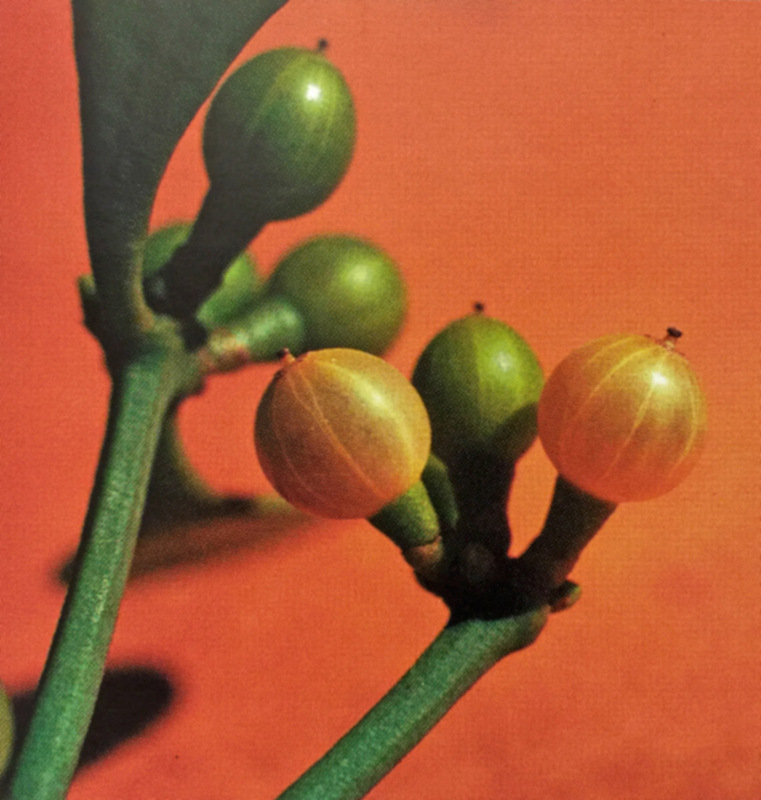 From Polhill & Wiens (1998) "Mistletoes of Africa". Photo Isotype. Link goes to TROPICOS. Photos. Series of photos. Link goes to West African Plants: A Photo Guide. Photos. Several species, including V. tuberculatum. Photos by C. Davidson. Link goes to Flora of the World. Photos. Series of photos. Link goes to Flora of Zimbabwe. Photos. Warty fruits. Along Fort Usher road, Matobo, Zimbabwe. Link goes to Flora of Mozambique. Photos. 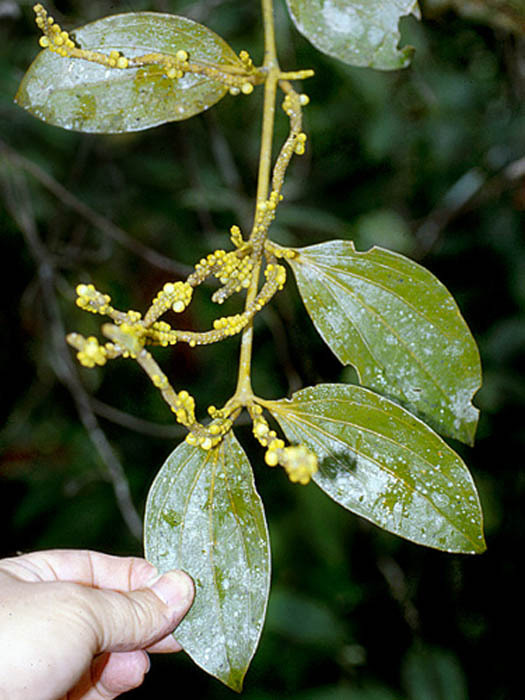 Stem with female flowers. Link goes to PICSSR. Photos. Plant with young fruits. Madagascar. Razakamalala 7647. 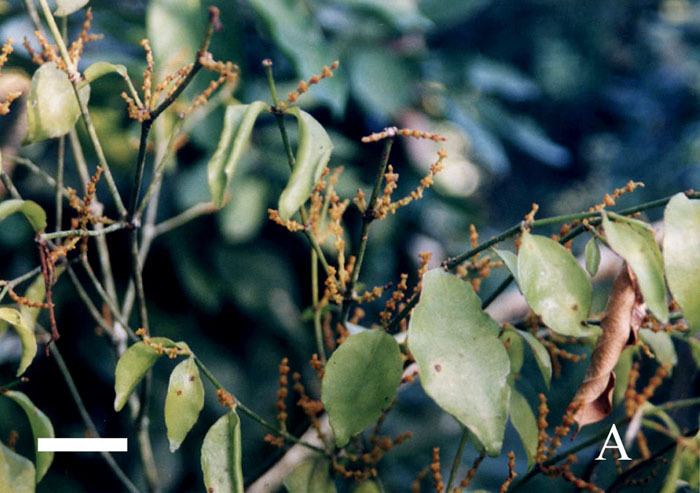 Listed as V. triflorum, but according to Halle (1964), this species does not occur on Madagascar but on the neighboring Comoros islands. This could be V. tsaifajaonense. Link goes to TROPICOS. Photos. 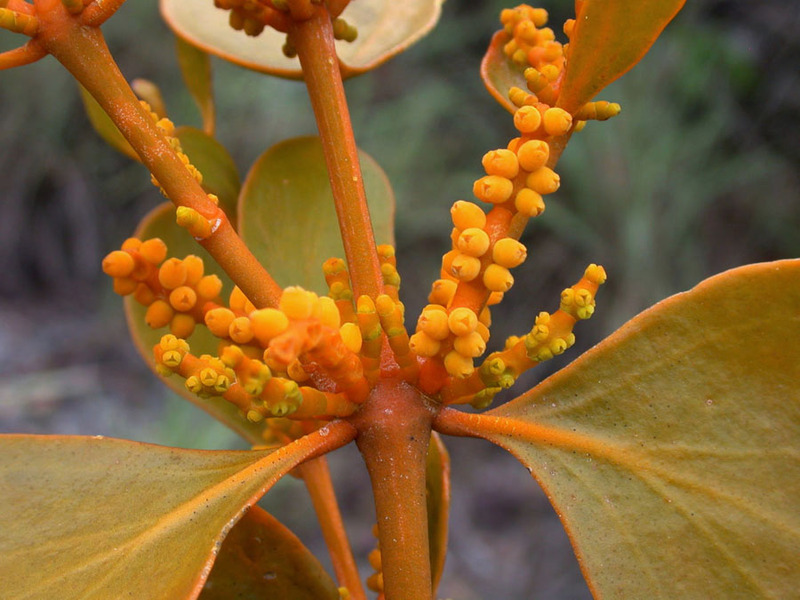 Close-up of inflorescence showing a male flower and young fruit. 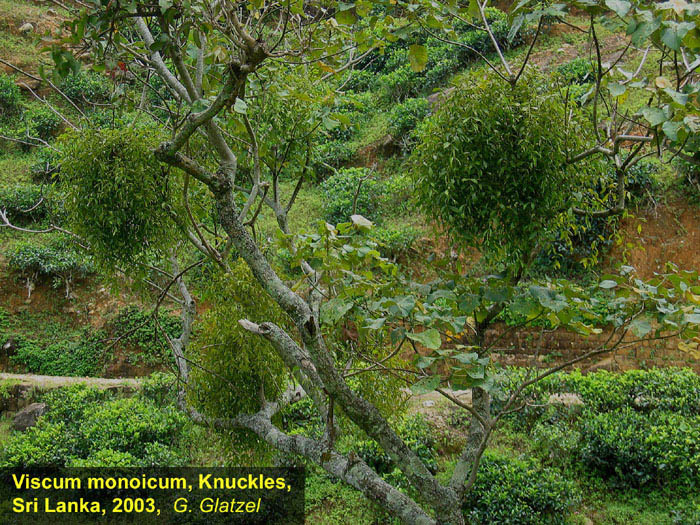 Because this plant is monoecious, it cannot be V. multiflorum as identified. The smooth fruit and what appears to be subcylindric stems places this (again) near V. tsaifajaonense. Madagascar. P. Antilahimena - 6129. Link goes to TROPICOS. Given that about one fourth of the ca. 120 species of Viscum occur in Madagascar, this country represents the second most diverse landmass following continental Africa for species diversity. 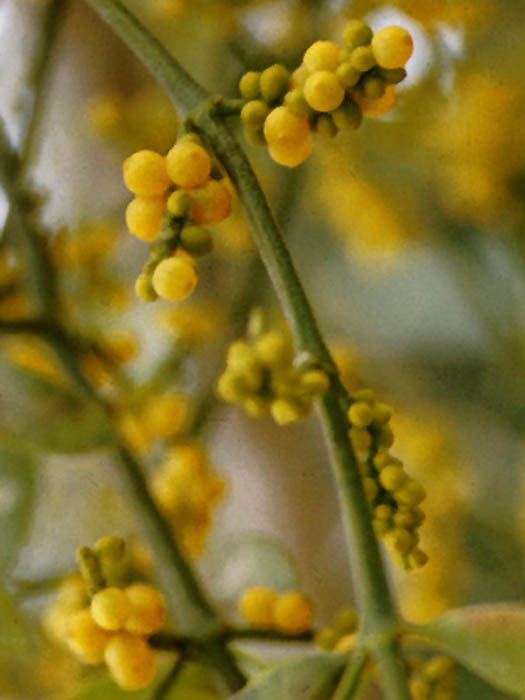 Halle (1964) provided a treatment for Viscum (under Loranthaceae) wherein 31 species were recognized. I translated her key from French to English and it is available HERE as a pdf file.